Since the weather forecast called for a mixture of snow and rain overnight, giving way to some sunshine shortly after dawn, I headed over to Lake Michigan again, hoping to shoot a few good photos of the waterfowl and whatever else I could find. 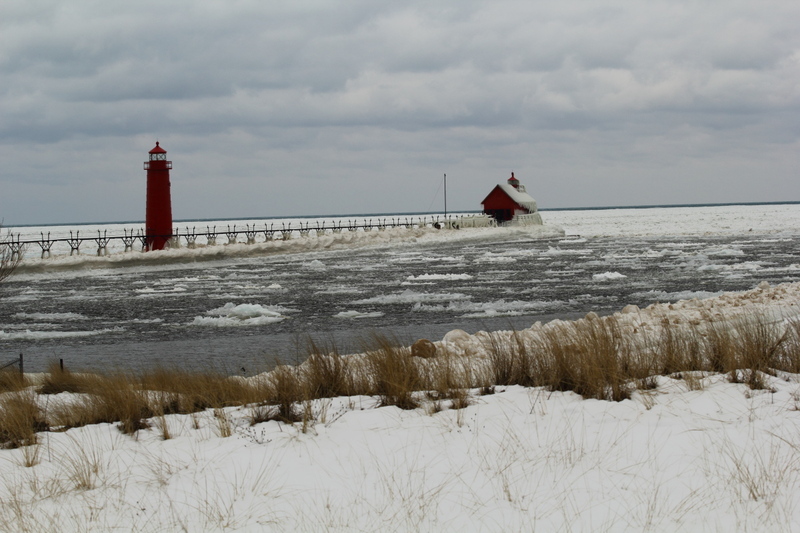 The forecast was correct in that I drove over to Grand Haven, my first stop of the day, in a rain/snow mix. 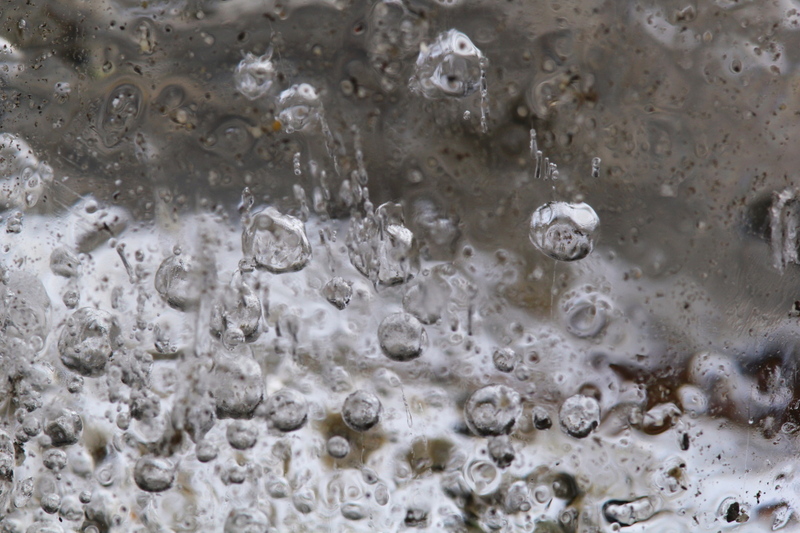 The precipitation did end about the time I arrived there, and it was just before dawn. 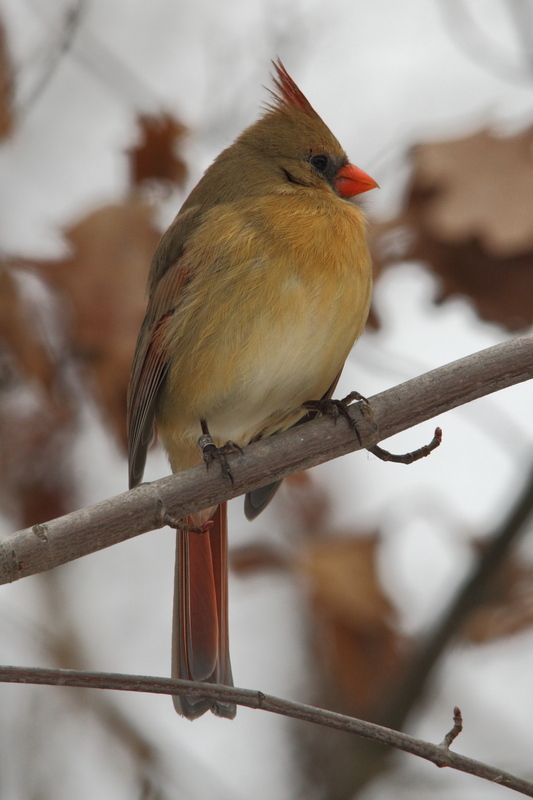 I parked in a city park on the south side of the Grand River channel that leads to Lake Michigan to see if I could spot any waterfowl, even though there wasn’t enough light to try any photos yet. 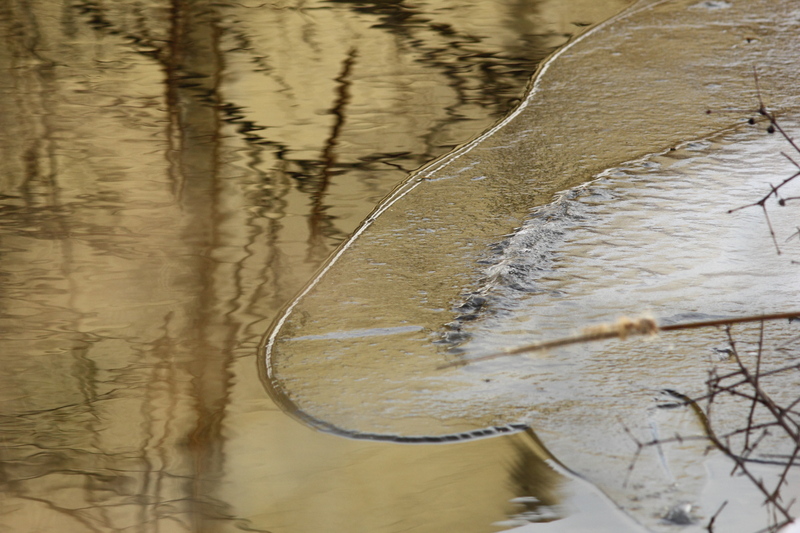 Silly me, I was sitting there viewing several rafts of ducks in the pockets of open water that were interspersed between packs of ice floating down the river. 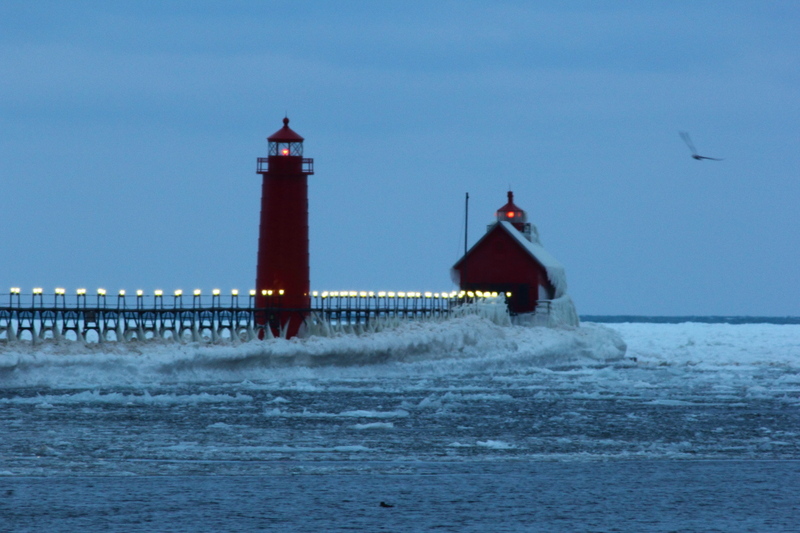 It was getting lighter by the minute, and as I thought of exiting my vehicle to see if there was enough light to photograph the ducks, I looked over to see that the walkway extending out to the lighthouse was still lit up. I could see that the rest of the city lights were turning off, so I quickly grabbed the camera that had the 300 mm prime lens and 1.4 X extender on it to shoot this. 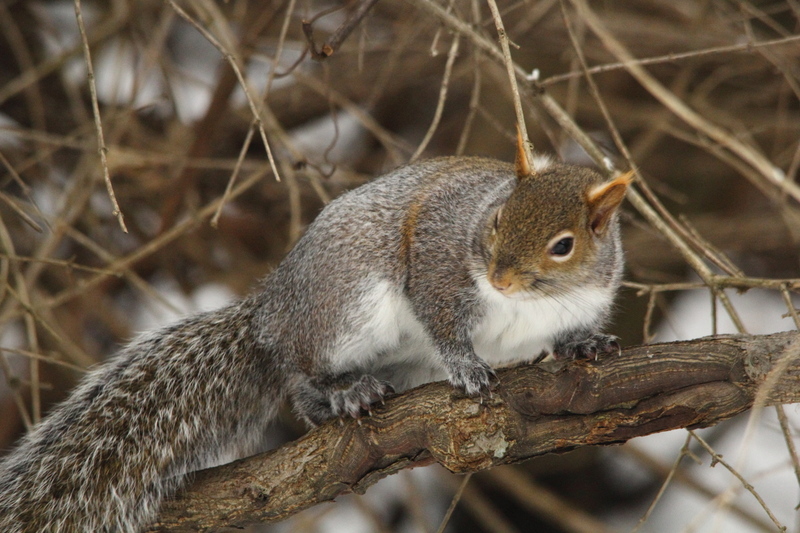 To make up for that shot, here’s one from later in the day, a grey, grey squirrel. 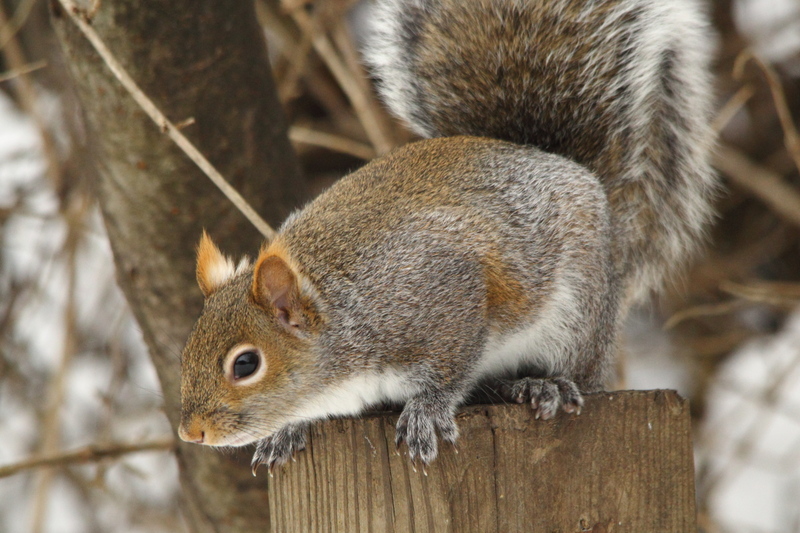 If you’re familiar with grey squirrels, you know that they have two color variations, the one seen here, and also, some are all black. 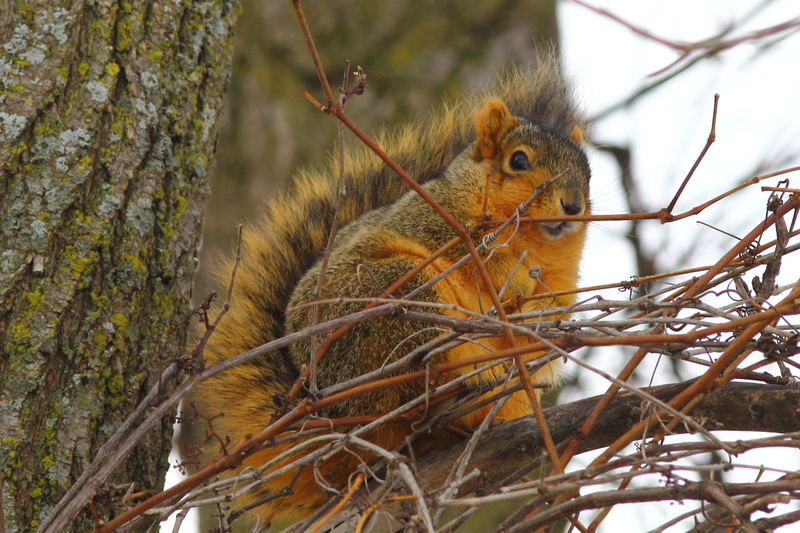 For years, I tried getting a good photo of a black grey squirrel with my old Nikon, but never did. I have shot several good images of the black ones with my Canon, however, it dawned on me that I had never tried for a good image of a grey one. Now I have. 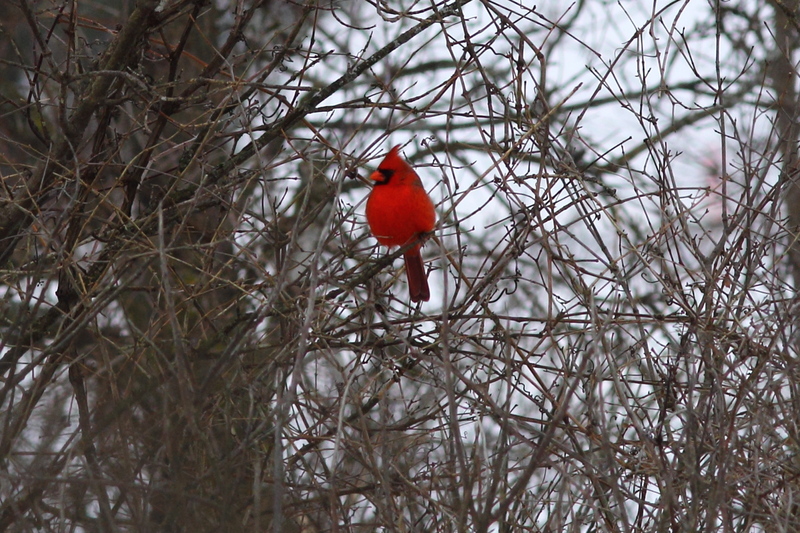 Well, at least as good as I could get in the low light of the day, since the sun never did burn through the clouds. So, the story from this day was editing the images I shot this day. For one thing, I learned how to make the noise reduction feature of the Canon Digital Professional Photo software function. In my earlier attempts, the software froze, and never did any noise reduction when I tried it. 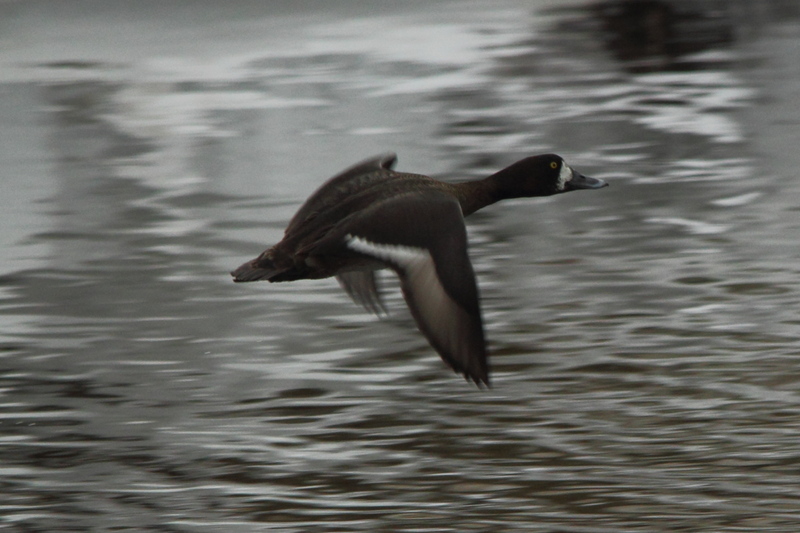 Since the light was so poor most of the day, I had to shoot at higher ISO settings, which of course resulted in a great deal of sensor noise in most of the waterfowl photos. 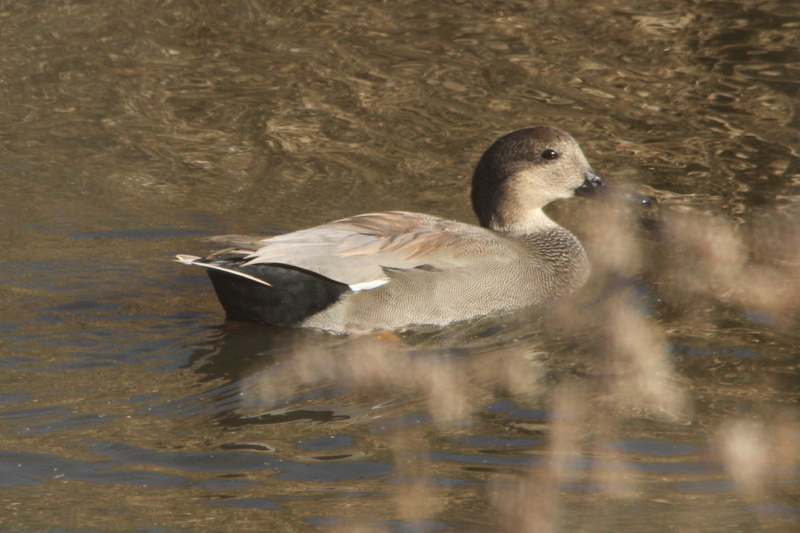 I also did a lot of tweaking to the exposures of most of the waterfowl and other photos from the day. While no software can make a silk purse from a sow’s ear, doing the editing of the images from the day made it so that the trip wasn’t a complete waste of time. I would have come home with just a handful of photos if I hadn’t edited these. Also, no amount of editing can make up for the lack of light. 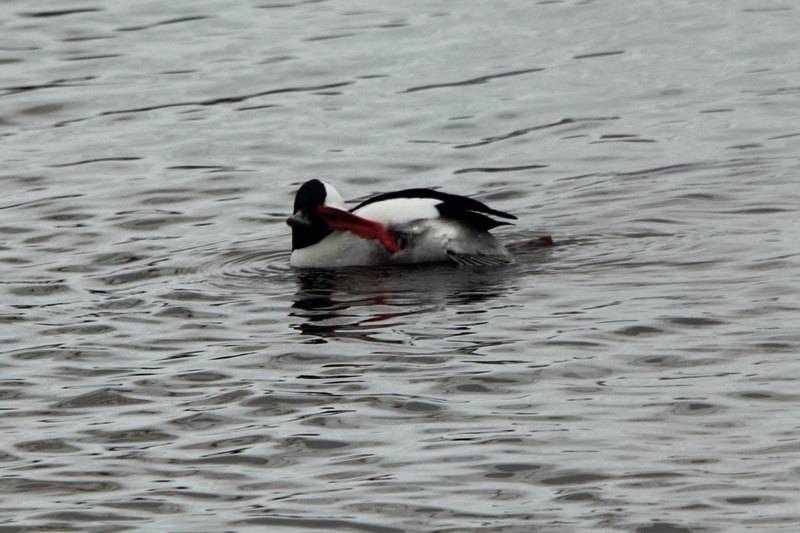 I shot this red-breasted merganser shortly after my failed attempt to get a good shot of the lighthouse. 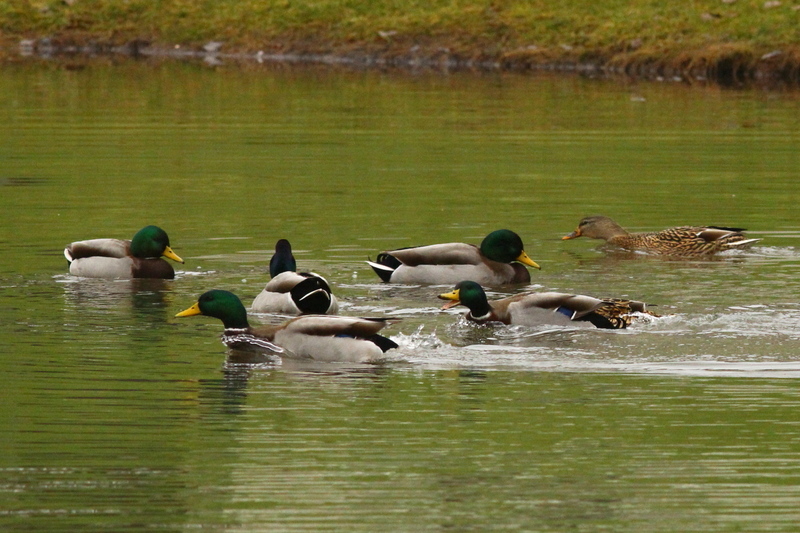 If only the darned waterfowl would hold still, I’d have a chance for a good photo. But, that’s seldom the case. 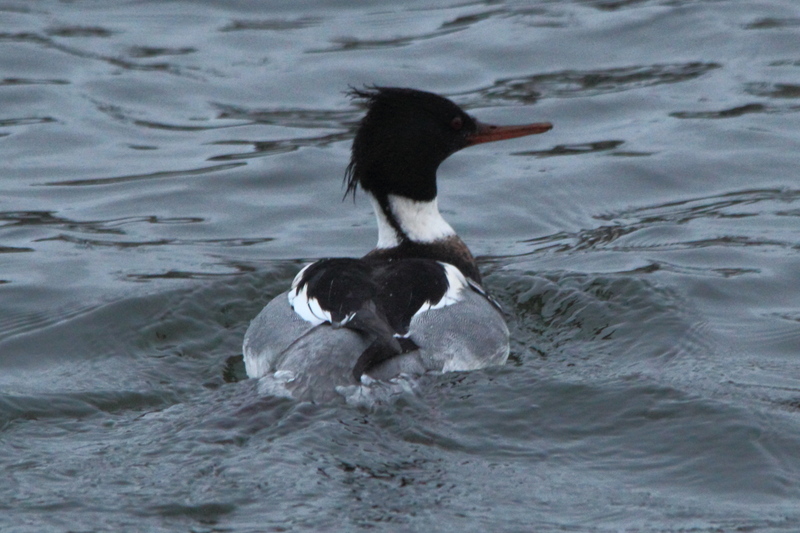 I was quite surprised at how skittish the waterfowl were, the only reason that I tried for the merganser when I did was that some one walking their dog well away from the channel was causing the waterfowl to move away from me, and out of camera range. So, I had to try that photo when I did. 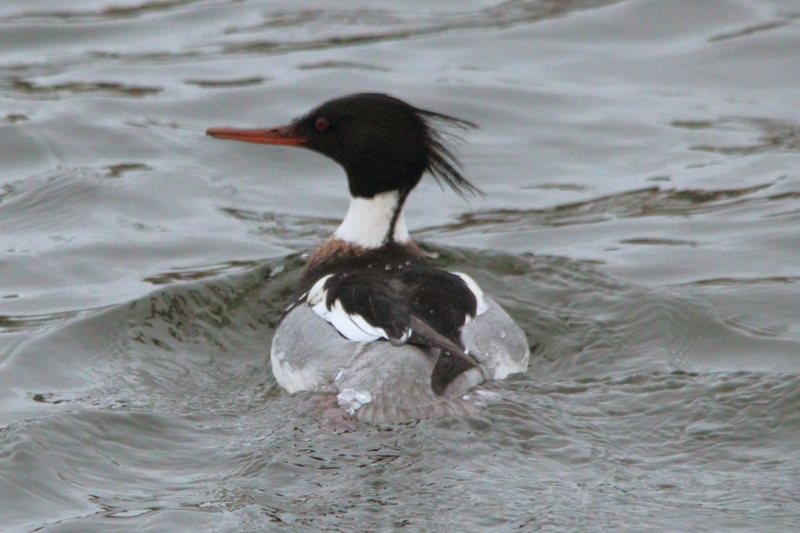 When the merganser did slow down enough for the slow shutter speed that I was using could freeze his motion, he had turned so that what little light that there was at the time was wrong. I knew that more people would be arriving to walk along the channel as the day progressed, so I shot what I could find in range, even in the very low light. 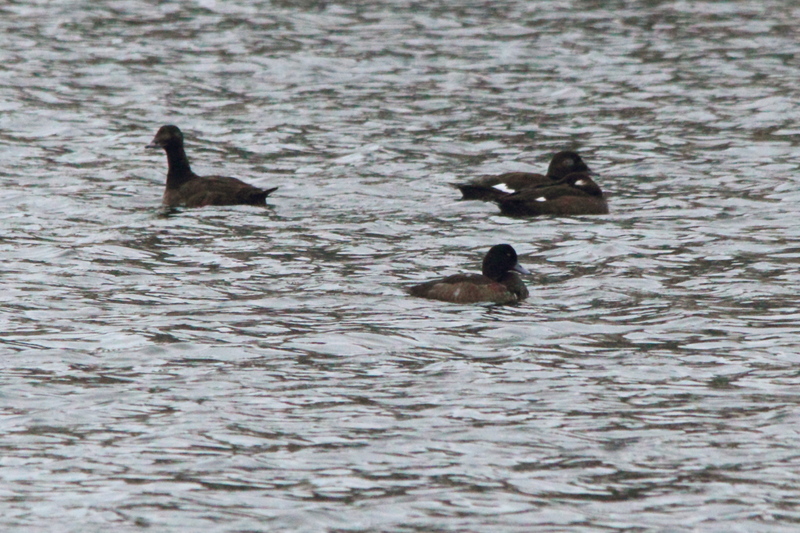 No award winners there, that’s for sure, but by reducing the noise and tweaking the exposures, you can see what species the waterfowl are. 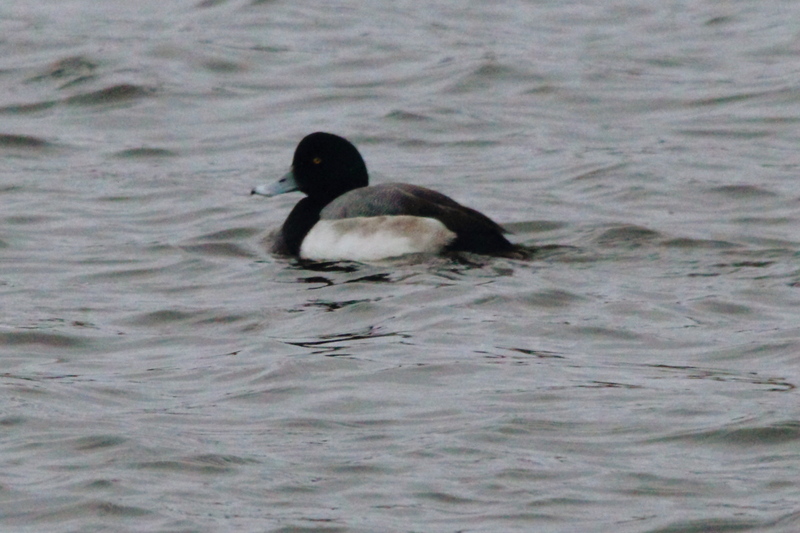 Sure enough, as the people began going for their morning walks, the waterfowl either flew off to other locations, or moved to the north side of the channel, out of camera range. So, I packed up and drove to Harbor Island, but the river there was completely frozen over, so there wasn’t much to see. 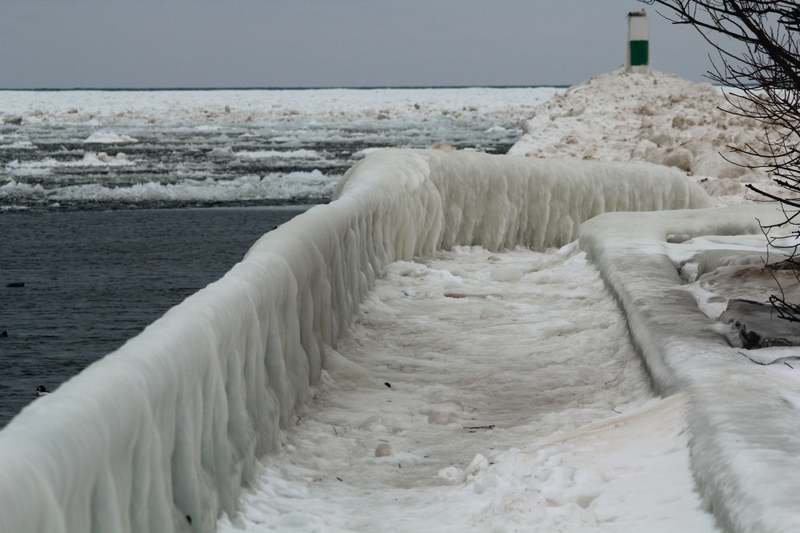 I continued on to the north side of the channel, and debated trying to walk the ice-covered walkway. 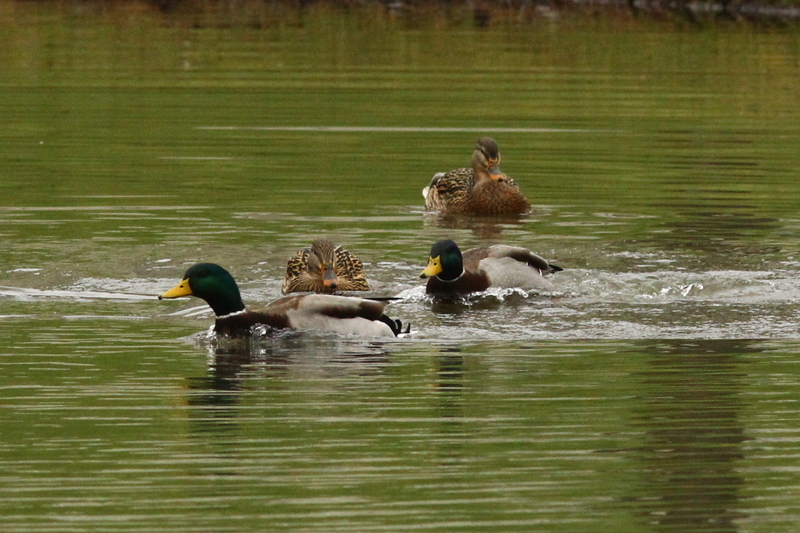 It didn’t matter, the ducks decided to leave well before I got close to them. 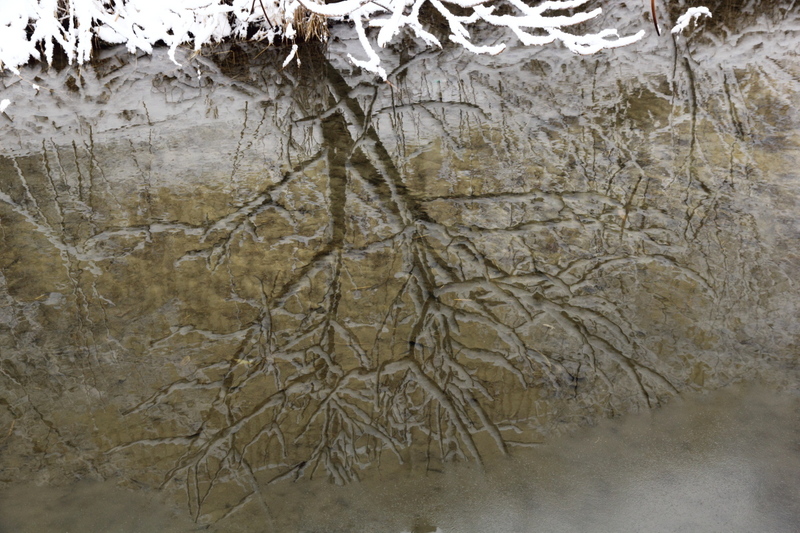 I could have, and probably should have, switched over to shoot ice formations found in the river. But not me, I was there for birds, sort of. 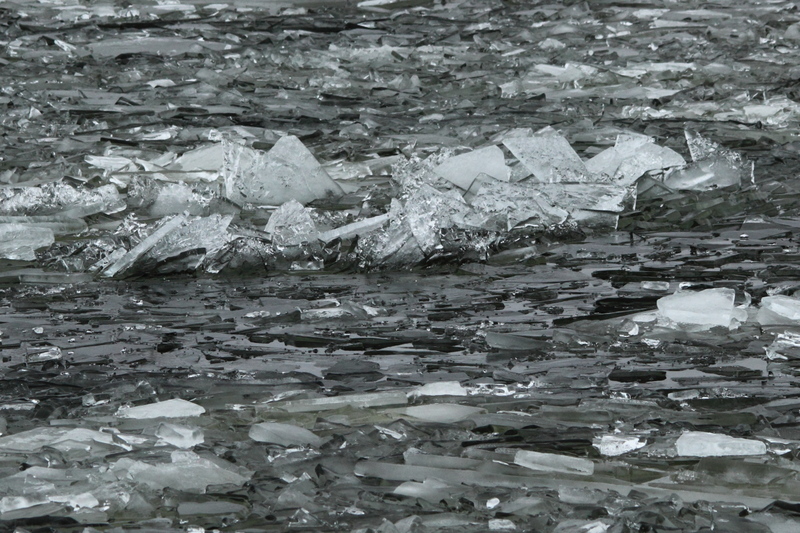 One of the cool things about the ice on the river was the sounds that it made as it collided with itself. 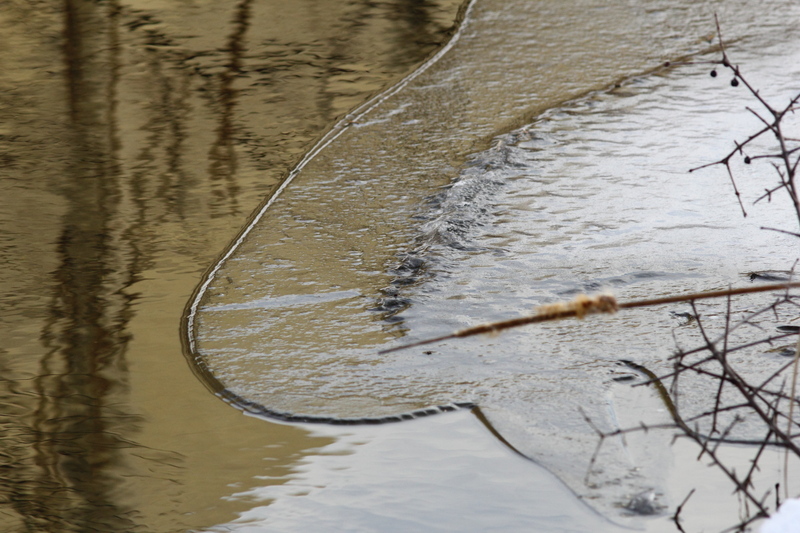 So, I switched over to shoot a video, hoping to capture the few remaining ducks and the tinkling sounds coming from the ice. 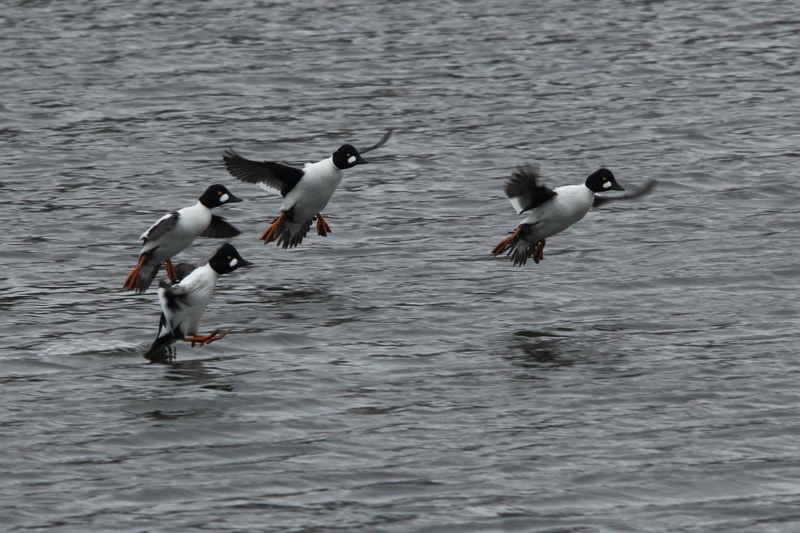 And hearing the sounds coming from the common goldeneyes as the came in for a landing prompted me to try catching the sound from a flock of them as they flew past me. I wouldn’t call either of those a great success, but I hope that it gives you an idea of the sounds that go along with the sights that I see. Also, it highlights one way of identifying some species of birds by sounds when you can’t see them well enough to ID them. 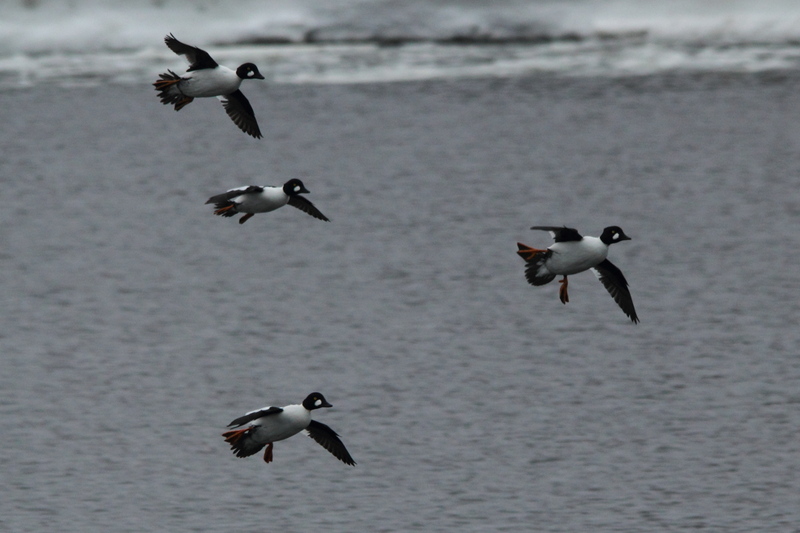 So, there I was, trying not to slip and fall over the railing as I worked my way carefully along the ice-covered breakwater, with flocks of ducks flying past me at regular intervals, but I couldn’t get close to any of them, until four male goldeneyes came in for a landing close enough for me to shoot these. Considering the poor light, not bad. A little noise reduction, and a few tweaks to the exposure, and I have photos worth posting, rather than deleting as I used to do. I considered switching modes again, this time to landscape photos. The lighthouse would have been a fine subject if I had put more thought into these. 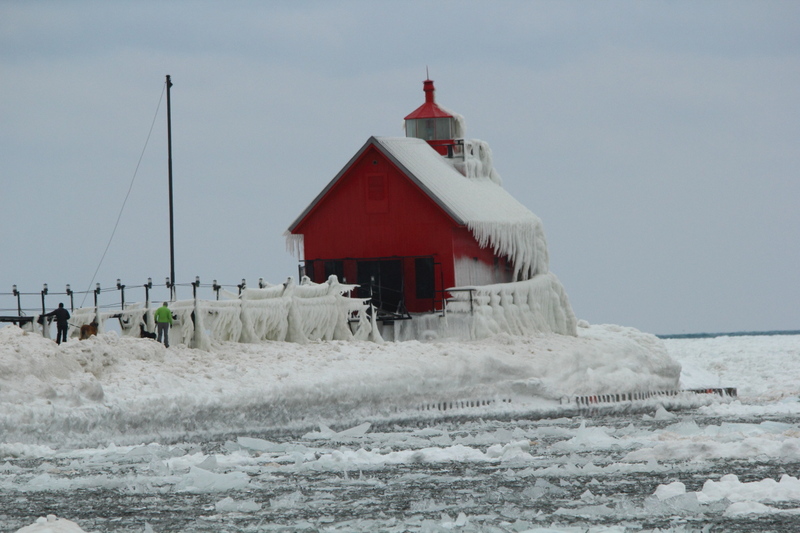 But, the footing was treacherous everywhere that I tried to walk, it seemed as if everything near Lake Michigan at Grand Haven was covered in ice. Also, the clouds would occasionally spit a little rain or snow at times, and I didn’t want to be changing lenses at those times. 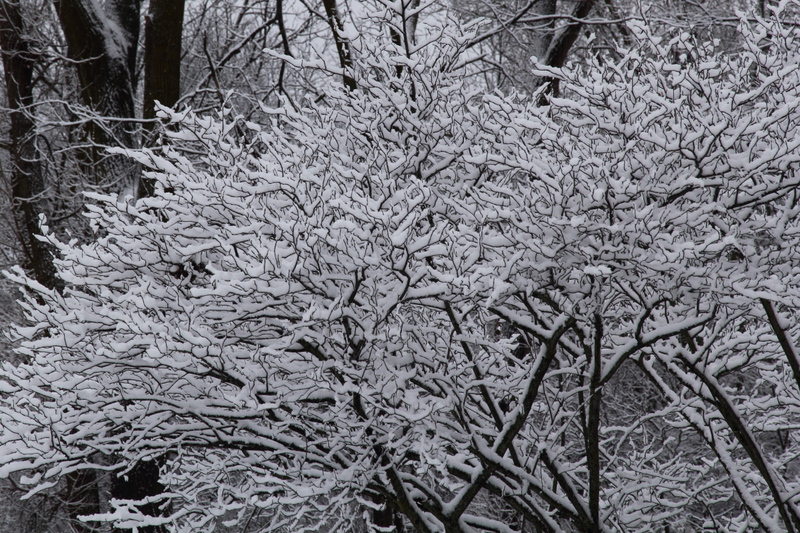 So, I walked back to my vehicle and swapped to the 70-200 mm lens for this one. I shot several others not worth posting, then in the shelter of my vehicle once more, I switched to my two wider angle lenses in turn, but neither of them produced an image worth posting. It wasn’t the fault of the lenses, but my unwillingness to risk a slip and fall on the ice while carrying my expensive gear. Not to mention, it was cold out there exposed to the wind. 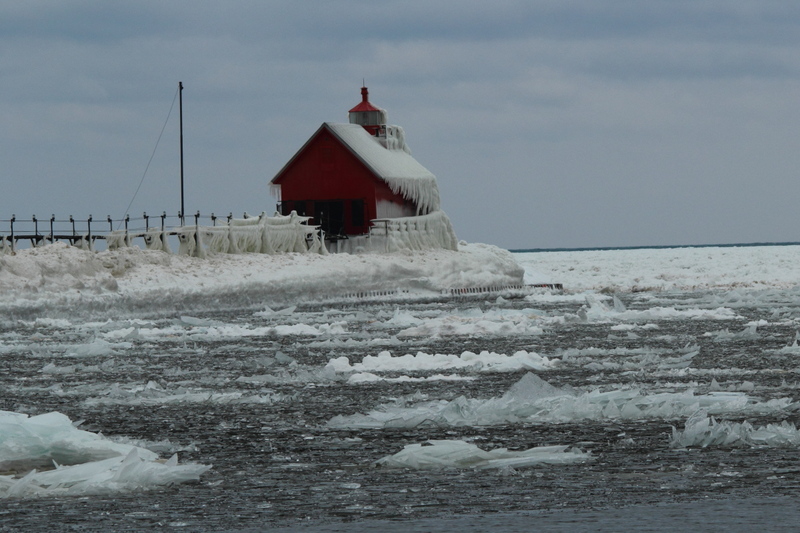 So, I packed up once more, and headed north to Lake Harbor Park, on the Mona Lake channel to Lake Michigan. 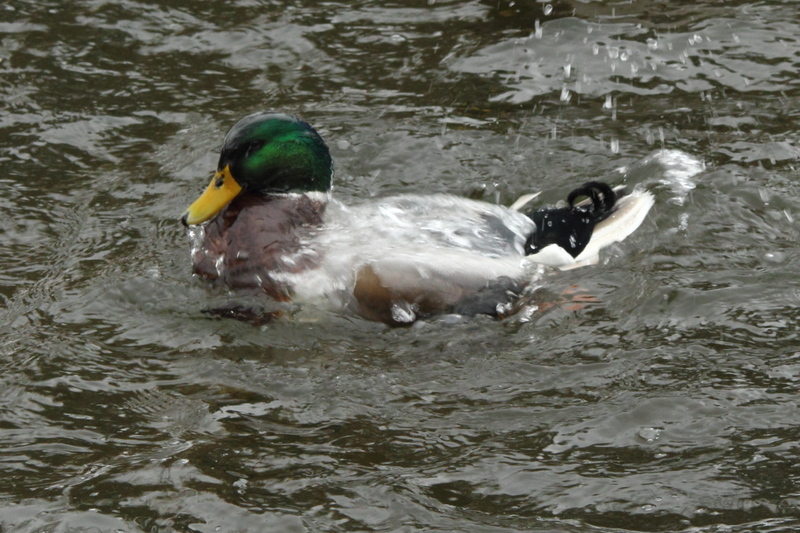 There, I found one of the resident mallards taking a bath…. 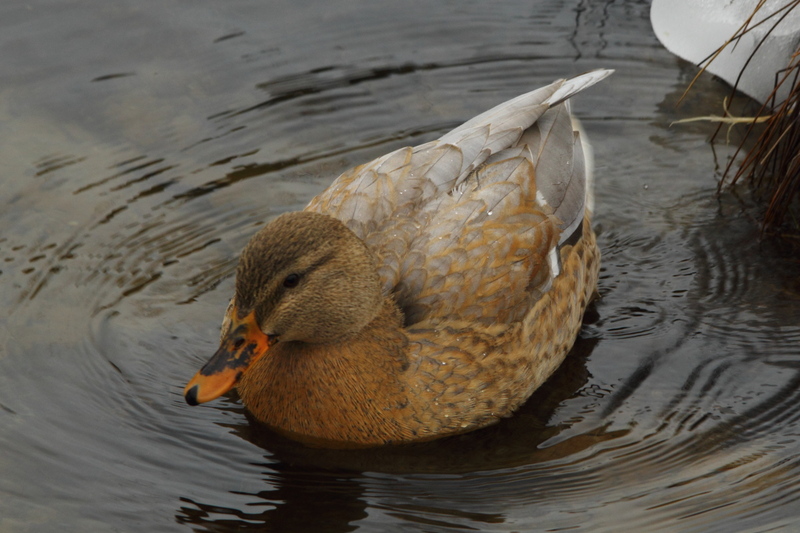 This subtly colored, but beautiful female mallard hybrid was still there. She was making herself look pretty for this shot. 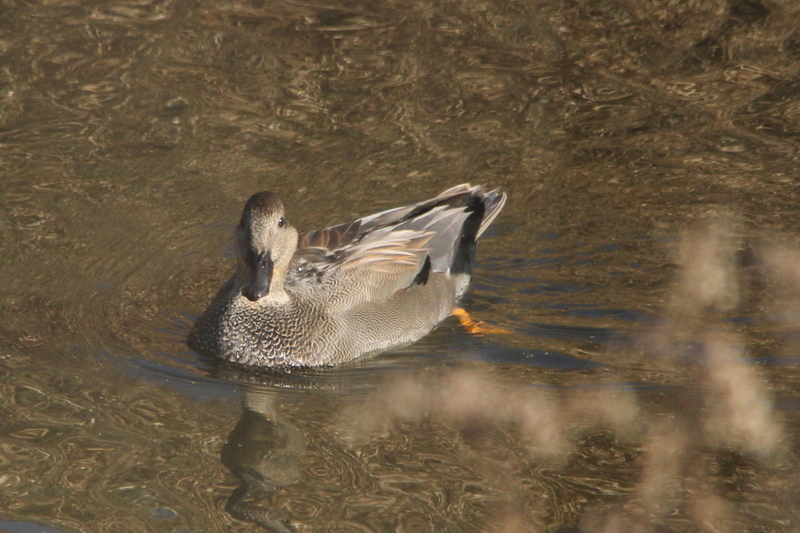 I also found this gal there, it looks like a female green-winged teal, but since she was hanging out with the other mallards, she may also be a hybrid. 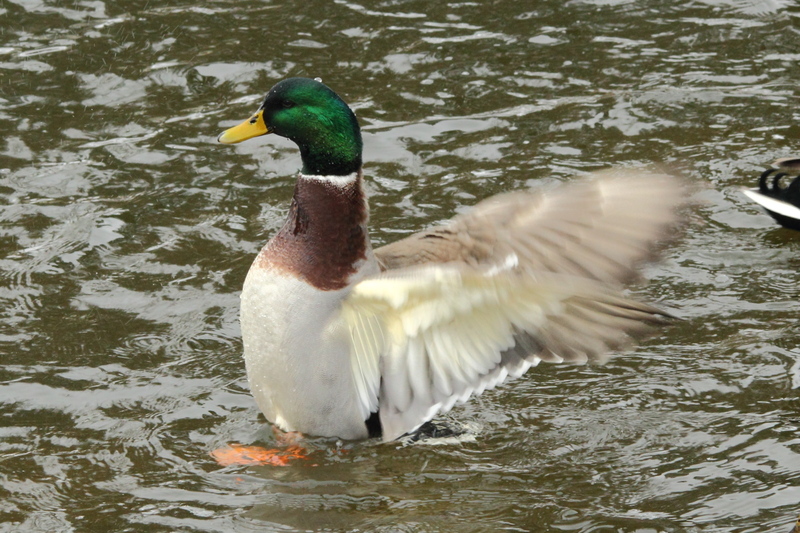 I thought that the light was improving a bit, but that was just while I was around the mallards. 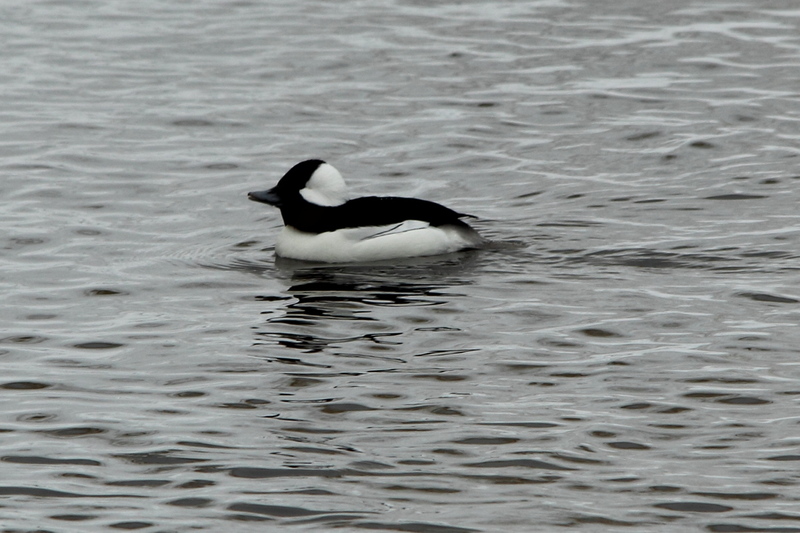 Farther down the channel, it grew darker again, just as I spotted a few other species of ducks, like this male bufflehead. 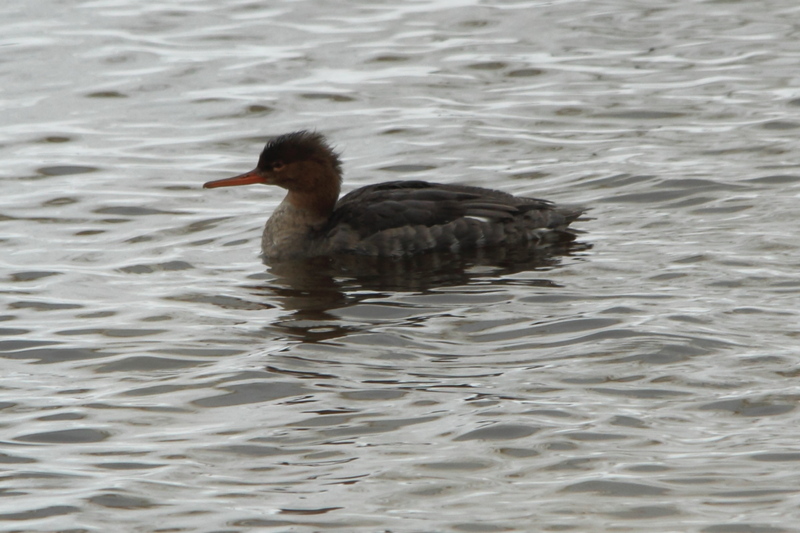 He was hanging out with this female red-breasted merganser. 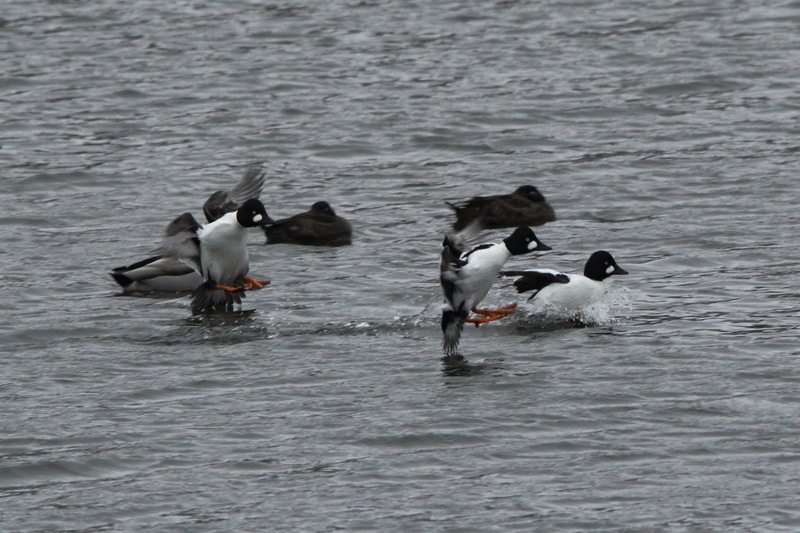 I looked back at the bufflehead just in time to catch him “saluting” me. I swear, that’s the duck equivalent of giving me the finger, as shortly after that, he dove, and I never did see him again. 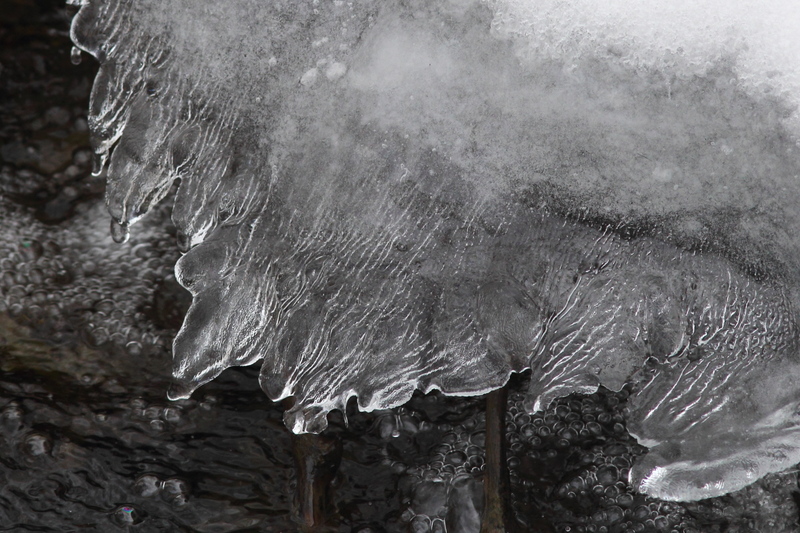 I shot a few photos of the ice formations there as well. 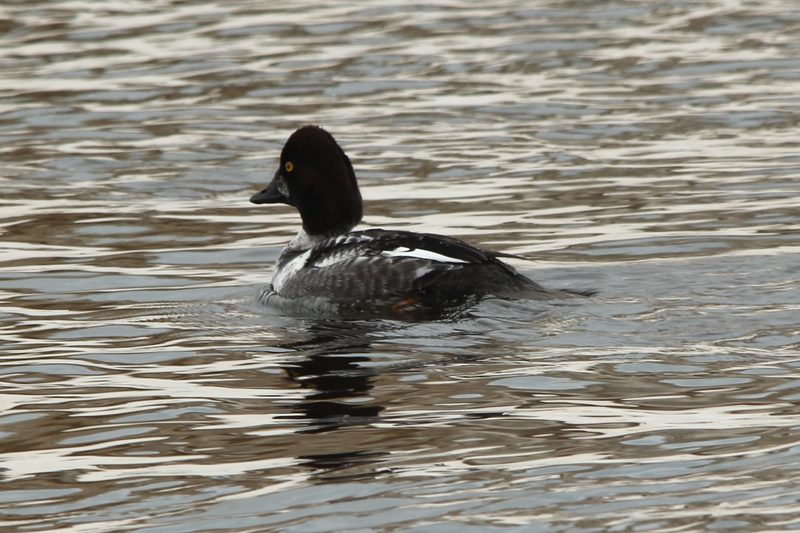 Most of the goldeneyes that I saw at Grand Haven were males, but here at Lake Harbor park, I saw mostly females. Again, noise reduction and tweaking the exposure saved these photos, for what they’re worth. 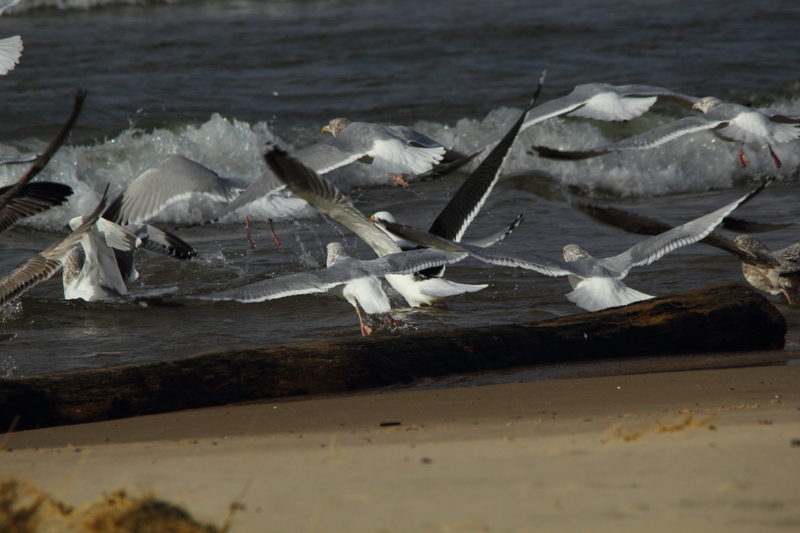 My next stop was the Muskegon River channel, where I shot my gull portrait of the day. 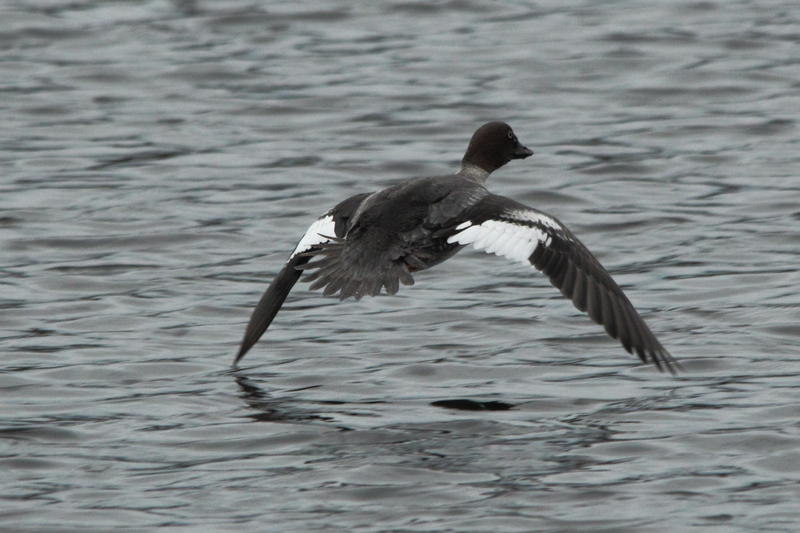 And then, caught this female common goldeneye in flight. 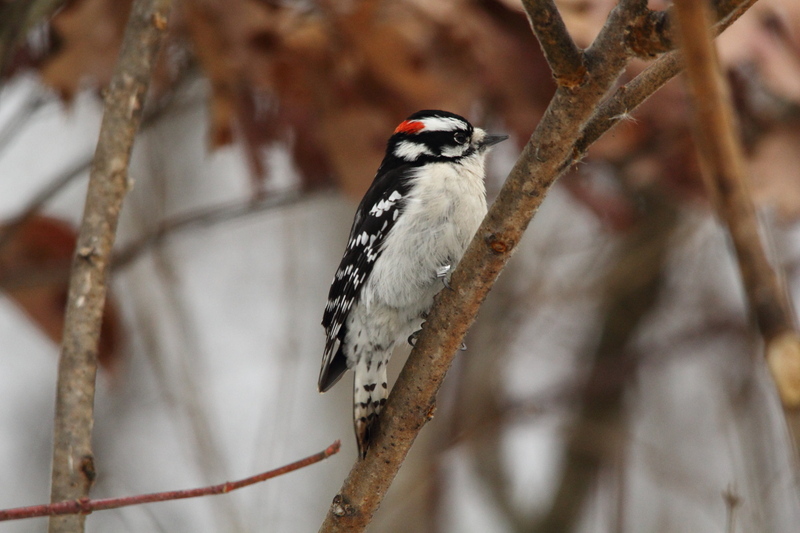 Other than her, and more ice, there wasn’t much else in range of the camera, so I headed to the other end of Muskegon Lake to visit the aptly named Muskegon Lake Nature Preserve, where I spent some time shooting songbirds. 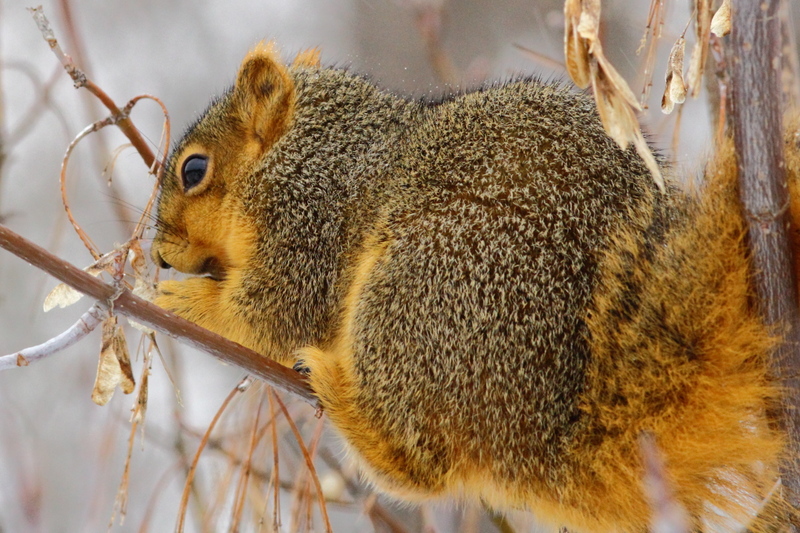 That’s also where I got the grey squirrel from earlier in this post. It wasn’t the only mammal around. 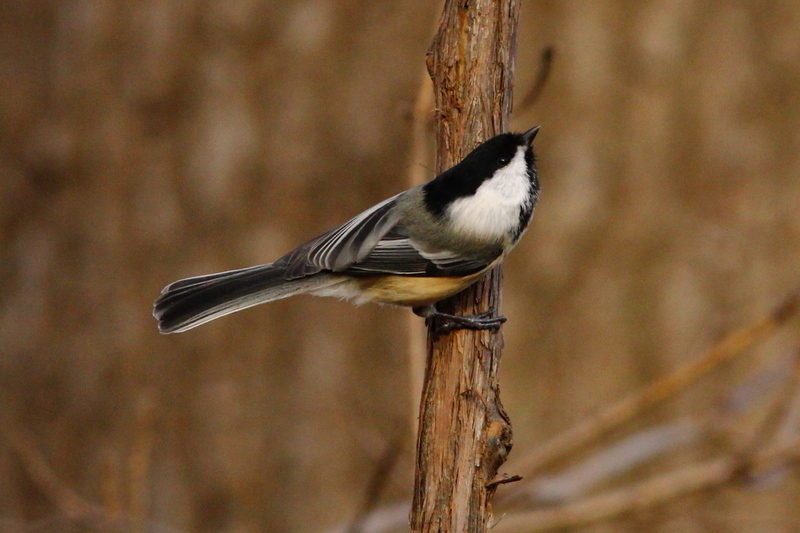 But mostly, it was birds that I photographed. 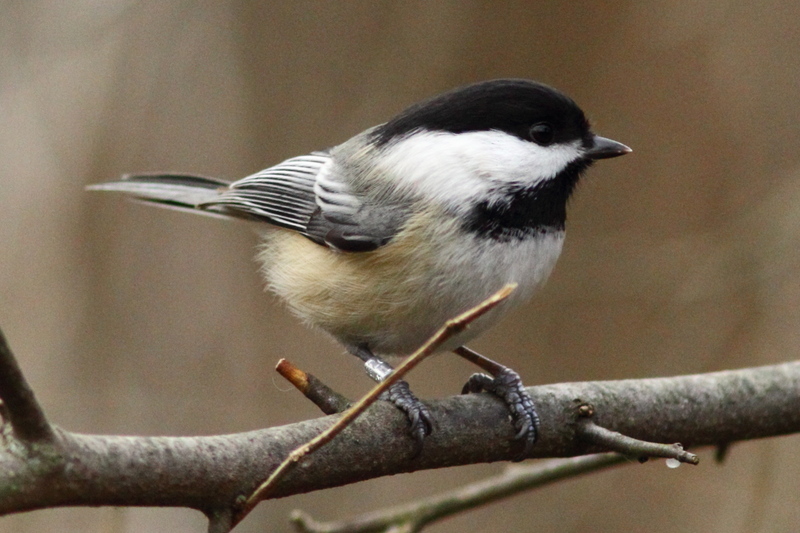 You may have noticed that the chickadee was on a bird feeder, something that I rarely do. 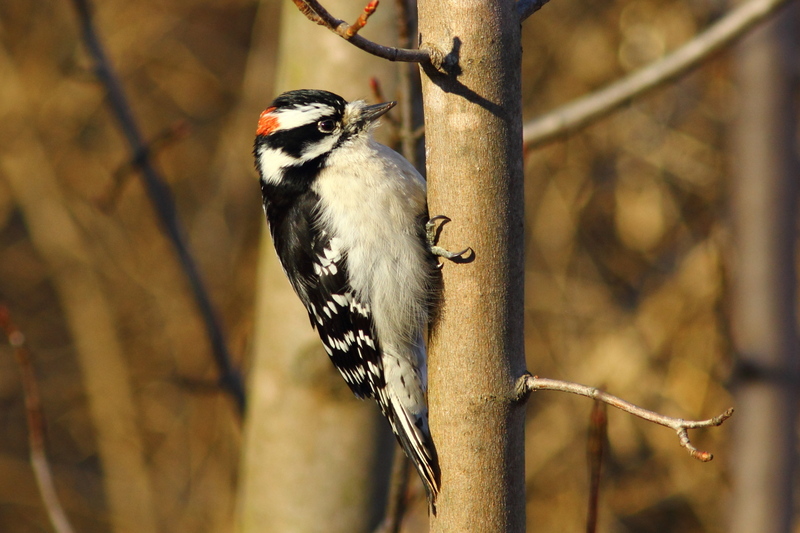 I suppose that what I did do is much the same, I sat down on a picnic table close to the feeders and caught these birds as they came and went. 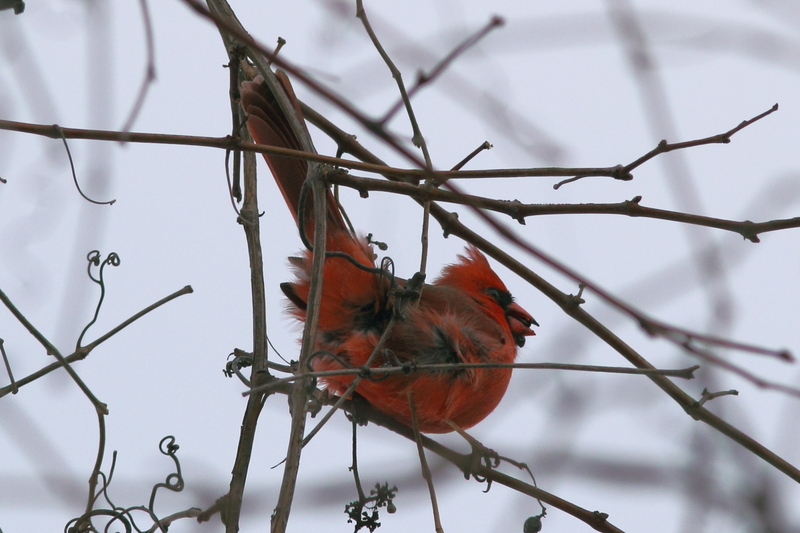 This cardinal was so close to me that I was cutting off her tail with the camera in the landscape position. So, here she is with the camera in the portrait position, these were not cropped at all. Funny, I used to crop photos, but do no other editing. Most of these weren’t cropped at all, or just a little, but I edited them to reduce noise, and improve the exposure slightly when needed. 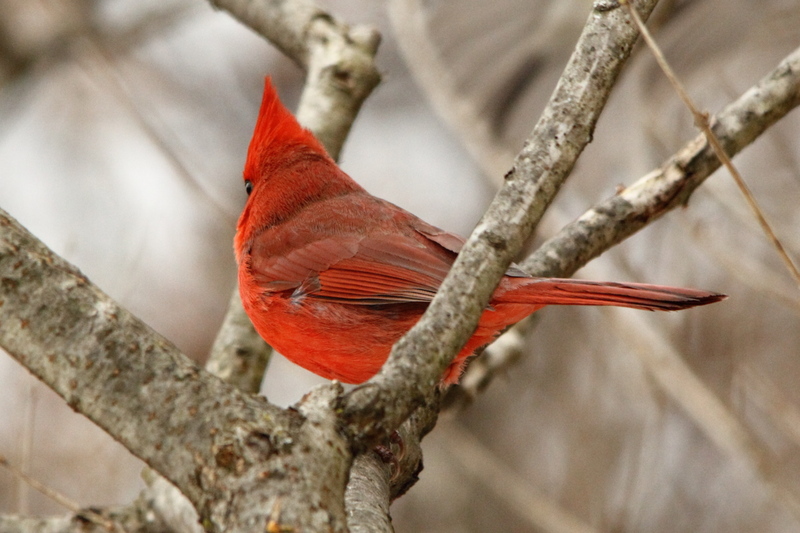 Still, it doesn’t help when the birds don’t play nice, I had this male cardinal all lined up for a great shot, but as I pressed the shutter, he turned away from me. This one tried to hide, but not very hard. 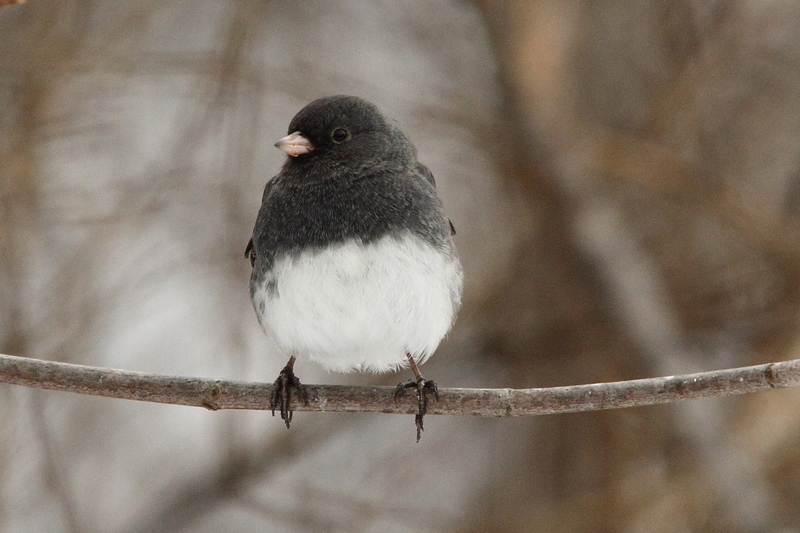 Juncos can be difficult to get close to, I lucked out, and had one perch this close to me as seen through the Beast (Sigma 150-500 mm lens). Getting the noise reduction software to work sure helped those out. Finally, my last stop of the day was the Muskegon County wastewater facility. 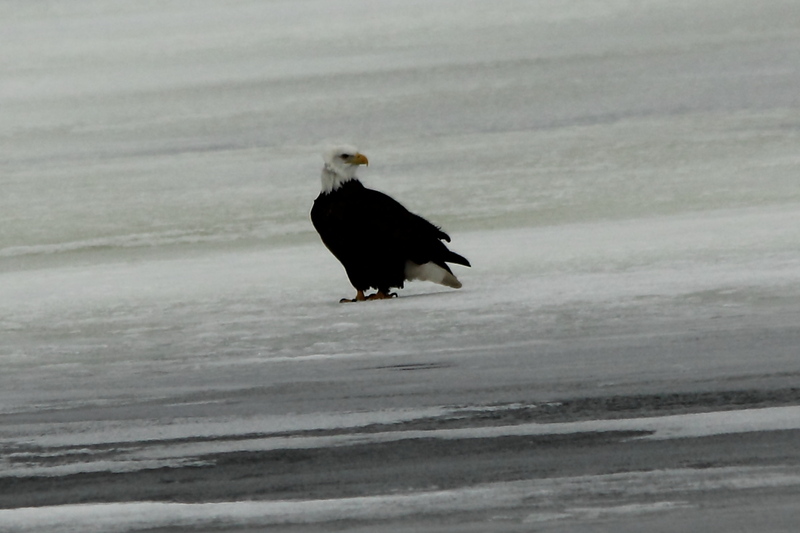 I did the quick tour, no snowy owls in sight, but I did find one bald eagle just on the edge of the Beast’s range. Okay then, now for some boring camera talk. As I speculated earlier, as I learn how to edit the images coming from my Canon 60D bodies, I’m happier with them than I have ever been. I’d still like to upgrade to the new 7D Mark II, but I’m no longer chomping at the bit the way that I was when it was first announced. Part of my conversion to some one who post-processes his photos has been learning the details of the different camera models. My 60D has the same sensor as the original 7D has, so theoretically, the image quality from both should be the same. Straight from the sensor, that’s probably true. However, Canon programs their more expensive camera bodies differently than they do the lower end models. Probably the best example of that is the 70D and the 7D Mk II, they share the exact same sensor. But, the reviews of both models say that the 7D Mk II is much better as far as noise at higher ISO settings. How can that be, if they have the same sensor? The answer is the software programmed into the camera by Canon, the 7D Mk II does a better job of editing the images in the camera. If software is the reason, then what difference does it make if the software is programmed into the camera, or in some other software, say Lightroom, for example. It doesn’t matter, other than the time that it takes to edit the images outside the camera in post-processing, rather than having the camera’s software do it automatically. Since I have learned that no camera can faithfully record many scenes due to the limitations of the current sensors built into cameras, post-processing is required anyway. So, I may as well do the noise reduction with software, as well as fixing the exposure weaknesses in the images coming from my camera. Yes, I’d still like to upgrade to the 7D Mk II for its better weather sealing and auto-focusing system, but until I max out what is possible with my current camera, then I can wait until the new 7D has been on the market long enough for Canon to offer rebates on it, to save some money. Well, since this post is already quite long, and the text has disappeared again, it’s time to wrap this one up! 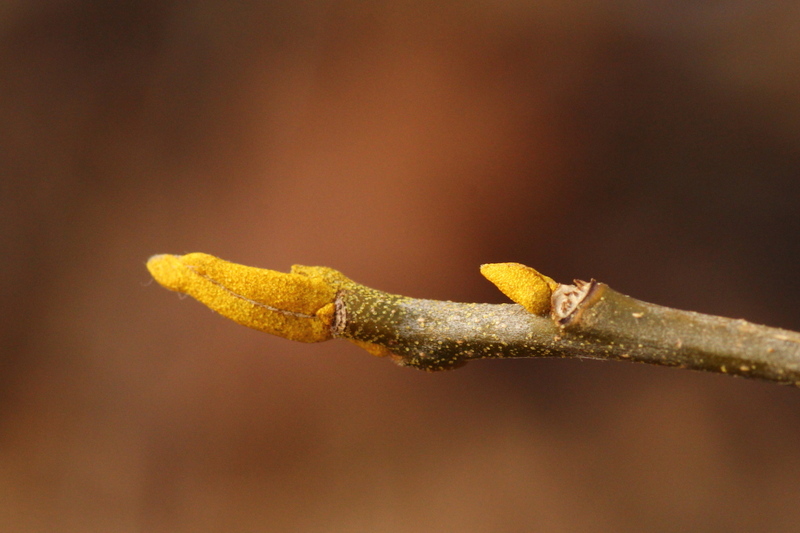 Sorry for another post so soon, and neither the photos or video are very good, but I have managed to find the first real sign that spring is on its way. I thought that the red-tailed hawks had been acting a bit frisky lately, as if they were flirting to strengthen their pair bonding before the actual mating season arrived. 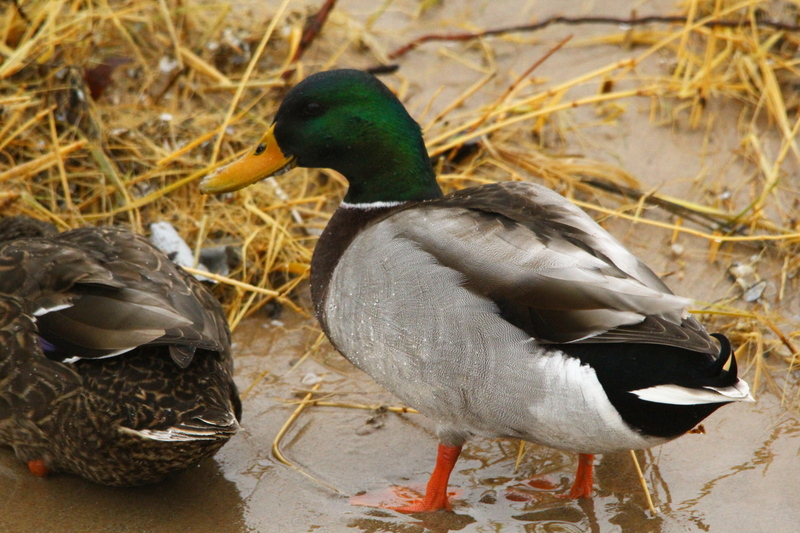 One can never be sure of that though, it could be a pair hunting together, with no thoughts of mating. However, we had two warmer days in a row, and even though it began to turn colder, we did get a little sunshine for a while. We were on the cusp of the storm that’s going to hit the northeast with a nasty blizzard, all of that went just to the south of my location. So, I could look to the north and see sunshine, and looking to the south, I saw the storm clouds as the storm tracked south of here. Anyway, I got to the sheltered area of the park that I walk around home, down in the valley near the creek and out of the wind. 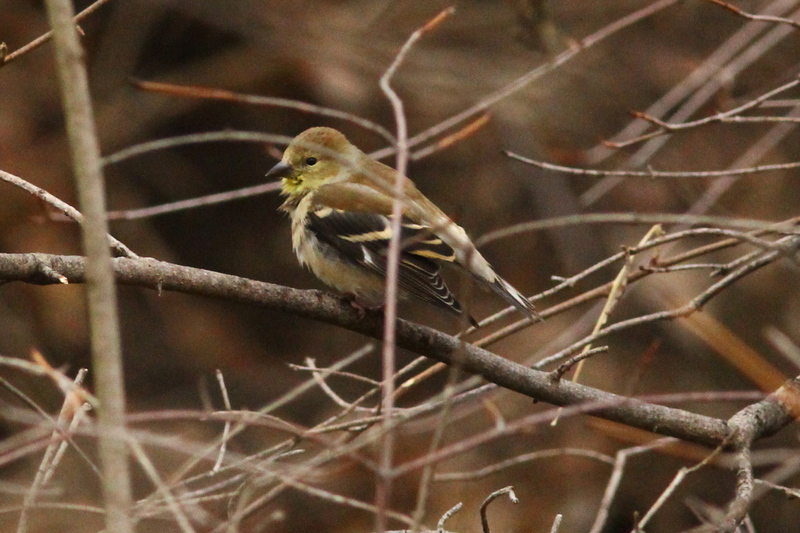 The brush is very thick along the creek, and there was a large flock of mixed species of birds feeding in the brush. 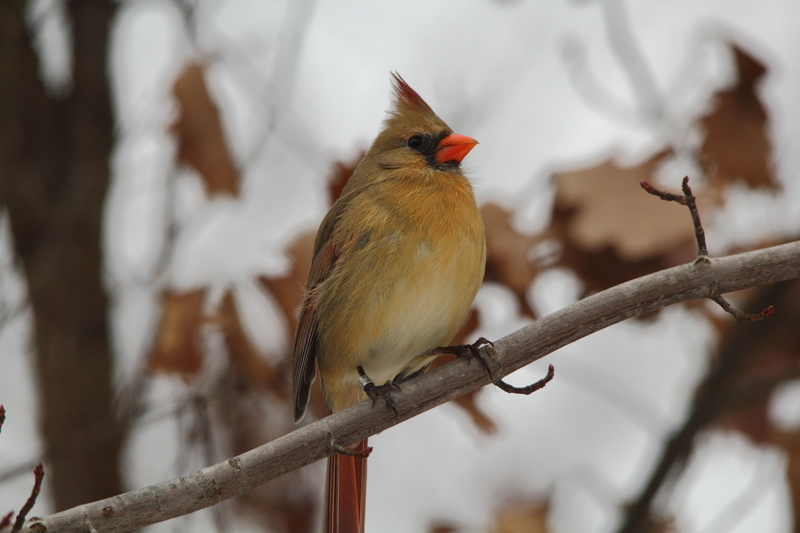 The big news is that a few of the birds were warming up their vocal chords in preparation for true spring when it arrives. 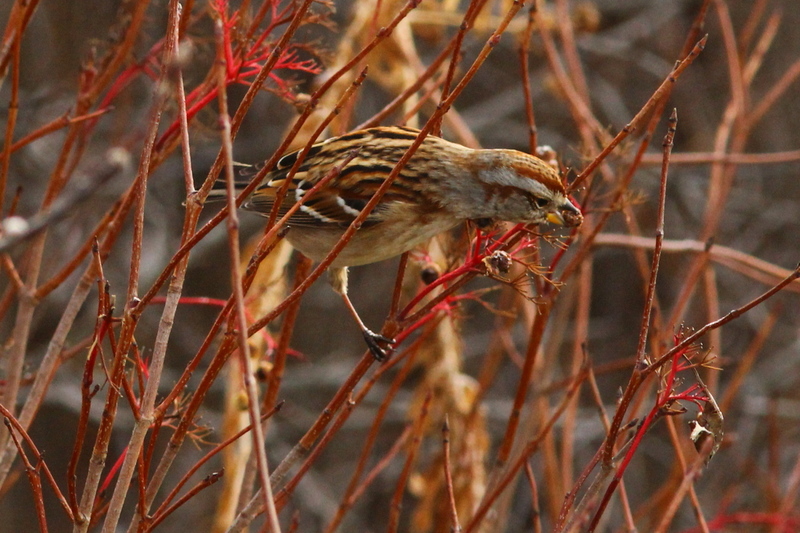 While some of the birds were out in the open, feeding their faces…. 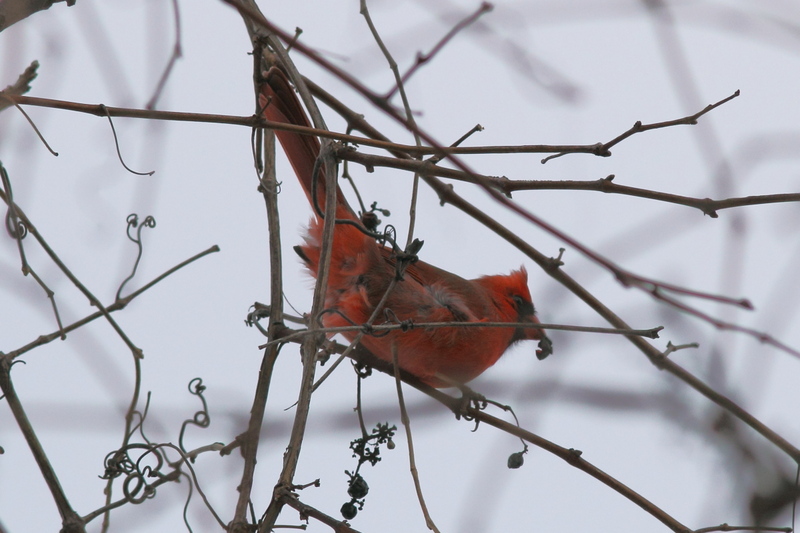 …there was a male house finch hidden back in the brush just singing away! You can just make him out in that photo, but of course you can’t hear him singing. 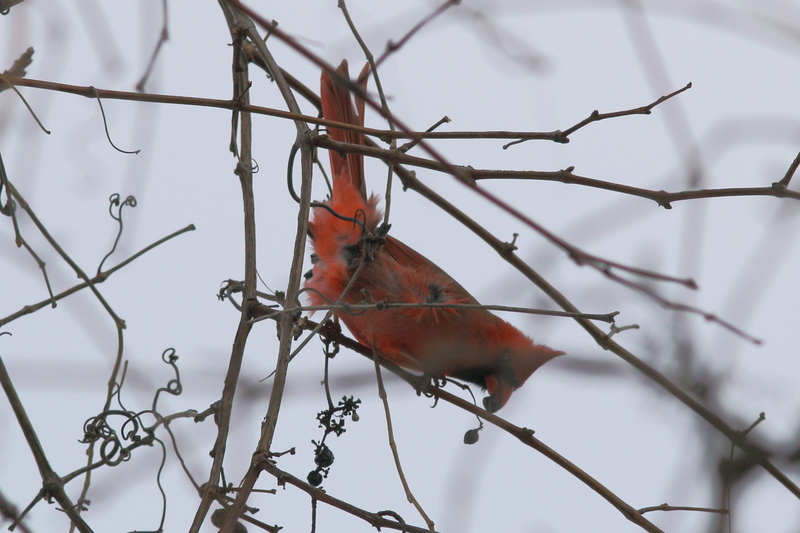 So, I switched over to shoot a video, and while you can’t really see the finch, you can certainly hear him! 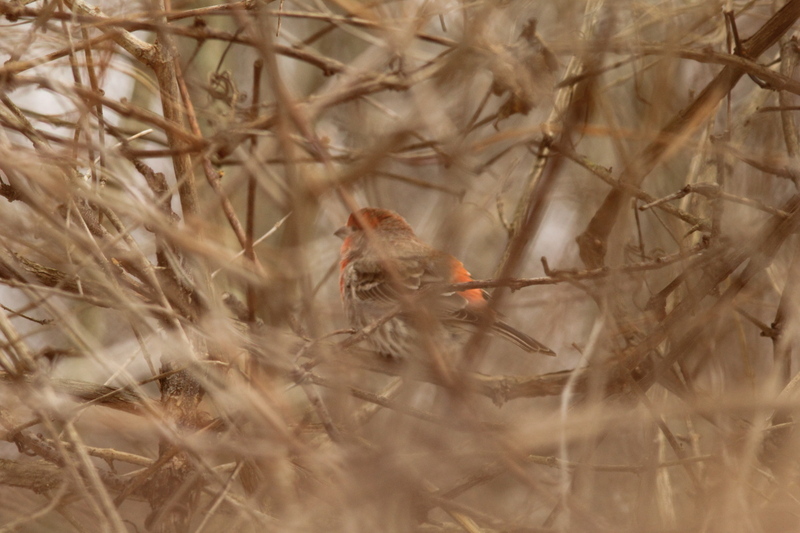 I tried several times to find the finch in the brush while shooting videos, but I had a hard enough time finding him through the viewfinder, using the LCD display, he was impossible to see. Then, there’s the background noise of the traffic going past the park, but you get the idea, the birds have begun to sing their spring songs! 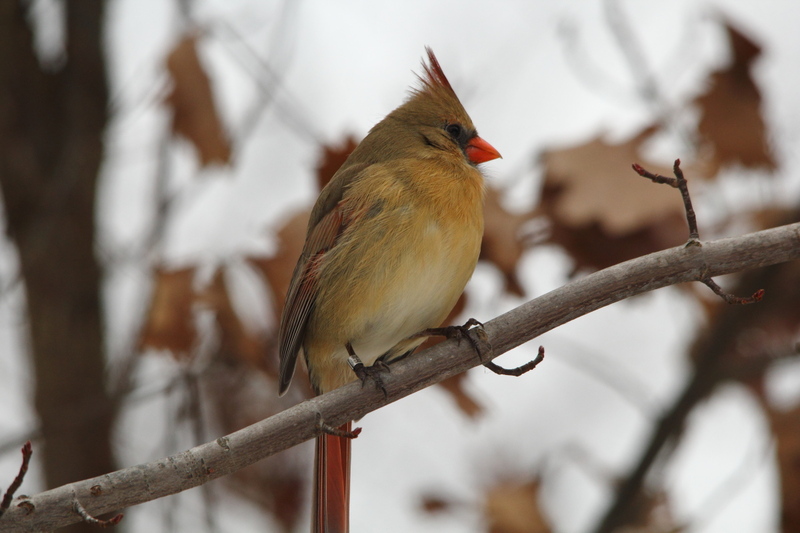 I also heard a male cardinal practicing a few bars of his songs, as well as a goldfinch, but they weren’t as persistent as the finch. 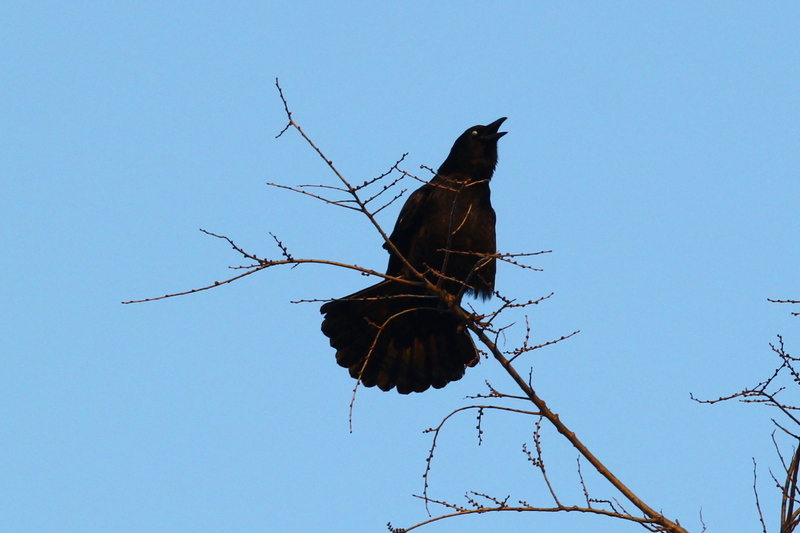 All it took was a bit of sunshine, and almost right on cue, the last week of January, the first singing birds. 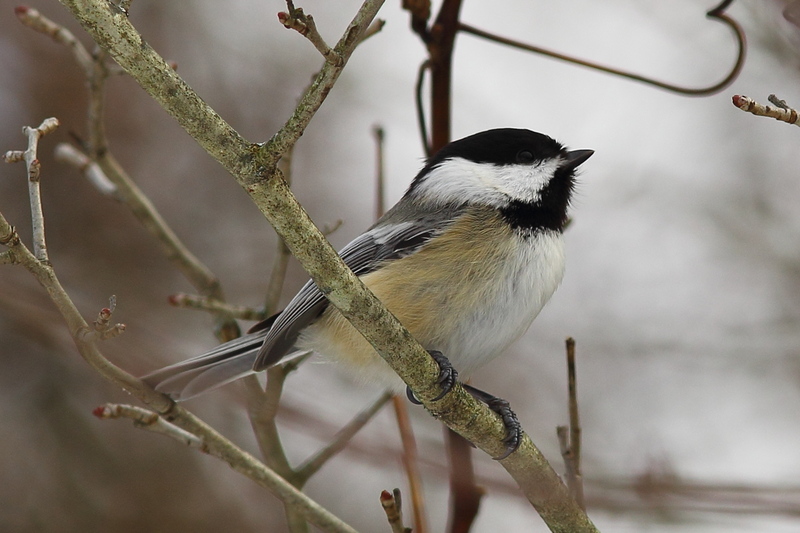 While there’s still an entire month of winter left here, just hearing a few birds singing really lifted my spirits, and now, the winter won’t seem as hard to take. 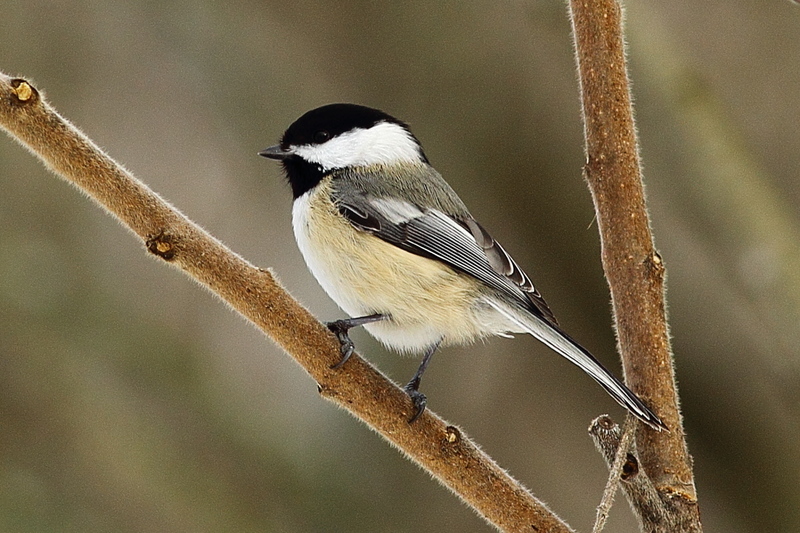 So, I hope that hearing a bird singing lifts your spirits as well, especially those of you that are about to be hit by the blizzard! 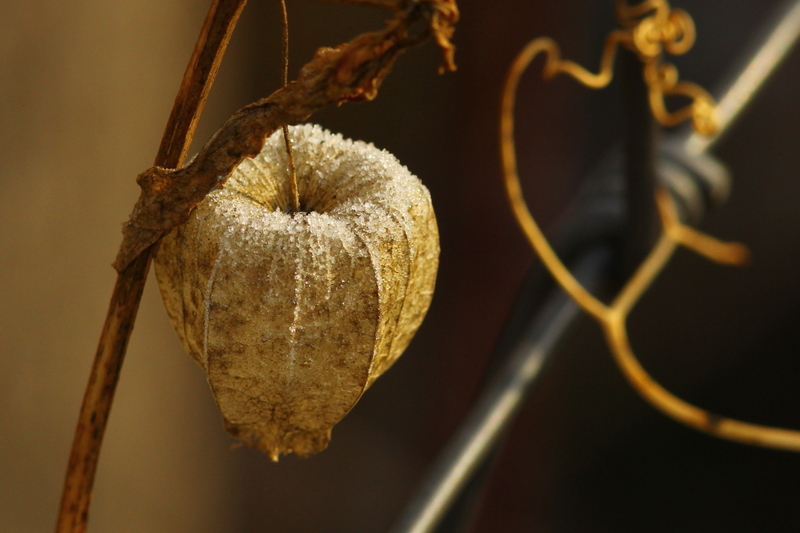 Spring is coming, we just need to hold on a little longer. 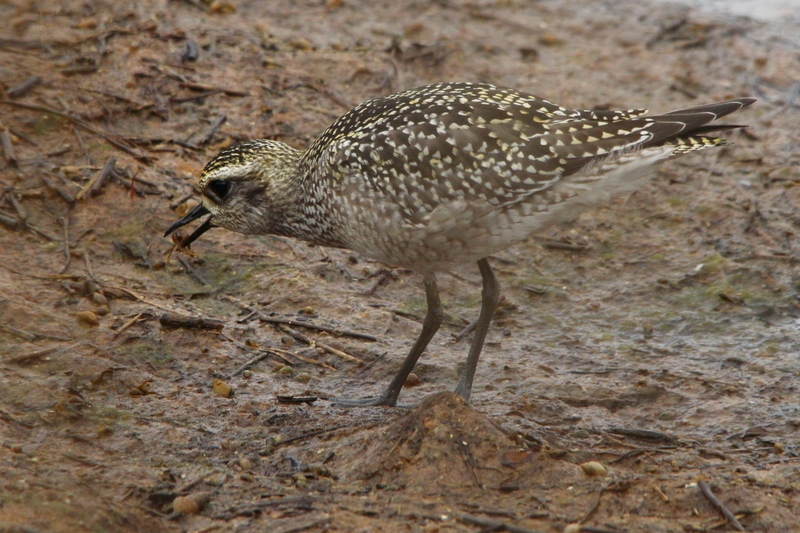 The American golden plover is a medium-sized plover. 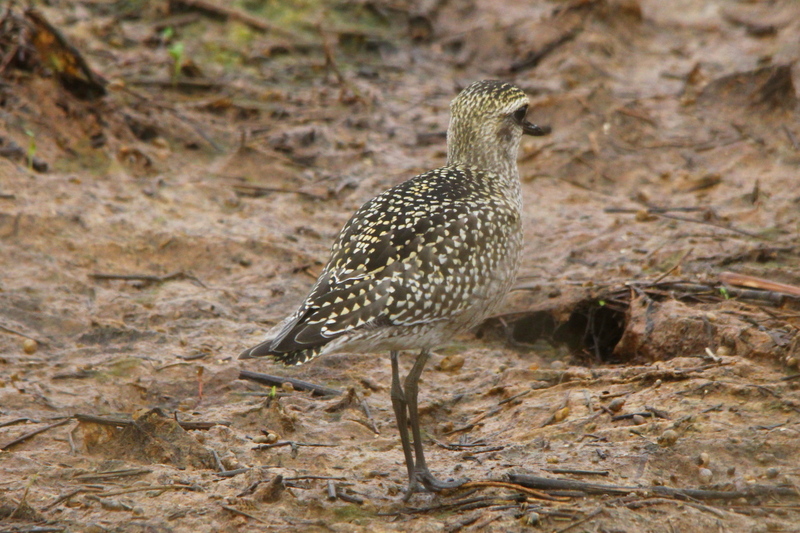 The breeding habitat of American golden plover is Arctic tundra from northern Canada and Alaska. 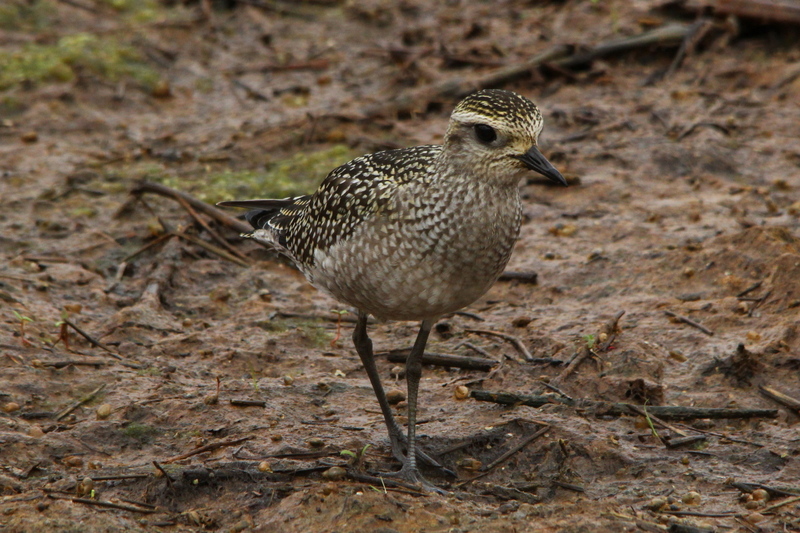 They nest on the ground in a dry open area. 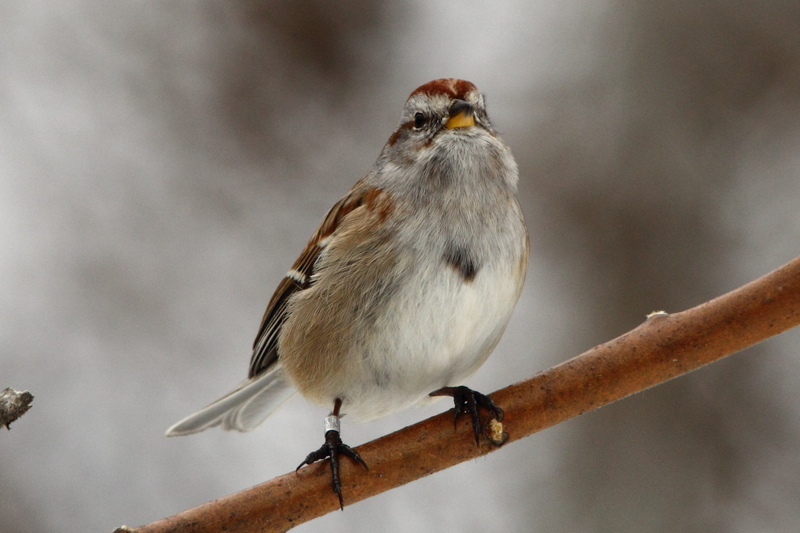 They are migratory and winter in southern South America. 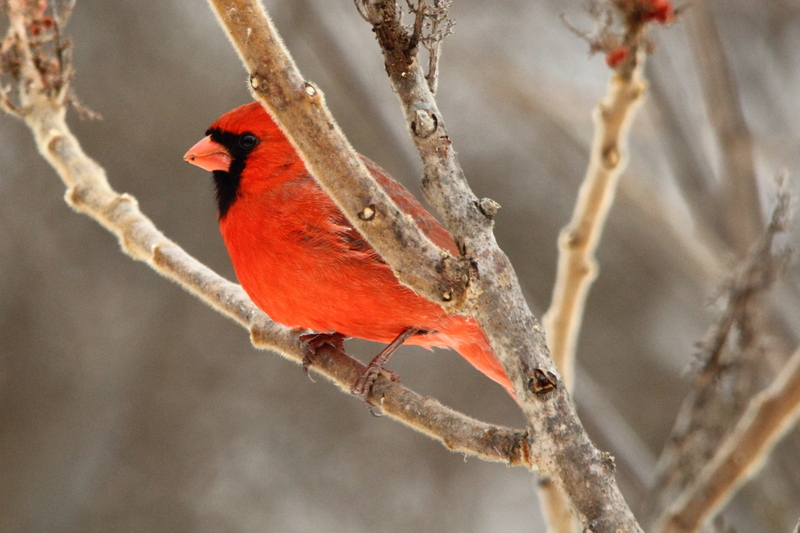 They follow an elliptical migration path, northbound birds pass through Central America about January–April and stage in great numbers in places like Illinois before their final push north. 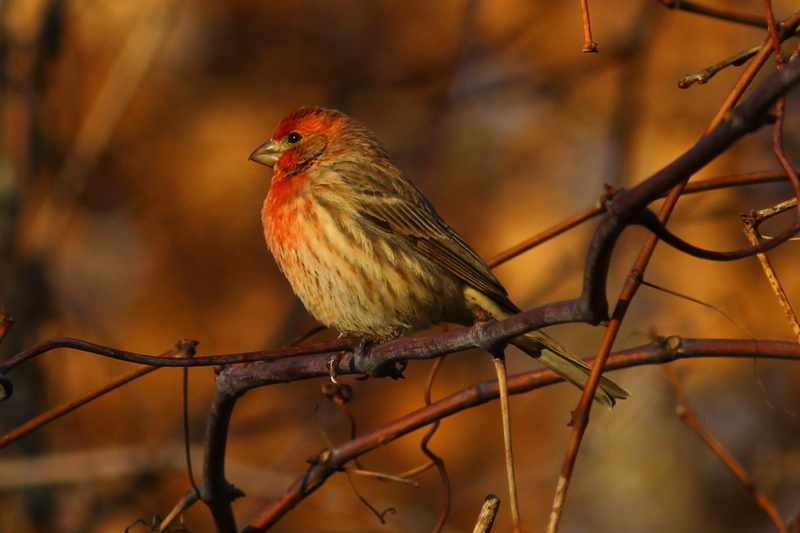 In fall, they take a more easterly route, flying mostly over the western Atlantic and Caribbean Sea to the wintering grounds in Patagonia. 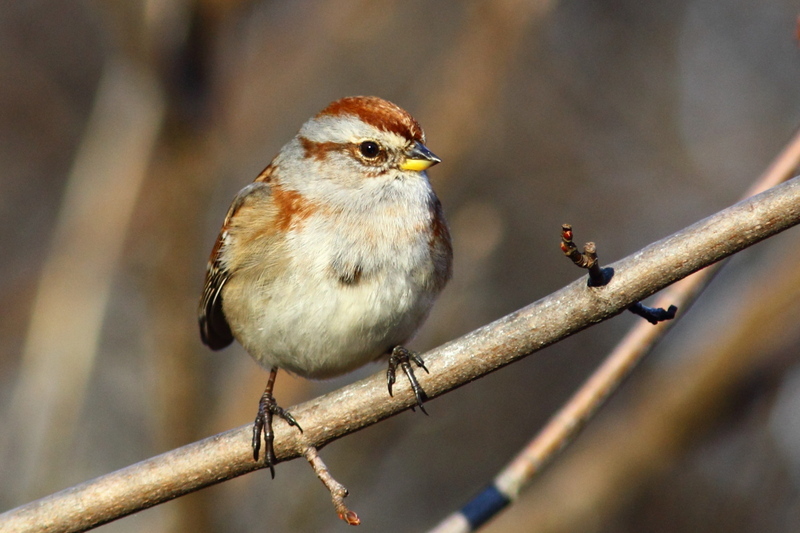 The bird has one of the longest known migratory routes of over 25,000 mi (40,000 km). Of this, 2,400 mi (3,900 km) is over open ocean where it cannot stop to feed or drink. It does this from body fat stores that it stocks up on prior to the flight. This is number 173 in my photo life list, only 177 to go! 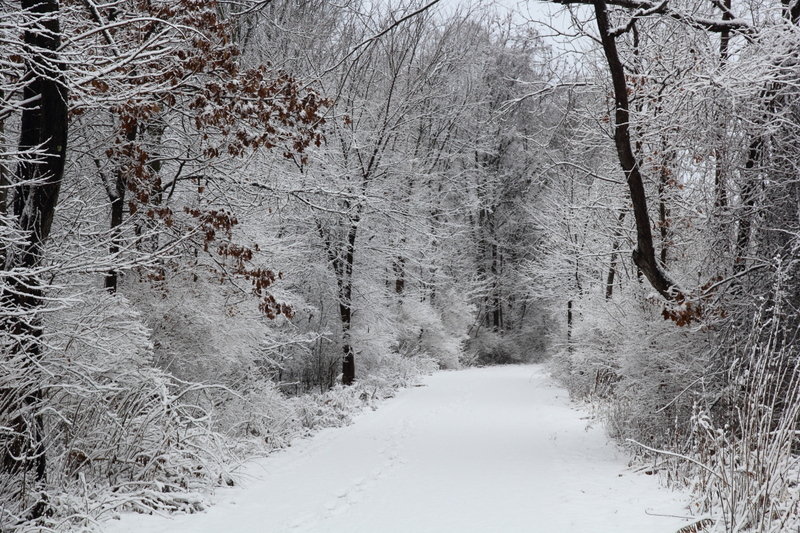 To refresh every one’s memory, around here, November was very cold and snowy, we set several record low temperatures as well as the most snow ever for the month of November. 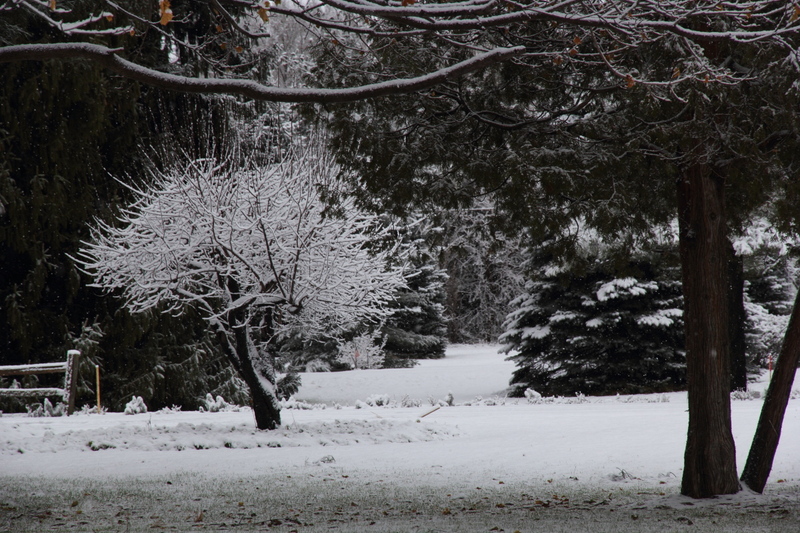 December was slightly milder than average, with only a little over an inch of snow, but no sunshine to speak of. Well, with January came a return to the cold and snow. 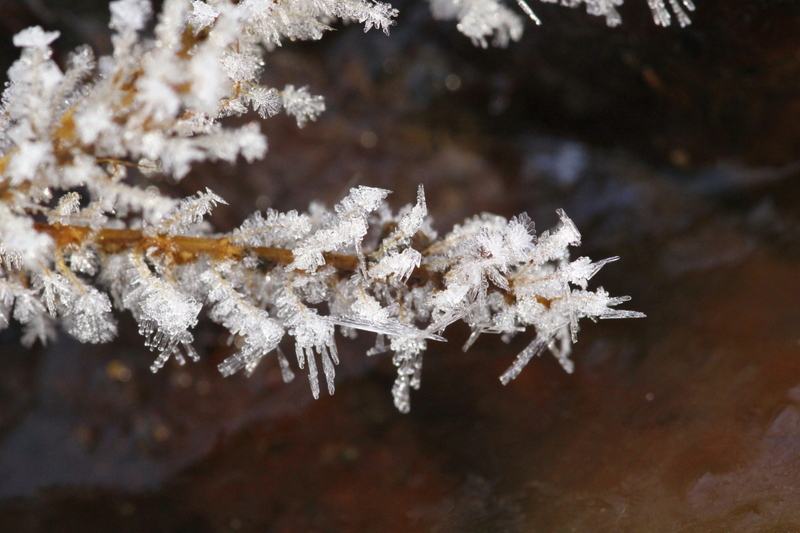 We’ve set a couple of more records for low temperatures, one morning it got down to -13 degree Fahrenheit (-25 degree Celsius), the coldest it’s been here in twenty years. Even with little snow in December, we’re still well above average for the season, almost on pace with last winter which was the second snowiest on record. 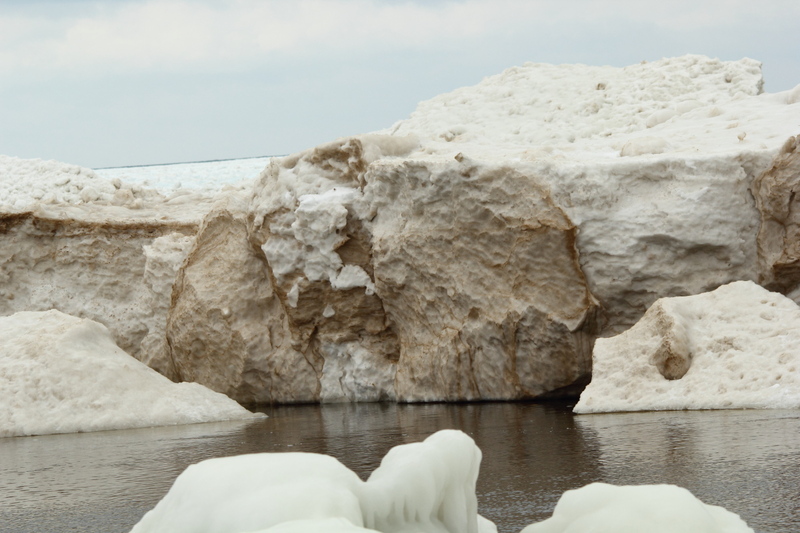 To put it different terms, this past Sunday I went to the Lake Michigan shore again, and the temperature was right around the freezing point, but it was forty degrees warmer than it had been a few mornings before. So with the extreme cold, and the hours that I’ve been working, there was an entire week when I wasn’t able to get outside at all. That doesn’t mean that there will be a shortage of photos in this post though, as I’m still playing with my camera equipment, learning how to get better images out of the camera. And, I have been trying to learn Photomatix, the HDR software, along with the photo editing software that came with my camera in order to improve my images even more. That has been a real pain on my badly outdated computer, it takes around thirty seconds to convert a RAW image to a jpeg for use here in my blog. It takes over five minutes for Photomatix to process a single HDR image. I came home from the lakeshore on Sunday with 165 images that I cut down to 85 possible for my blog, it took my computer over an hour to process those images from the after edited RAW format to jpeg format for my blog. I don’t have the time or patience to wait that long. However, the new iMac computer is still a few weeks to a month away. Things have slowed down a little at my new employer, so while I’m still earning more money than at my last job, it hasn’t been as much more as I hoped it would be. The new company is tied to the auto industry, which almost always slows down around the holidays. Signs are that things are starting to pick back up again though. Ha, as if right on cue, as I was typing that, dispatch at work called to see how soon I could make it there as they were swamped with loads. That was Wednesday morning, it’s now Thursday morning before I go into work, and I already have just over thirty hours in for the week. That’s more like it. Anyway, maybe I’ve been foolish trying to do too much with too little computing power as far as processing my images up to this point, but I’m learning all the time, albeit slowly. It’s funny, but I was opposed to any post-processing of images up until a few months ago. I can still recall when my opinion began to change, it was last summer. I was up at the Haymarsh State Game Area as a thunderstorm was moving in. I tried shooting photos, but either the approaching clouds were blown out (way overexposed), or all the shadow details in the wooded areas in the foreground were rendered as black (way underexposed). That’s because the sensor in even the best digital cameras can not handle the dynamic range between very bright and very dark portions of a scene. It was shortly after that trip that I looked into HDR software, and purchased Photomatix software in an attempt to improve my images, that is, getting images that looked the same as the scene that I was trying to shoot. 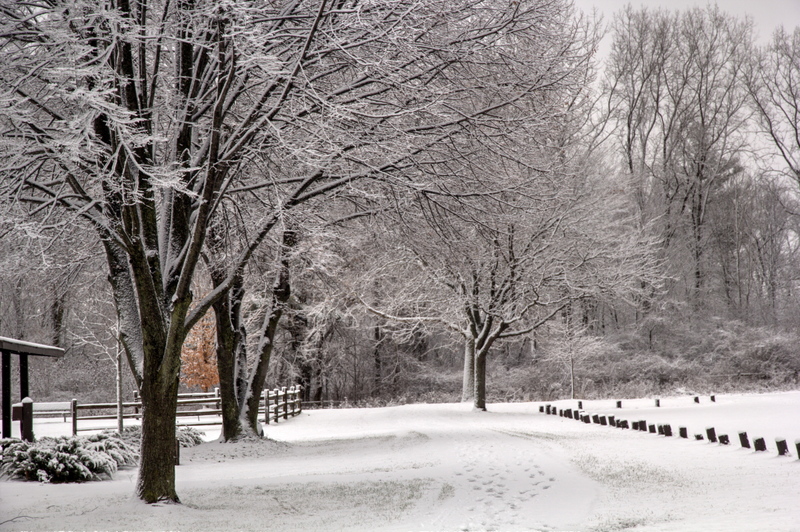 Like everything else, the Photomatix software comes with a learning curve. The first step is to get images exposed correctly for the software to do its job properly. To assist me in that respect, I’m actually viewing the histograms of the images that I intend to load into Photomatix, and I have turned the “blinkies” on in the camera body that I use for landscapes and macros. The “blinkies” are another name for the highlight alert system in many cameras today. Any part of the image that is overexposed blinks on and off in different colors to alert you to the fact that parts of the images are overexposed. 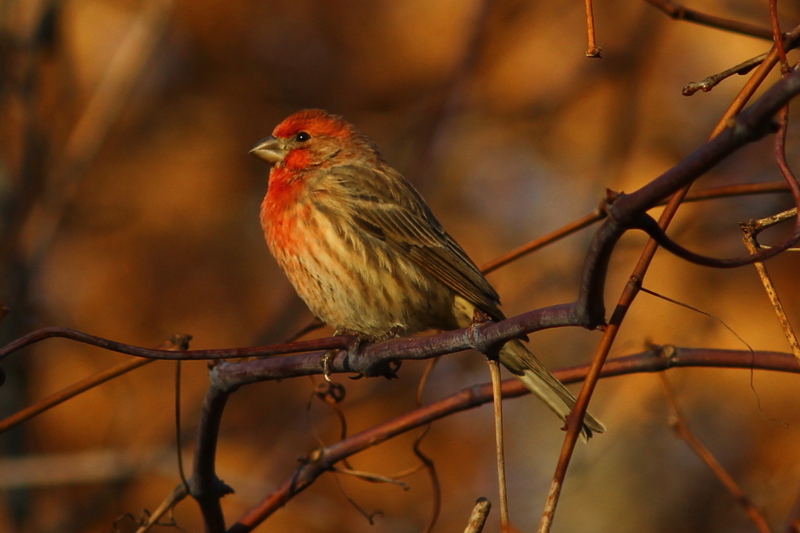 I had tried that before, but for most bird or wildlife photos, I found the blinkies to be a distraction, especially since I knew that the background was overexposed even without using the blinkies. However, for landscapes, especially if I intend to merge several images into a HDR image, the blinkies are a great way of checking to see that I’m getting the exposure correct. Maybe I should back up a step here, HDR software blends two or more images shot at different exposure settings into one image to capture the dynamic range in a scene better. Typically, I’ve been using three images, one shot at what the camera tells me is the correct exposure, one shot underexposed to capture the highlight detail (the brighter parts of a scene) and one shot overexposed to capture the shadow detail (the darker parts of a scene). I’m finding that getting the correct amount of over and under exposure for a scene is one of the keys to getting good results out of the Photomatix software, and those settings are different for different scenes, depending on the amount of dynamic range in the scene. Sometimes, it’s only 2/3 of a stop, other times it can be 2 full stops, or even more. 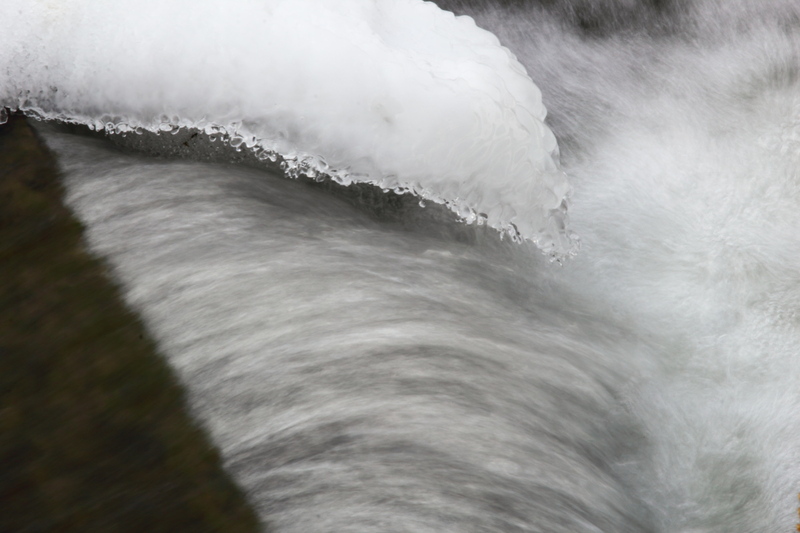 For some extreme scenes, three images may not be enough, it may take 5, 7, or even more exposures to get the final image correct. I haven’t run into one of those situations yet though, three images are usually enough if exposed correctly. Okay then, with the explanation almost out of the way, here’s an example of what Photomatix can do, starting with the before, an image shot with what the camera told me was the best exposure for this scene. 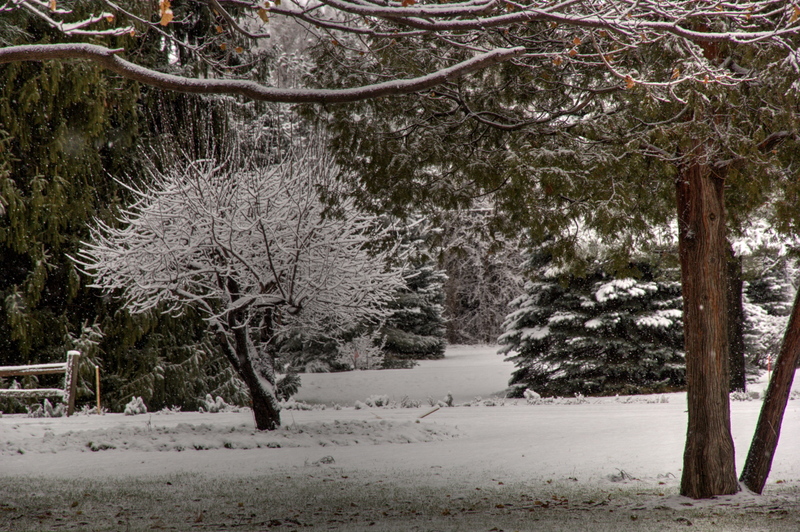 Now, here’s the HDR version of the same scene. 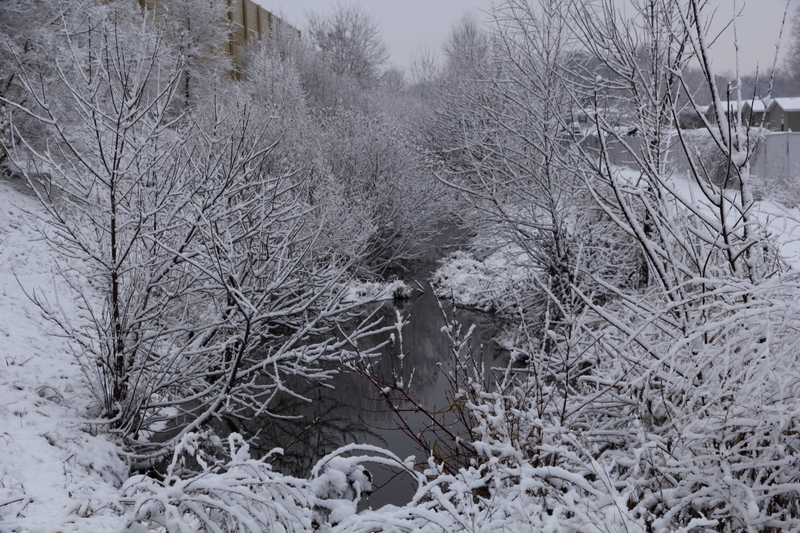 In the HDR version, you can see down into the water and the broken slabs of concrete that are there, while the creek looks basically black in the first image. That’s what I like about HDR photography, it puts the color that was in a scene, but lost by the limitations of the camera sensor, back into the scene. Here’s another example of that. 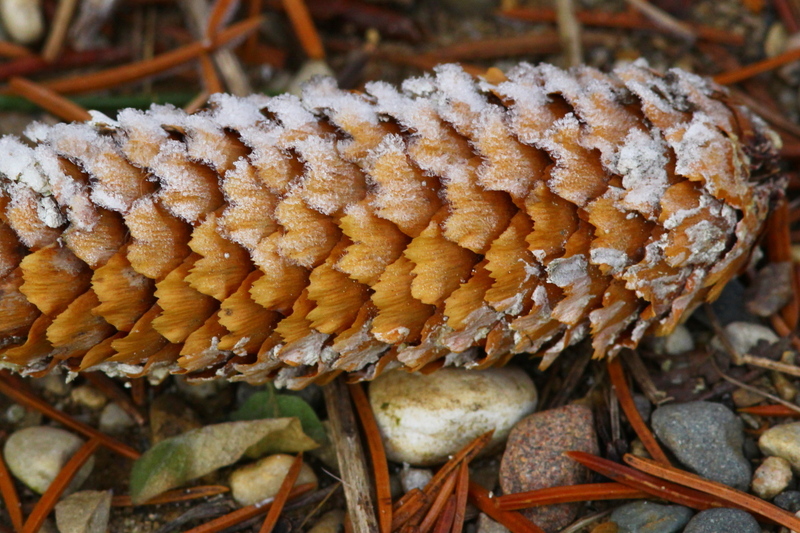 In the HDR version, you can see that the pine needles are green, and the tree trunks brown, not almost black as they are in the non-HDR version. These were shot the day after a storm moved through the area. 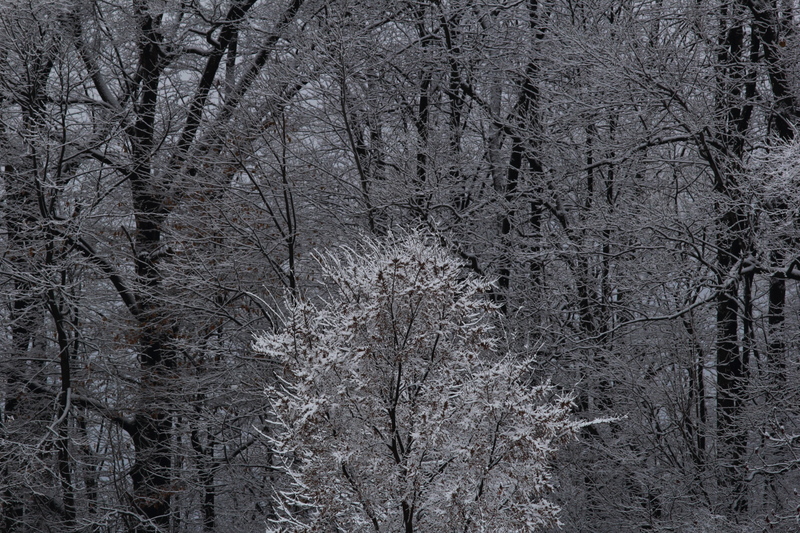 It started as snow, changed to freezing rain, then rain, back to freezing rain, and ended as snow. 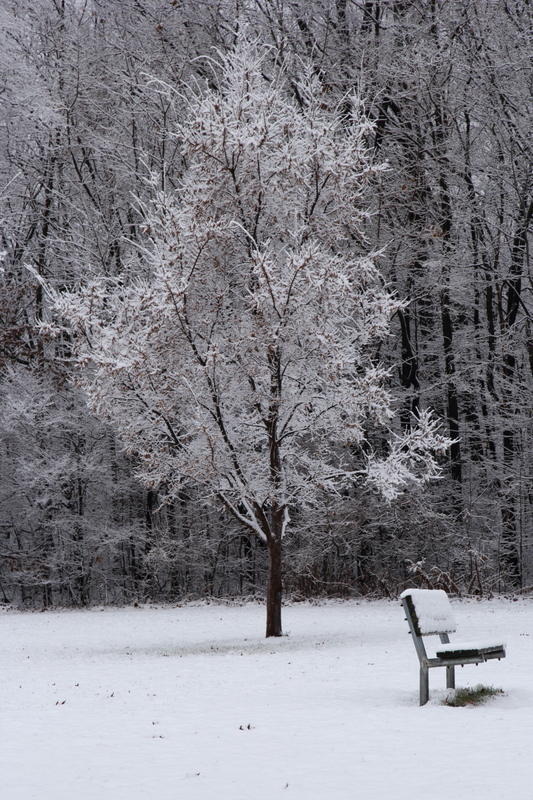 So, most of the trees had ice and snow clinging to them, it was a beautiful day, even if there was no sunlight to speak of. 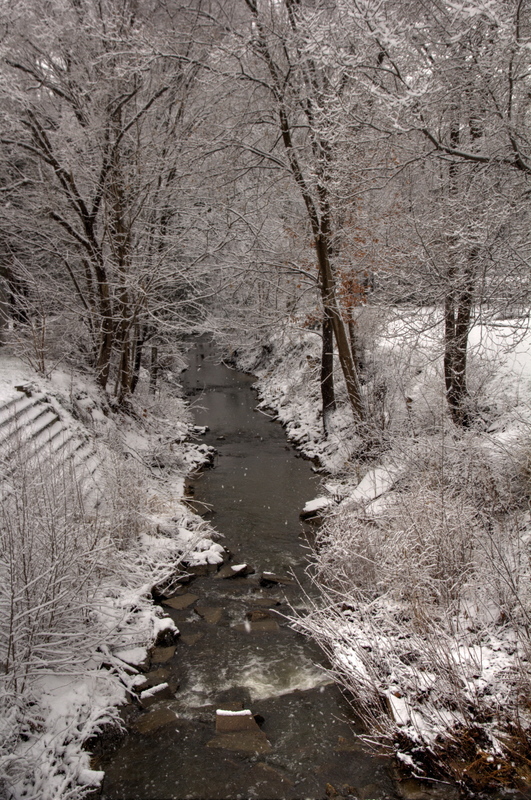 I had switched to the 15-85 mm lens early on, knowing that I’d be trying to capture the scenes presented to me by nature. Sometimes, I didn’t need to resort to HDR images. However, I set-up to shoot three images of everything with the expectation of loading the images into Photomatix if needed. And, here’s the best example of why from the day. I loved this scene, I don’t know why, but I did. 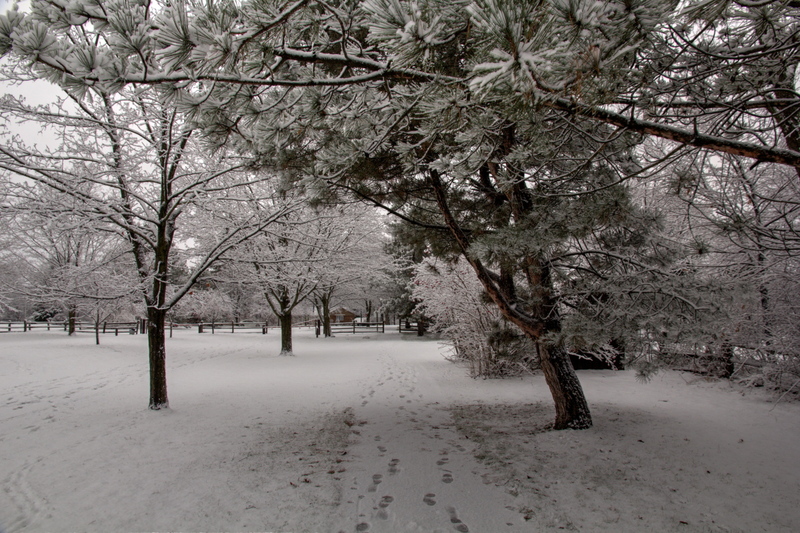 Of course, I was disappointed in that photo, the evergreens look black for one thing. 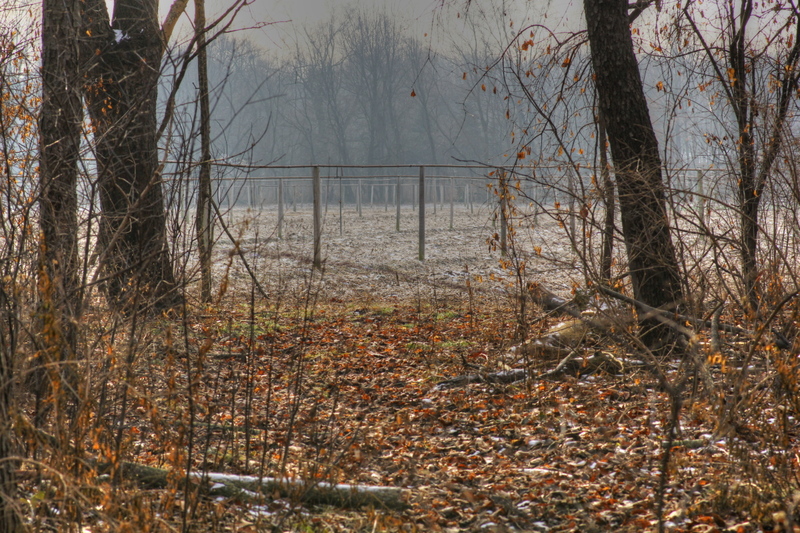 So, here’s the HDR image of the same scene. The color is back! 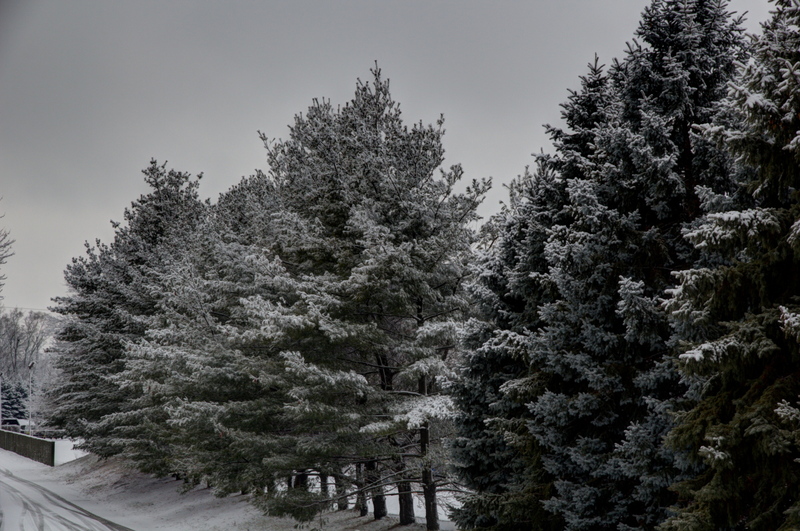 The evergreens look green, you can see the snowflakes in the air, just as I saw the scene when I shot it! However, Photomatix is not without its faults, some of those are actually related to my computer, but not all. For one thing, the adjustments available in Photomatix after you have done the basic merge of the images don’t make much sense as the adjustments relate to what you’d like to do to the image to improve it as far as the way that the adjustments are labeled. As I wrote before, I have watched several tutorials on how to use the Photomatix software, and the person doing the tutorial tells you to just play with the adjustments until you get the photo the way that you want it. Well, I’ve been playing, but Photomatix has several different modes, and in each mode, the adjustments are different. It also seems that the adjustments have different effects in different images, so I’ve been doing a great deal of playing. That’s one area where my old computer really limits what I do. Due to how slow my computer does the processing, I don’t have the patience to wait while Photomatix does its thing. I also don’t have the patience to dump the image if it doesn’t come out the way that I’d like, and start over. Another thing related to my computer is the small view that I get of the processed image. I may think that I have it right, but after I save it, and then view the image full size, I found that I missed, usually by getting the image too bright. And, there are times when I like both the HDR and non-HDR version of a scene. Switching gears here for a while, I’ve also been using the Canon Digital Professional Photo editing software that came with my camera. That software is modeled after Lightroom, and intended to be Canon’s version of Lightroom, but it falls far short of Lightroom. It will however, allow me to tweak RAW images at least to some degree. 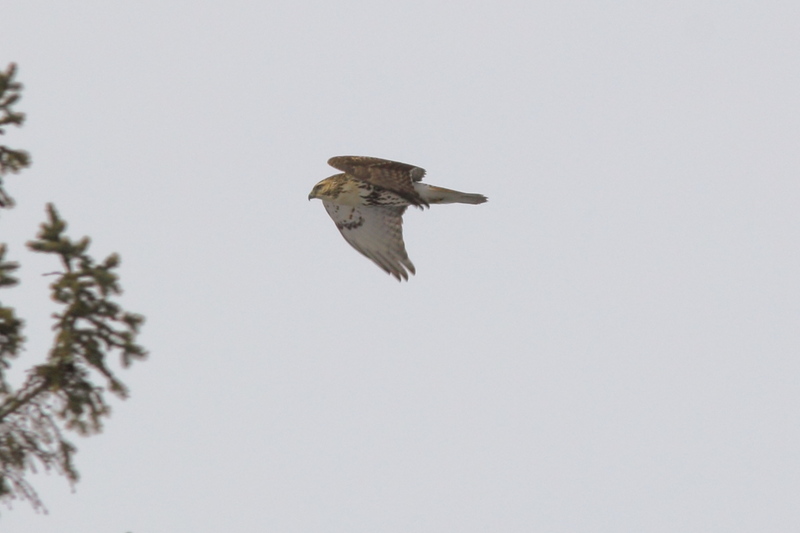 That’s Bruiser, the male red-tailed hawk doing a fly by for me. 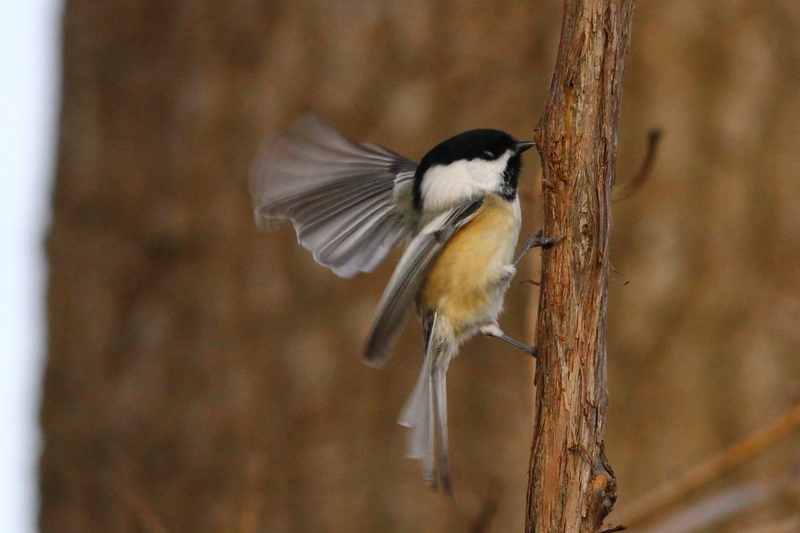 I used the Canon DPP software to brighten up the shadows under his wings a little. That software is better than nothing, but it is lacking many of the features of Lightroom, and doesn’t do a very good job of what it can do. It also has another serious short-coming, it will only edit RAW images, not jpeg or tiff images. I save the output from Photomatix in 16 bit tiff format to preserve as much image quality as possible. I tried doing what most people who use Photomatix do, doing the final tweaking of a HDR image in Lightroom, but the Canon software that I have doesn’t allow that. But, the Canon software was free, and it’s all that I have to work with right now. I may find that once I have a computer that can handle Lightroom, that I won’t need to use the Photomatix HDR software as often, but only time will tell about that. I do know that some scenes call for a HDR image, no matter how good Lightroom may be for basic editing. Anyway, here’s the remainder of the photos that I shot after the mixed precipitation storm, some are HDR images, some aren’t. 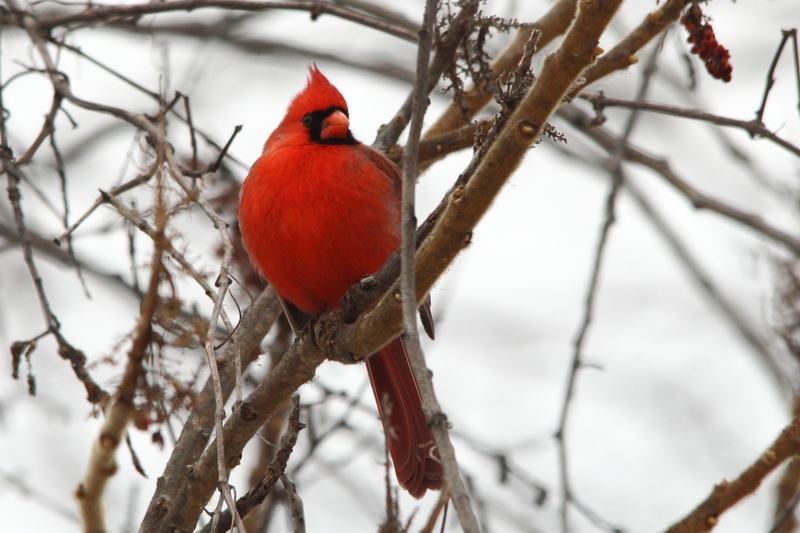 So, on to other things, how about a few male cardinal photos to brighten up the winter. 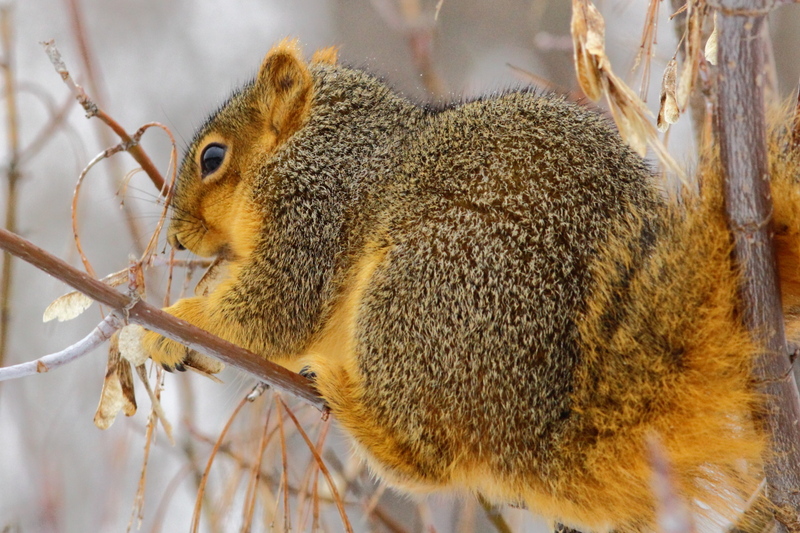 And, for all of you squirrel lovers out there, a big, fat fox squirrel. 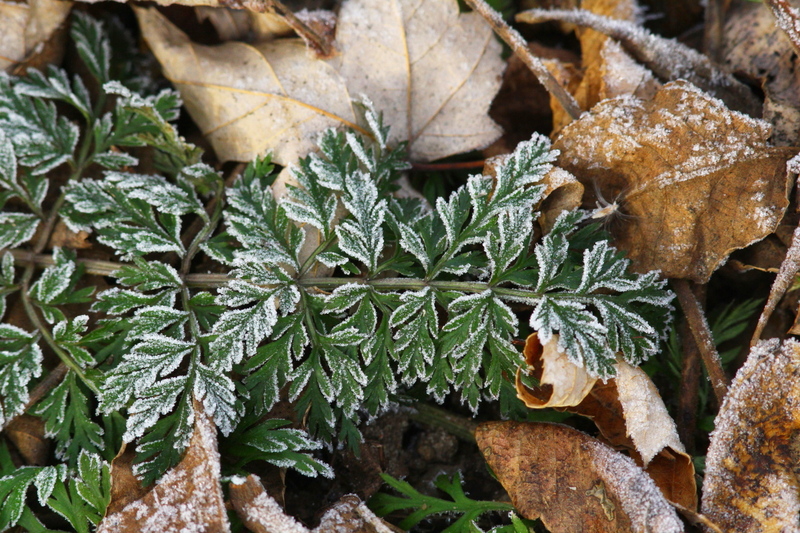 After the extremely cold air retreated back to the north for a few days, I found this. 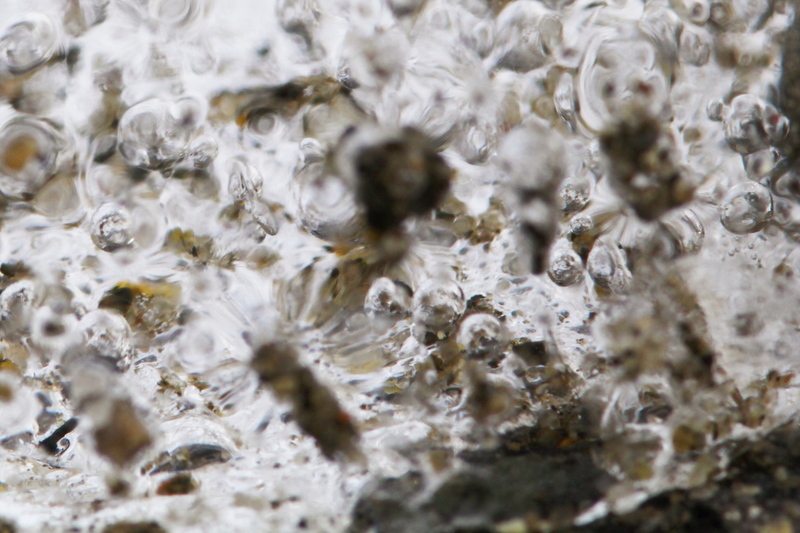 There are a few species of stoneflies that hatch during the winter, I don’t know which species that one is, but it isn’t unusual to find them along rivers and creeks on a slightly warmer winter day. Oh, that reminds me, I’ve forgotten a few things. One, I did some really dumb things in the past. In preparation for my new computer, I went back and looked at a few of the photos that I had shot with my old Nikon to see if I should import them into Lightroom once I have it. No, there’s no need, not only are most of the photos poor quality, but I saved them the same size and quality as they appeared in my blog. There’s really no reason to import them into Lightroom, as there’s nothing worth trying to improve in the state that I saved them in. It was an eye-opening experience though, seeing how much the quality of my photos have improved since I made the switch from the old Nikon to my current Canon gear. That’s not to bash Nikon, but better lenses on a better camera equals better photos. Not all of my editing of images has been done on the computer, sometimes it happens in the camera. Here’s the color version of some ice on the creek…. …then, I switched the camera to high contrast black and white for this one. 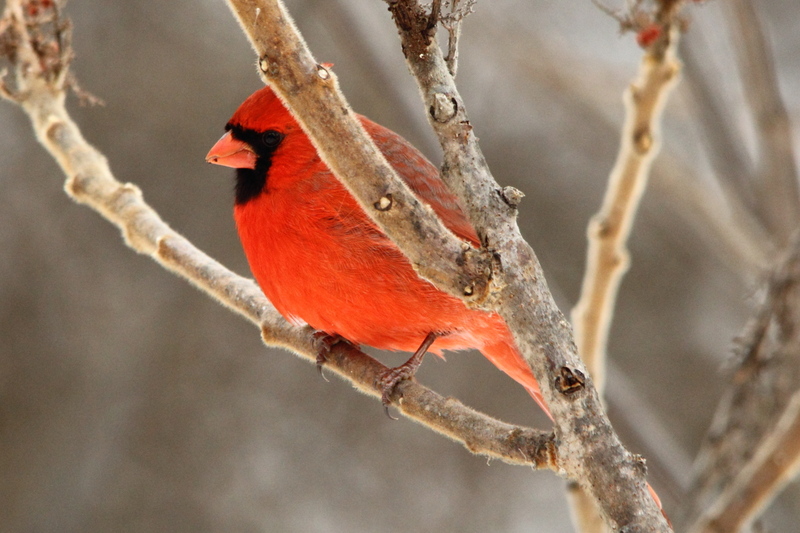 How about another cardinal to brighten things up again? Do you remember the “selfie” that I had in a recent post? 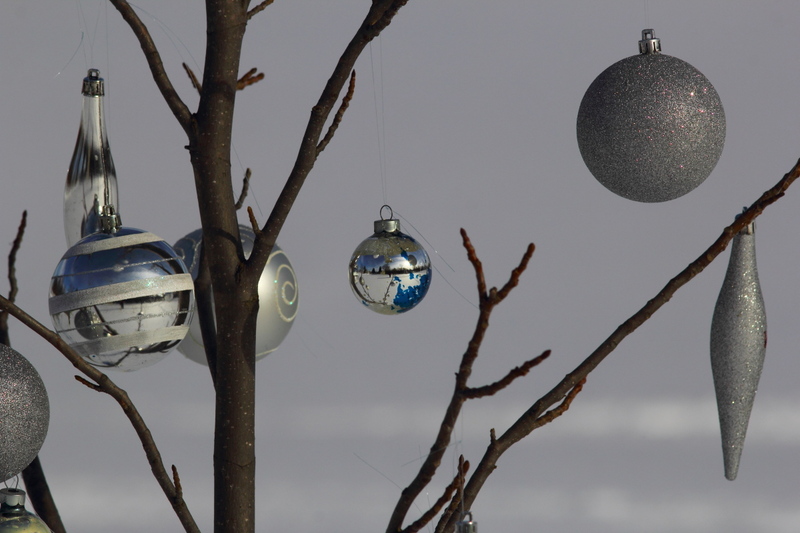 Here are the ornaments that decorated one of the small trees here. And here’s another selfie, this one has the Death Star in it. Here’s another image shot during the few minutes of sunshine that we had this past few weeks. I suppose a few more birds are called for. 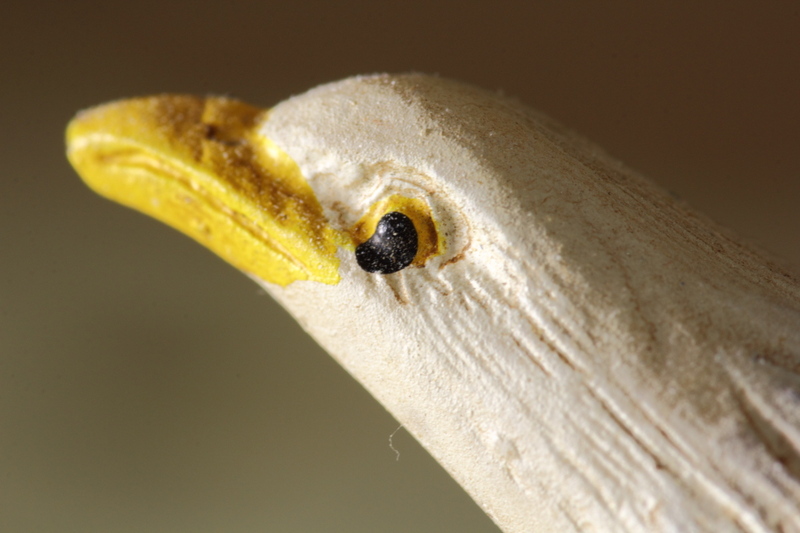 I threw in the eagle as I was playing with the new ball head that I recently purchased and mounted on my monopod. Since I didn’t find any subjects outside worth shooting, I played around indoors to see how well that set-up worked for macros. So far, so good! The last two photos for this post are of the same thing, shot at slightly different settings. I can’t decide which one I like best, so here’s both of them. It’s now Friday morning as I type this part before I go into work today. I have 42 hours in already this week, and I haven’t had to do a Chicago run this week either, so I’m a happy camper. My paycheck should be a good one, which will get me that new iMac soon. 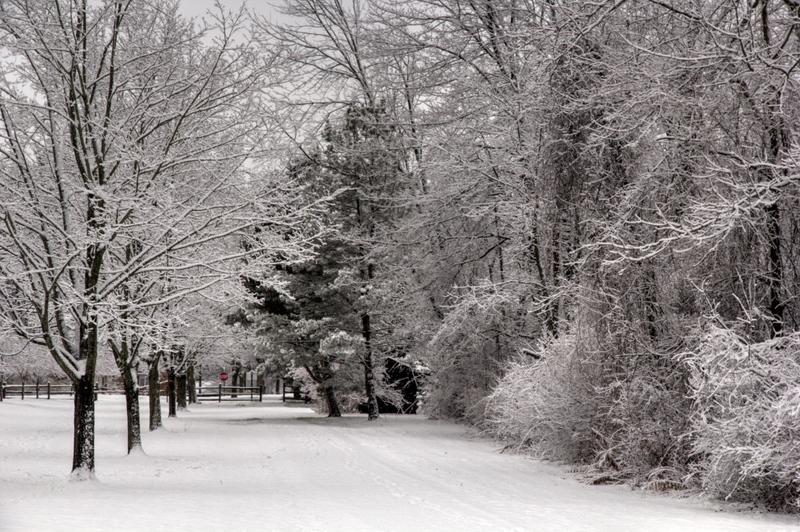 I think that I’ll stay home this weekend, and just walk around here. 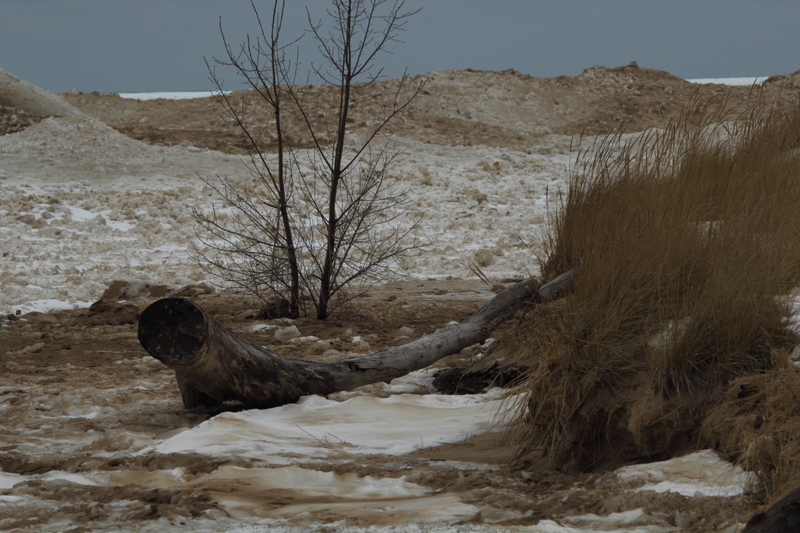 As I said earlier, I went to the Lake Michigan shoreline last Sunday with the promise of some sunshine that never materialized, so most of my photos were shot in very poor light. It doesn’t make much sense to drive that far when the weather forecast is calling for clouds and snow, I can stay home and shoot poor photos and save the money that I’d spend on gas towards the new computer. Well, I was going to click the publish button yesterday morning before I left for work, but changed my mind, thinking that I’d read through this post again first after I got home that night. That didn’t happen, as I had my load changed at work, from a local run to an expedited run to Honda of America near Columbus, Ohio. So, I picked up and delivered the load on time, but had to spend the night at a motel since I didn’t have enough driving time left under DOT regulations to make it home last night. The upshot of this is that I made some really big money this week, and it shows that the dispatchers trust me to run a load that absolutely has to be delivered on time. Not only that, but I was thanked to the point of embarrassment for taking such a run on no notice, and getting it done correctly. Like any job, there are things about this one that I dislike, but the way that management treats their employees more than makes up for the dislikes. 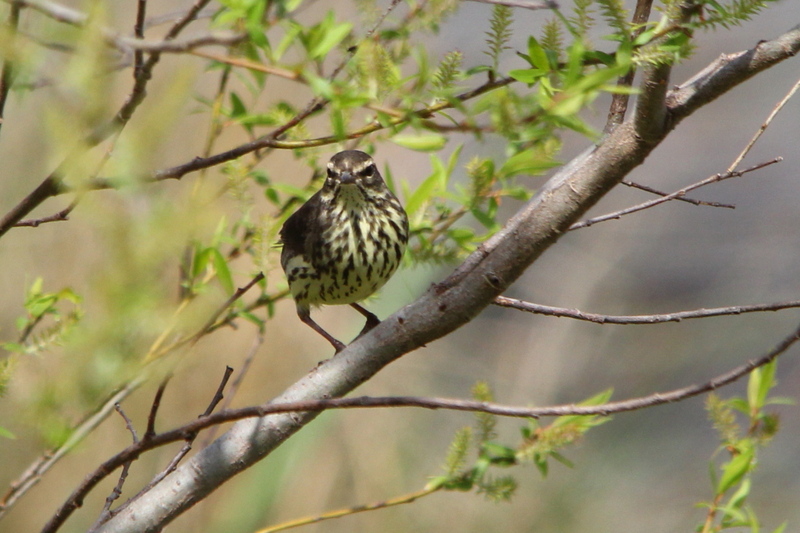 The northern waterthrush is one of the larger New World warblers. 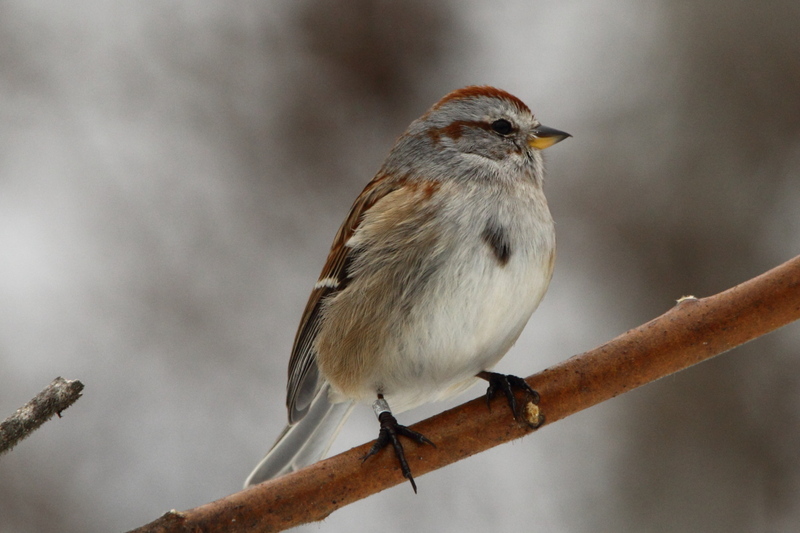 It breeds in the northern part of North America in Canada and the northern United States including Alaska. 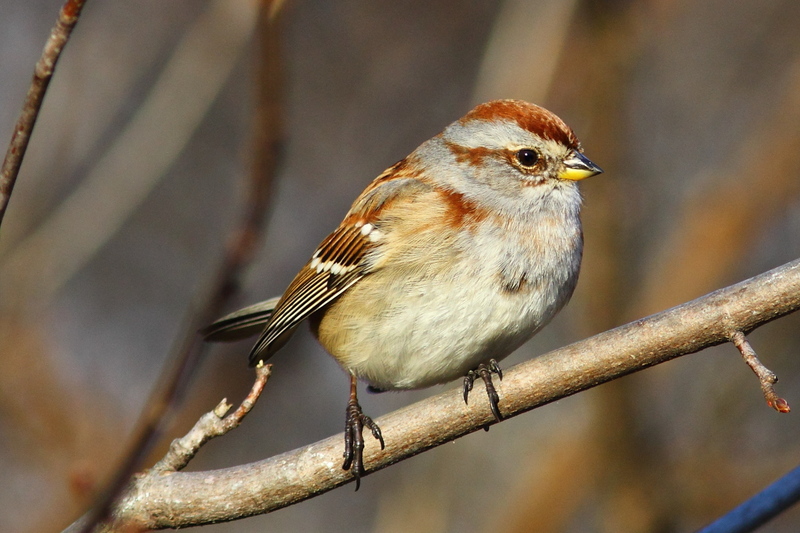 This bird is migratory, wintering in Central America, the West Indies and Florida, as well as in Venezuela, Colombia, and Ecuador. 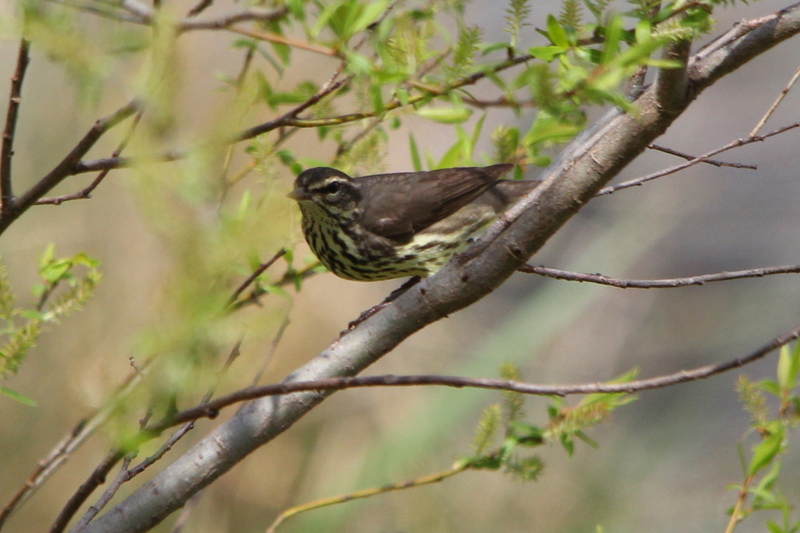 The northern waterthrush is a large New World warbler (and not a thrush, despite the name). It has a length of 12–15 cm (4.7–5.9 in), wingspan of 21–24 cm (8.3–9.4 in) and weighs between 13 and 25 g (0.46 and 0.88 oz) Among standard measurements, the wing chord is 6.8 to 8.2 cm (2.7 to 3.2 in), the tail is 4.5 to 5.7 cm (1.8 to 2.2 in), the bill is 1.1 to 1.2 cm (0.43 to 0.47 in) and the tarsus is 1.9 to 2.3 cm (0.75 to 0.91 in). 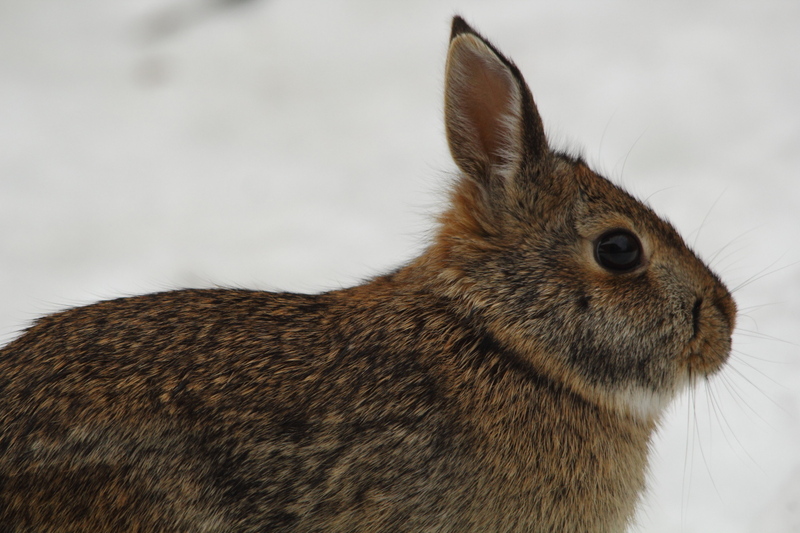 On the head, the crown is brown with a white supercilium. The bill is pointed and dark. 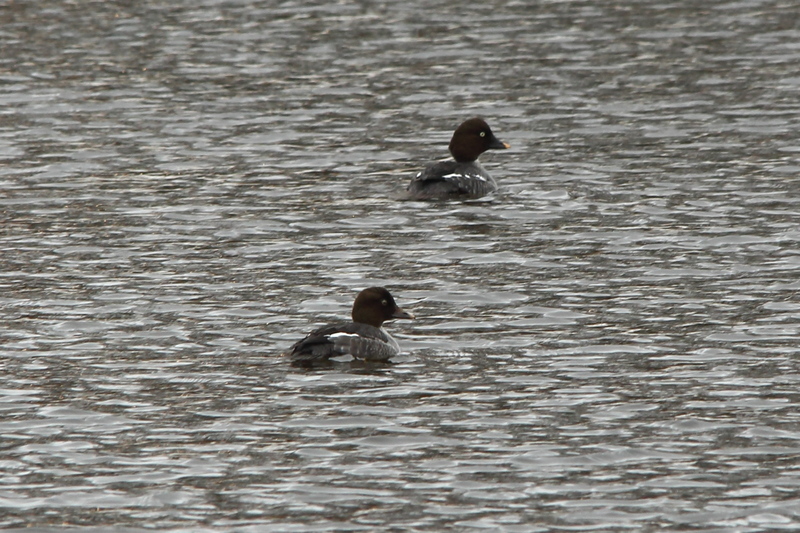 The throat is lightly streaked brown to black with heavier streaking continuing onto the breast and flanks. The back is evenly brown. Sexes are morphologically similar. 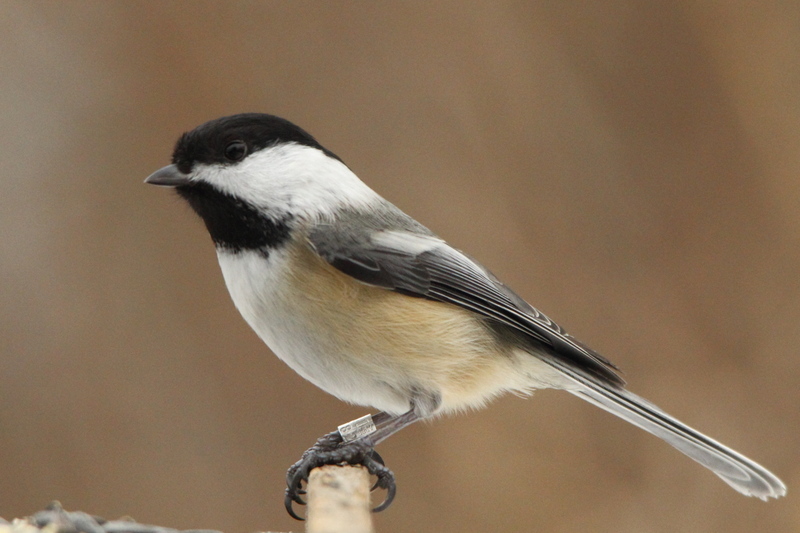 Young birds have buff, rather than white underparts. 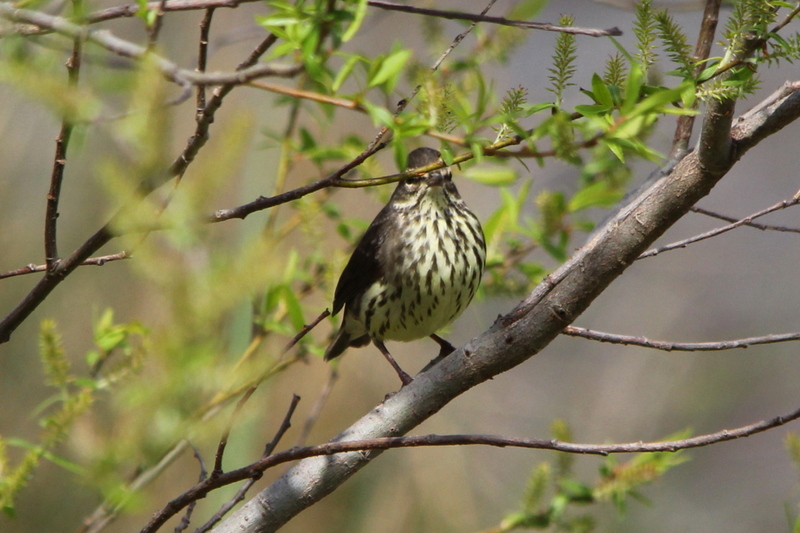 The only species bird watchers confuse with the northern waterthrush is the closely related Louisiana waterthrush, which has buff flanks, a buff under-tail, and bright pink legs. 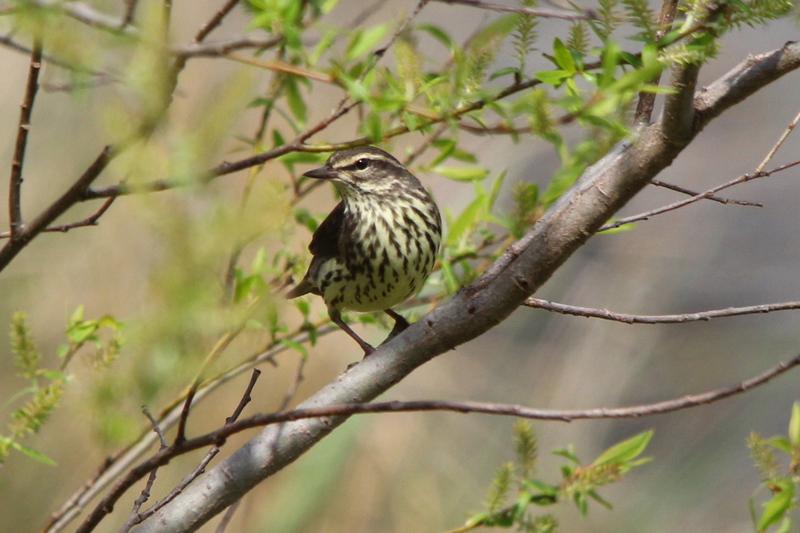 The Louisiana waterthrush also has a whiter throat with fewer streaks. 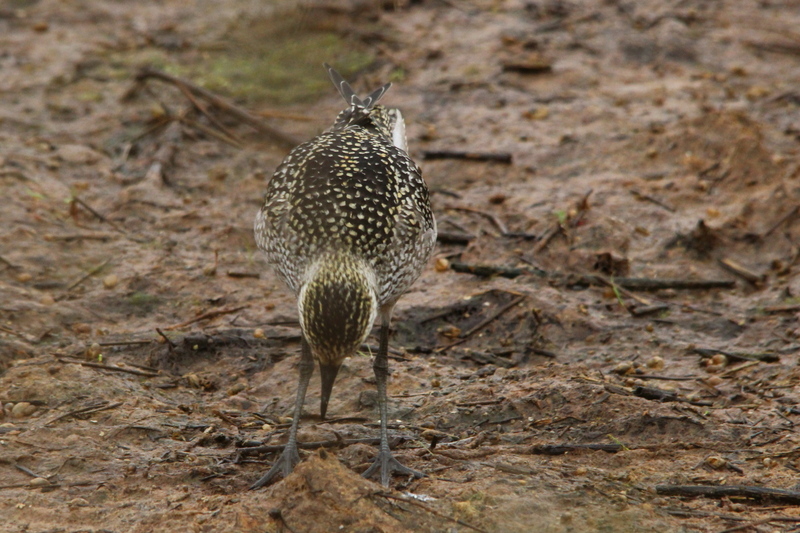 Both waterthrush species walk rather than hop, and seem to teeter, since they bob their rear ends as they move along. 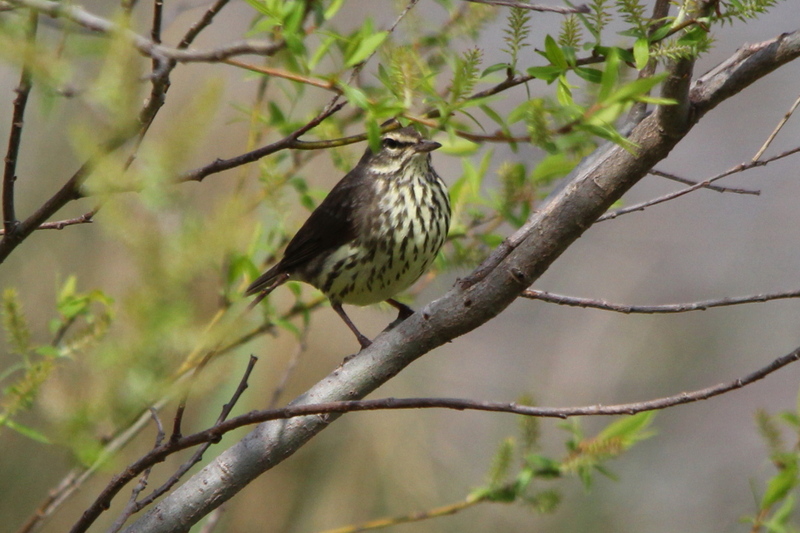 The breeding habitat of the northern waterthrush is wet woodlands near water. 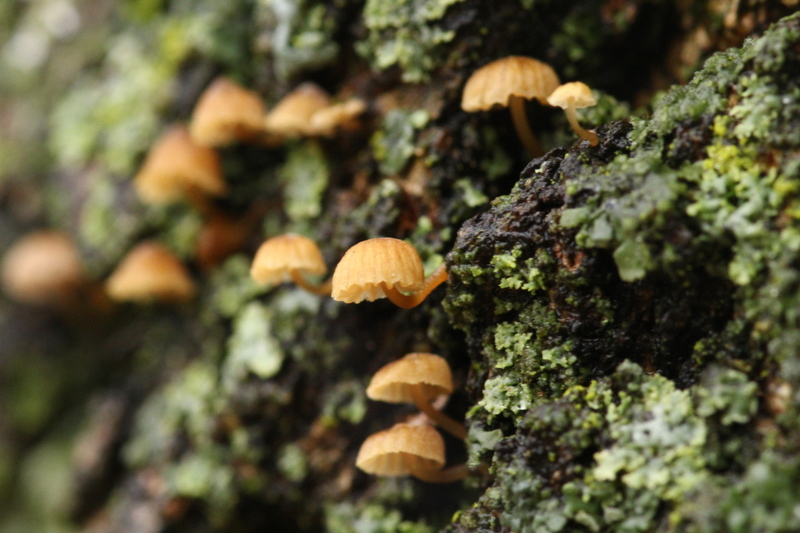 It nests in a stump or among tree roots where it lays three to six eggs, cream or buff-colored, with brown and gray spots. 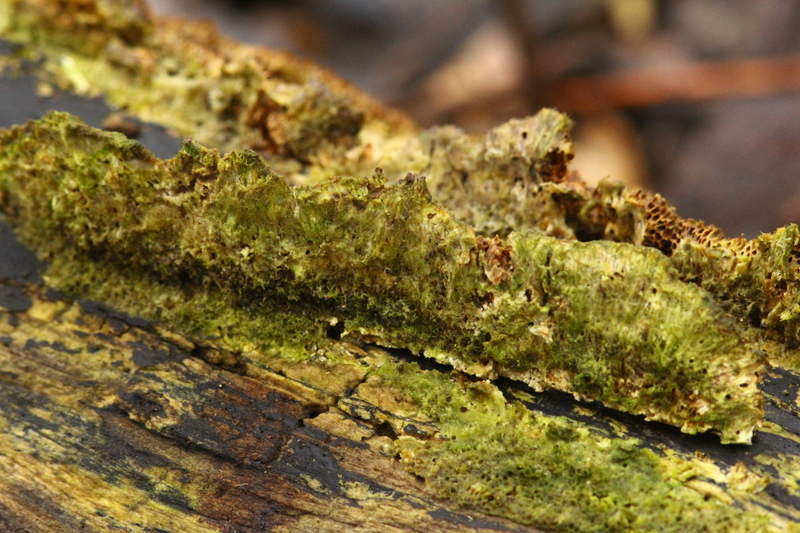 These eggs are laid in a cup nest constructed of leaves, bark strips, and rootlets. 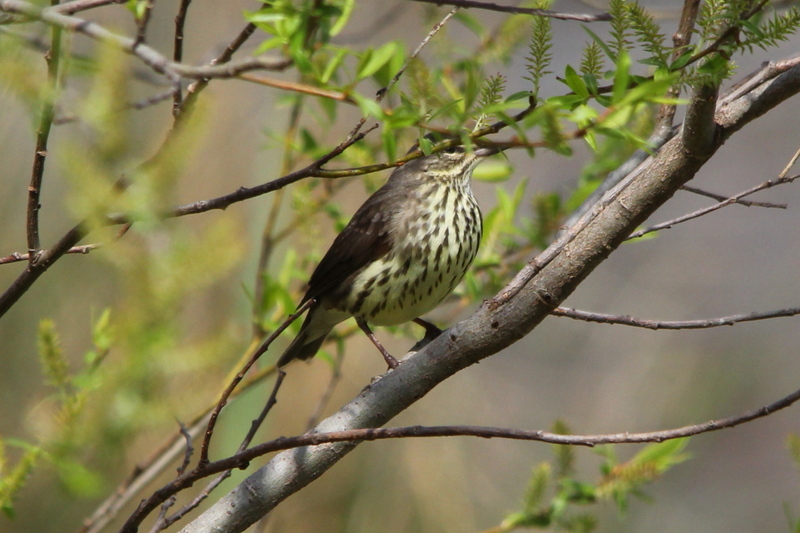 The northern waterthrush is a terrestrial feeder, eating insects, mollusks, and crustaceans found amongst leaf litter. Its song is a loud swee swee chit chit weedleoo, and its call is a hard chink. This is number 172 in my photo life list, only 178 to go! Where do I begin? It’s been so long since I shot many of the photos that will appear in this post that I don’t remember many of the details of where and when I shot them, other than they were all shot around my apartment as I went on walks around here. 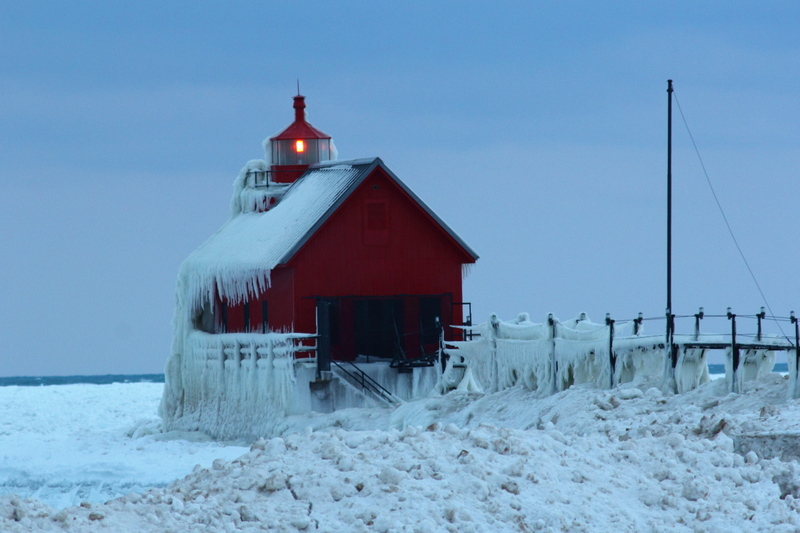 From my last post, you know that I spent a lot of time on the road over the Christmas weekend, driving back and forth to various places along Lake Michigan. I decided to save money and stay home over the New Years weekend. Not that there were many things to photograph around here, or good light when I did want to shoot a photo. 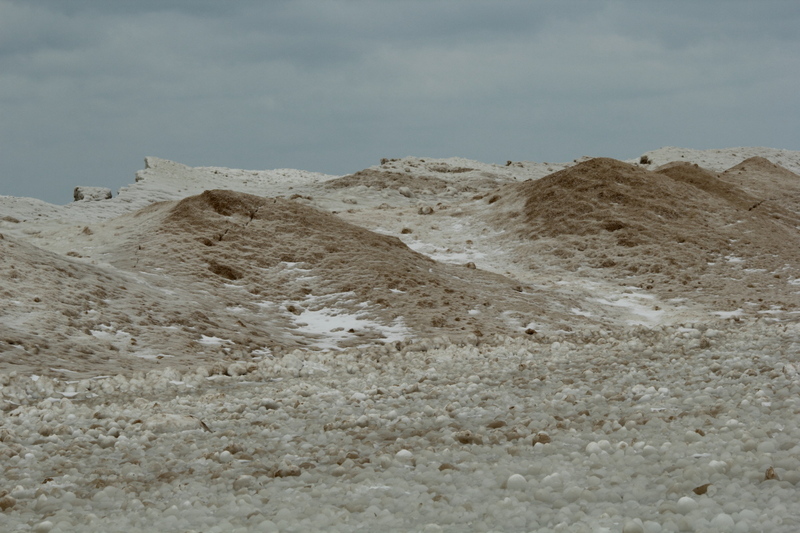 During one week in December, we went an entire week with just seven minutes of sunshine, Lake Michigan was working overtime to produce the lake effect clouds that kept this area so dreary for most of the month. So, I think that I’ll skip way ahead, and start with a photo from yesterday, when there was some sunshine. 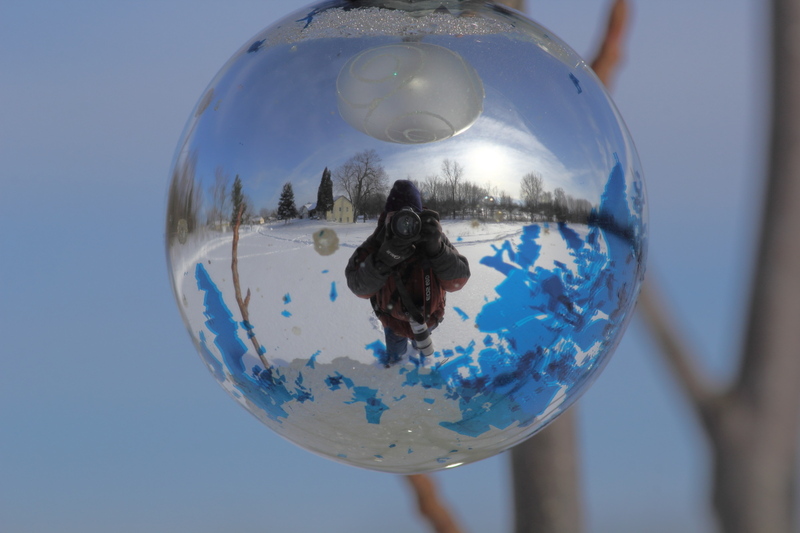 Yesterday was the first time that I went for a walk while carrying my monopod with the new ball head attached to it, and I was looking for interesting things to try that set-up out on, but this was the best thing that I could find. 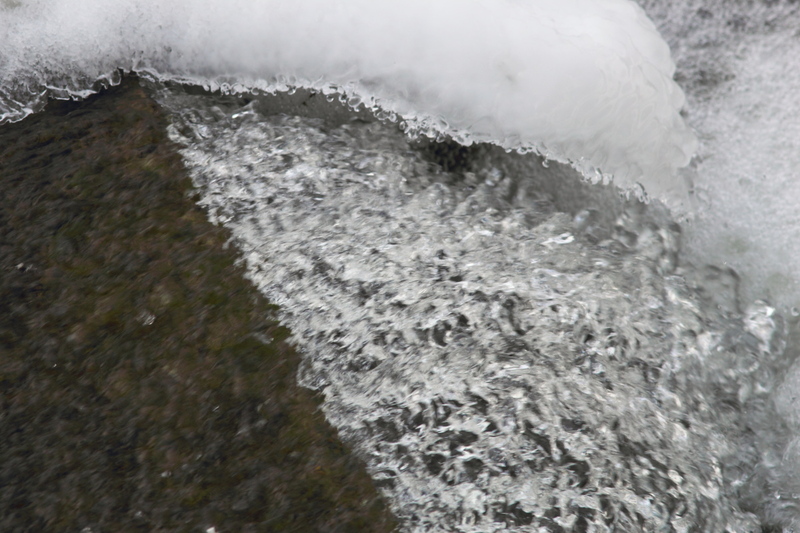 …and slow the shutter down to get this at 1/15. The ball head has a quick release plate, so I don’t have to screw the monopod to the camera body or tripod mount of the lens if so equipped, which makes it much easier to use. I can hold the monopod vertical, the position it is most stable in, and tilt the camera as needed using the ball head, works like a charm with the macro and wide-angle lenses! The 300 mm lens is pushing the capacity of the lightweight head that I bought, but I found that it will work in a pinch. Now then, let’s go back in time to the middle of December, so that I can post the photos in the order they were shot, more or less. 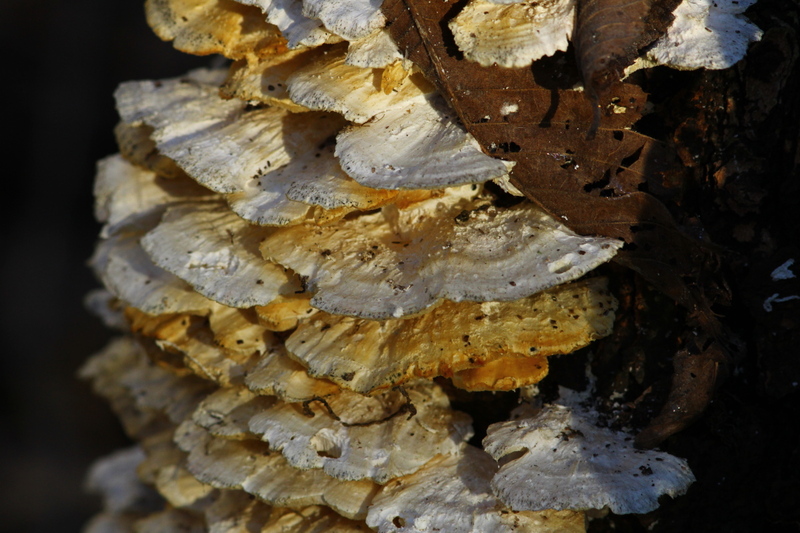 I’ll start with some fungi, just because I liked the way that the light that day fell on them. 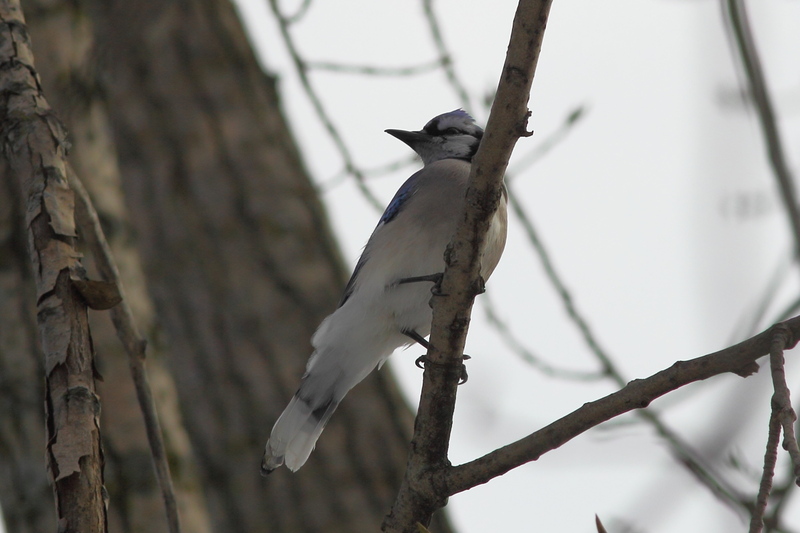 Most of my photos of birds looked more along these lines, high noise, low resolution. 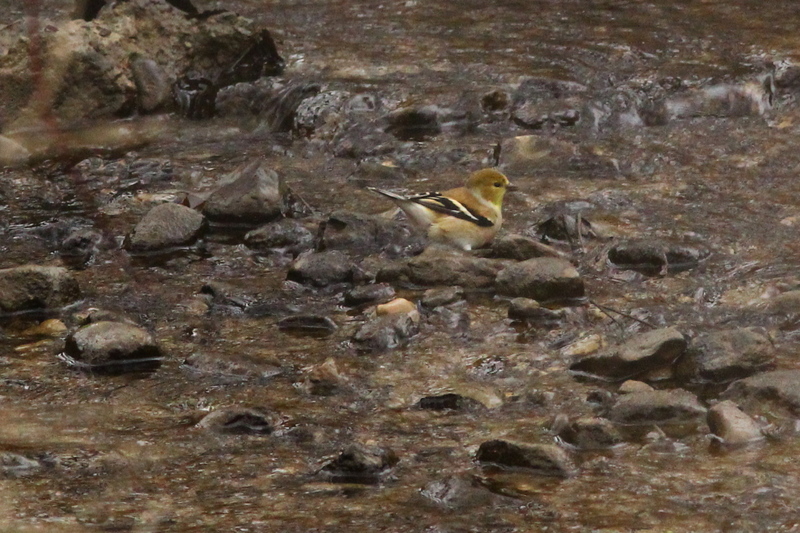 Since I’m on goldfinches, here’s one that was taking a bath in a creek. …then noticing me watching it. 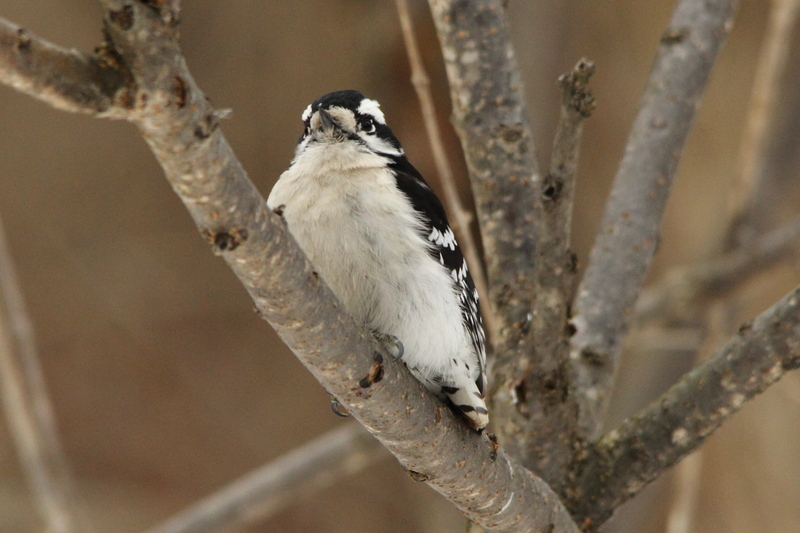 Maybe I’m losing my touch, but I can’t seem to get many birds to pose for me lately. 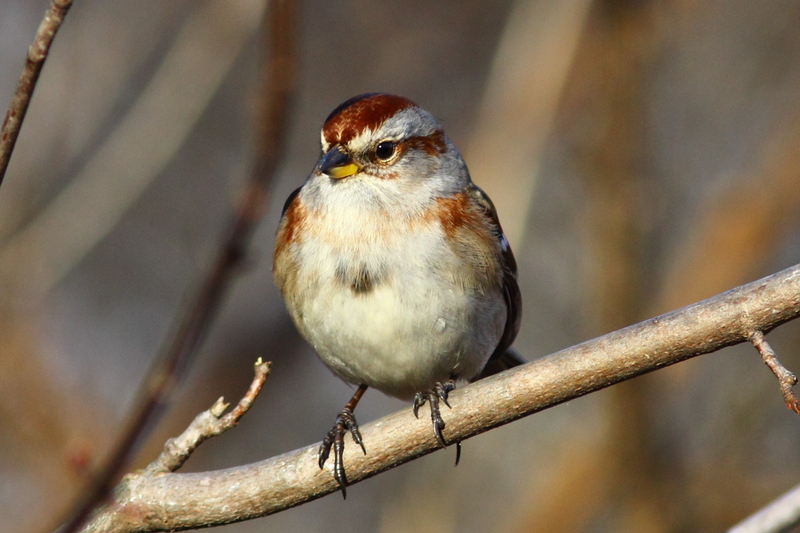 I’m not the only one complaining about that, several other people I have spoken to have been saying that all the birds seem very skittish this year. I have no idea why that would be, but that’s how it’s been the last few months. The poor light also interfered with my attempts to shoot macro photos, here’s one of the better ones of late. It’s hard to get the lens stopped down for a good field of view needed for macros, and like a dummy, I don’t carry my flash or LED light in poor weather, as I’m worried about ruining them, and/or battery life in cold weather. 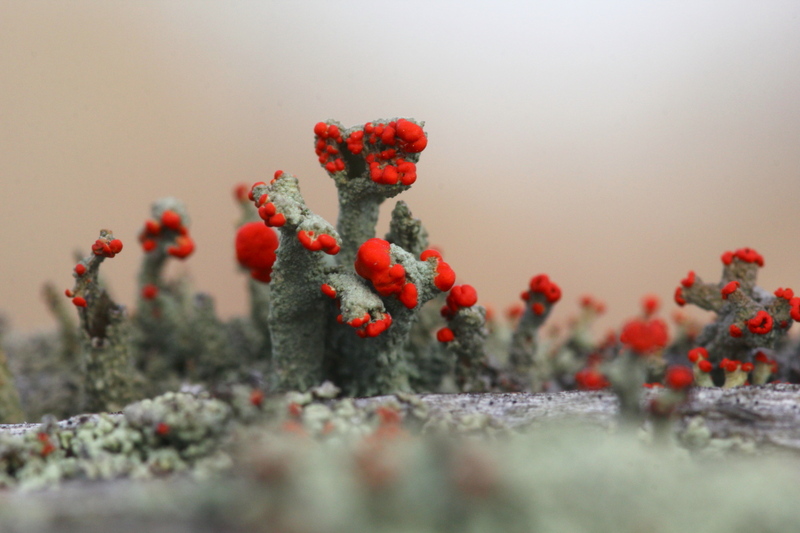 In some areas of the country, they get rain, which allows fungi and lichens to become good subjects for photos, then sunshine to shoot photos of those subjects. Around here, as I’m sure that I’ve mentioned more than a few times, we get rain and nearly continuous cloud cover for days after this time of year. 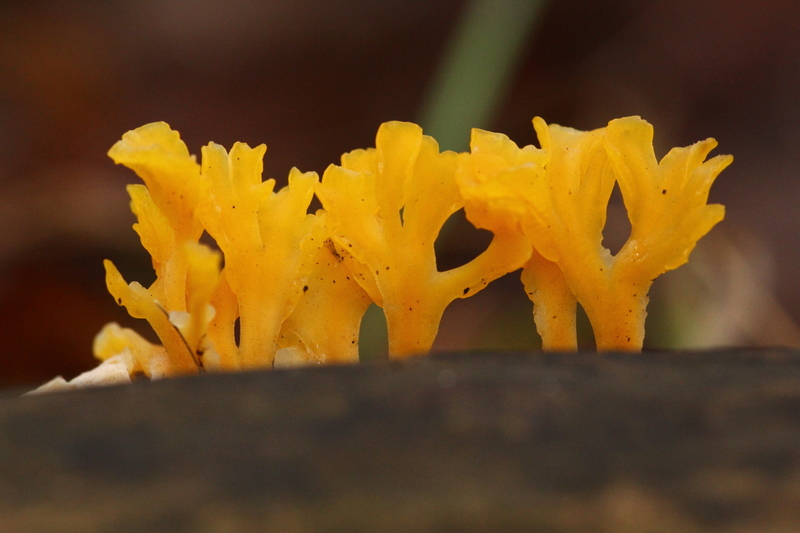 Well, on one rainy day, I noticed this brightly colored lichen. 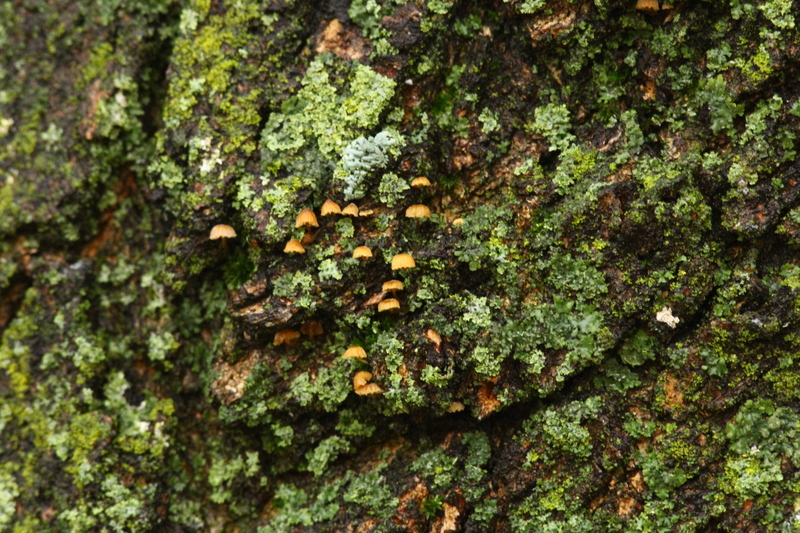 And, as I was trying for photos of the lichen, I noticed these tiny fungi growing nearby on the same tree. 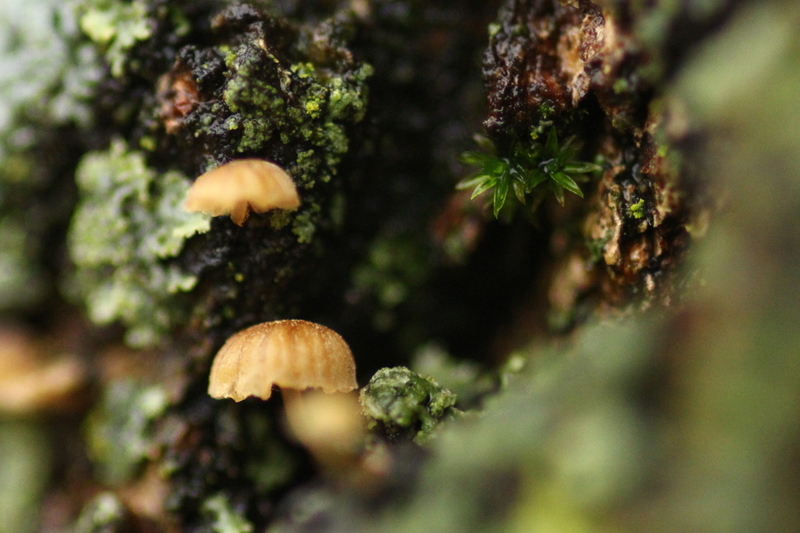 I switched to the macro lens for these, but they’re not very good since the light was so bad. 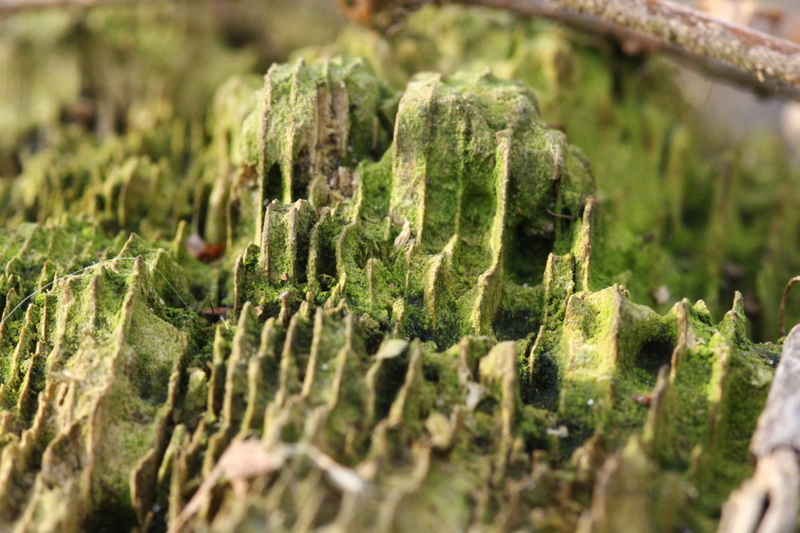 As is almost always the case, I saw things through the macro lens that had escaped my notice before. 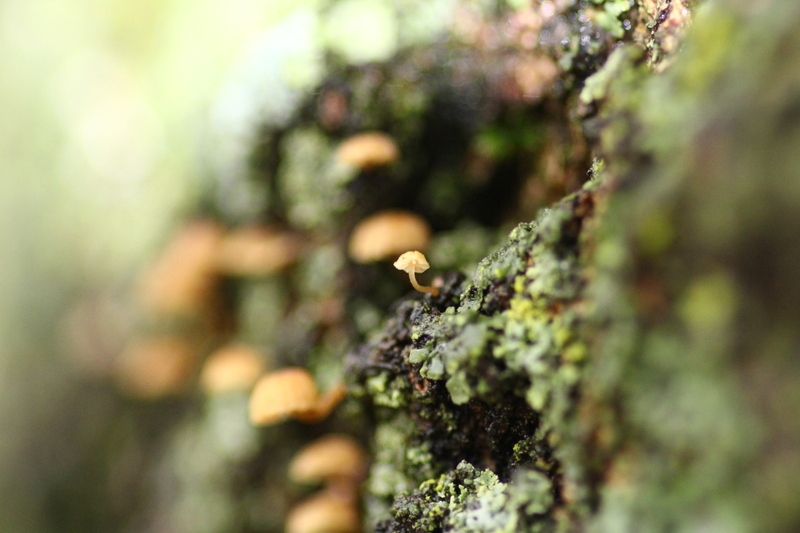 That section of the tree had a miniature jungle growing on it, but I was frustrated trying to get better photos. 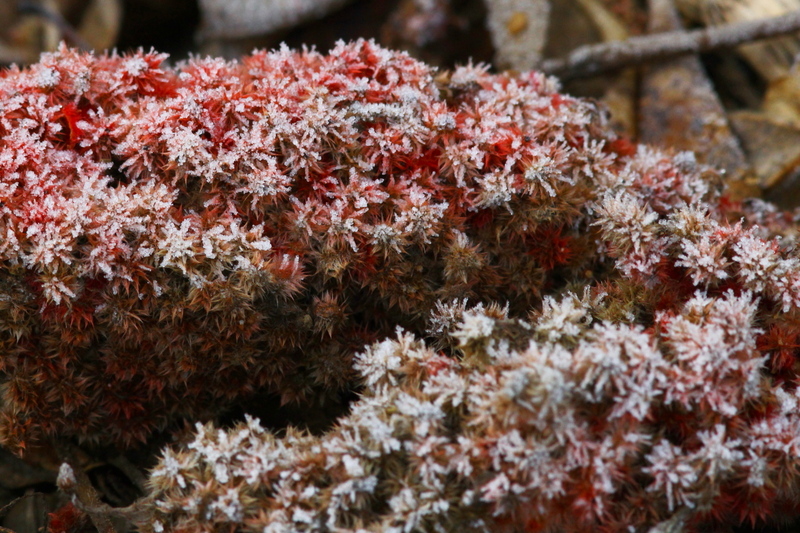 I don’t know if some of those things are mosses or what they are, but they looked interesting through the macro lens even if they didn’t photograph well. Of course, it’s hard to get good photos when many of the days when I was trying looked like this. 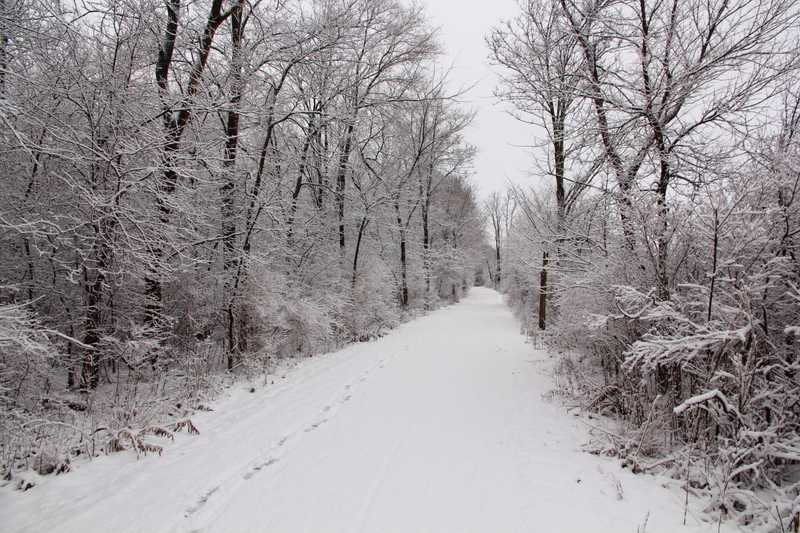 However, the snow never stuck around for more than a day or two until New Year’s Eve, but I’m getting ahead of myself again. 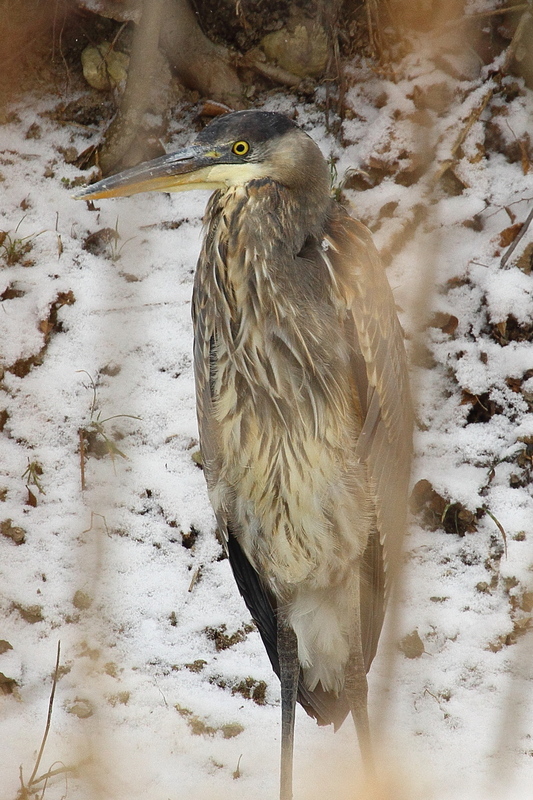 On the same day as I shot that last photo, I was very surprised to find this heron taking shelter from the storm in the brush along the creek in the park. 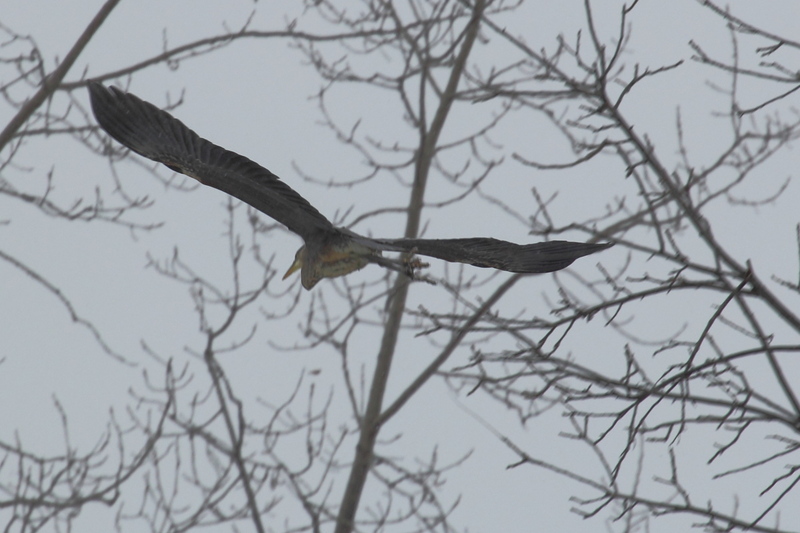 I couldn’t find an opening in the brush to get a clearer shot of the heron, and while I was trying, the heron took off. 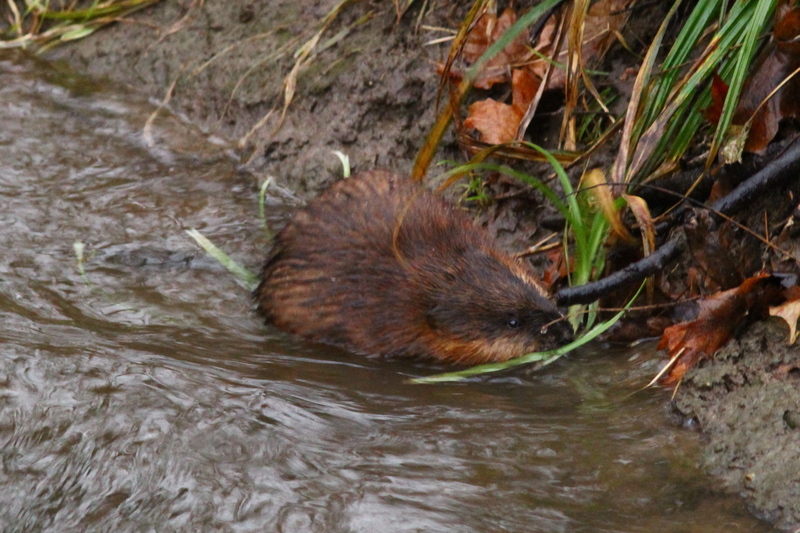 Macro photos aren’t the only type of photos that need some light for depth of field, here’s a muskrat taken on one of the many dreary days here. 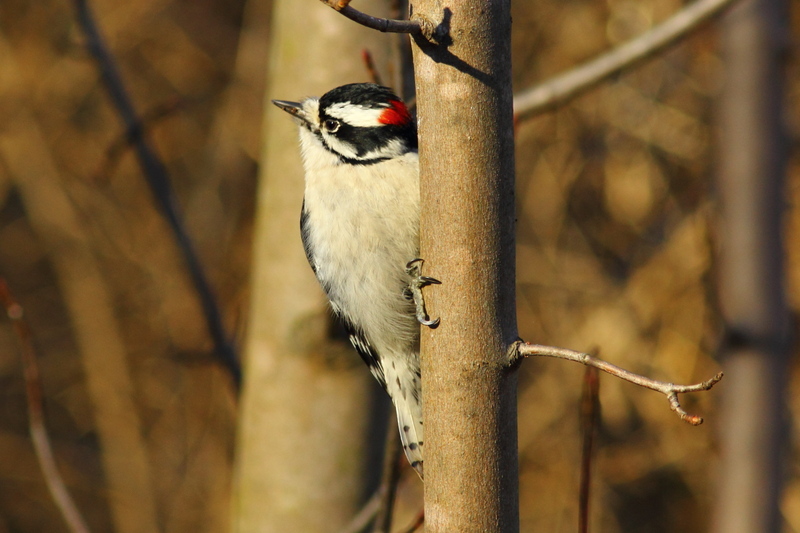 Its eyes are relatively sharp in that photo, but the rest of it is blurry because I had to shoot with the lens wide open, hence, no depth of field with the 300 mm prime lens. I have to keep telling myself that I walk for the exercise, the photography is just something to make the walking more interesting, but it’s becoming harder to convince myself of that as I immerse myself deeper into the photography. 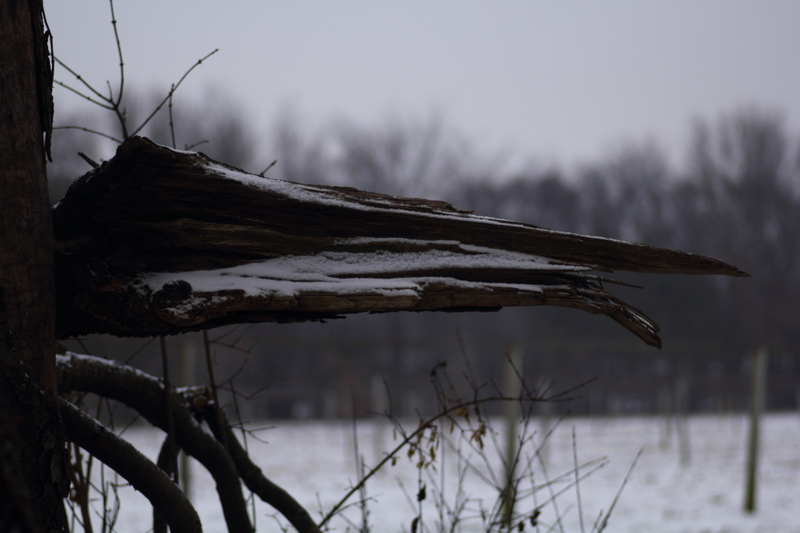 So, I tell myself that even though the images are crap, they’re still a record of what I saw when walking, like the heron and muskrat. Trying to think positively, we’re about half-way through January already. While February is often the coldest winter month around here, I can already tell that we’re getting longer hours of sunlight, even through the clouds. 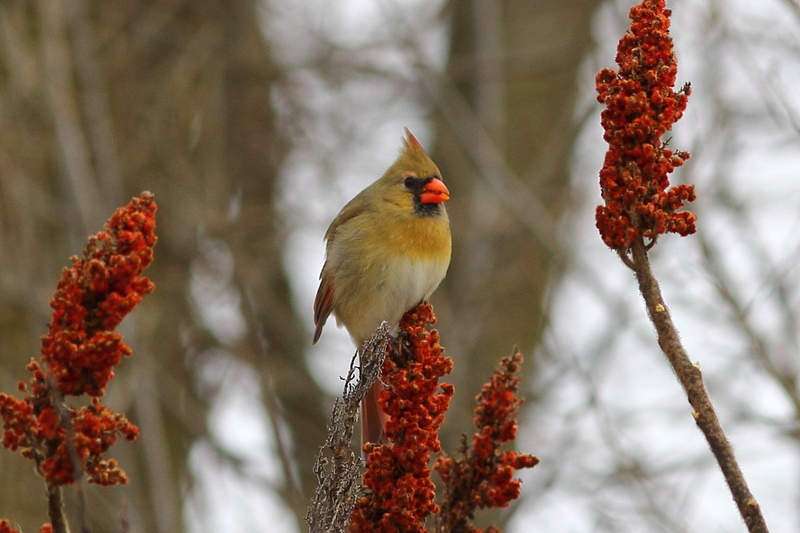 March is a wet, sloppy month, but by then, it’s warming up, the birds are singing spring songs, and those birds that migrated south are beginning to trickle back to this area, so, it won’t be long now. 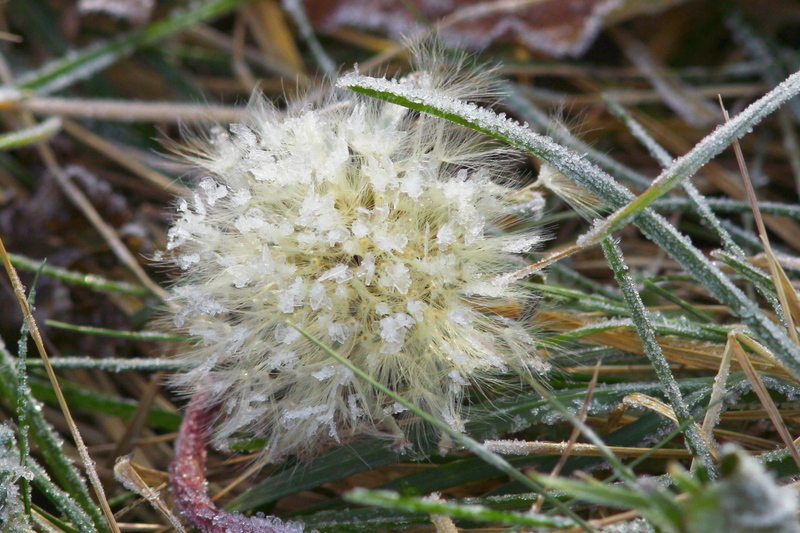 The first flowers of spring will soon be appearing shortly. So, I have to accept the fact that for a few months each winter, good nature photos are going to be few and far between, unless I’ve saved some from the summer months, like this one. 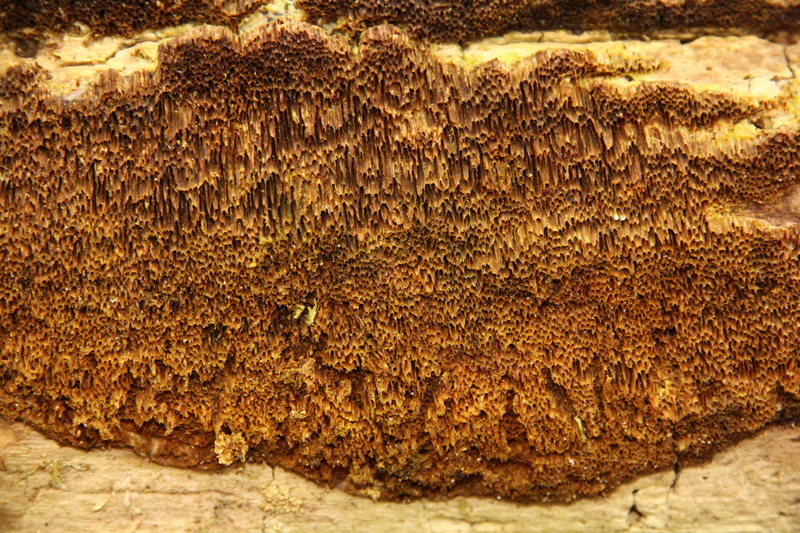 Now then, back to what’s normal around here this time of year, fungi that I had to use the flash on to get any usable photo at all. One good thing, I’m getting better at controlling the flash built into the camera. I’m also learning to take advantage of every second of good light that I get. 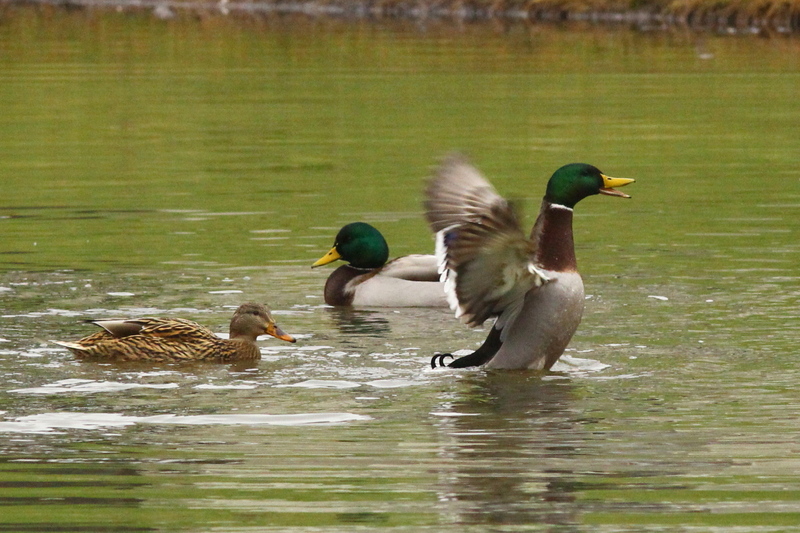 I had all summer to hang around the ponds and shoot mallards in action, but did I? 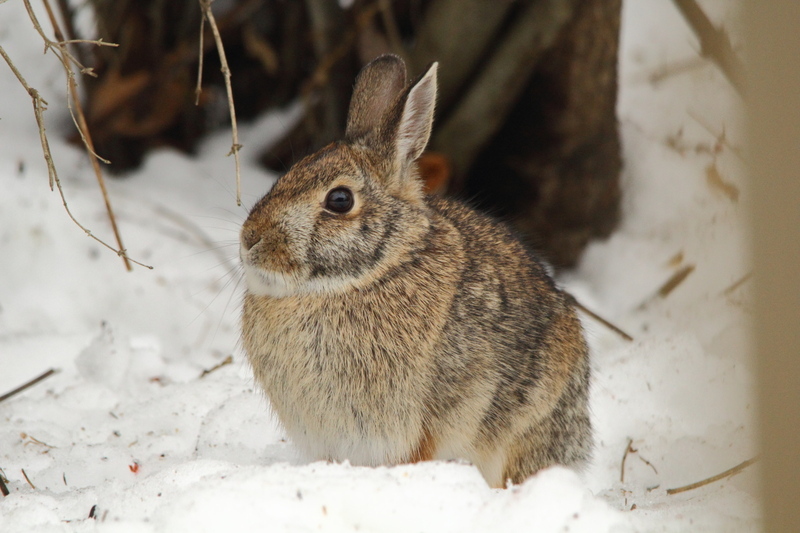 Of course not, I waited until winter to shoot them. That was because I had plenty of other subjects to shoot. 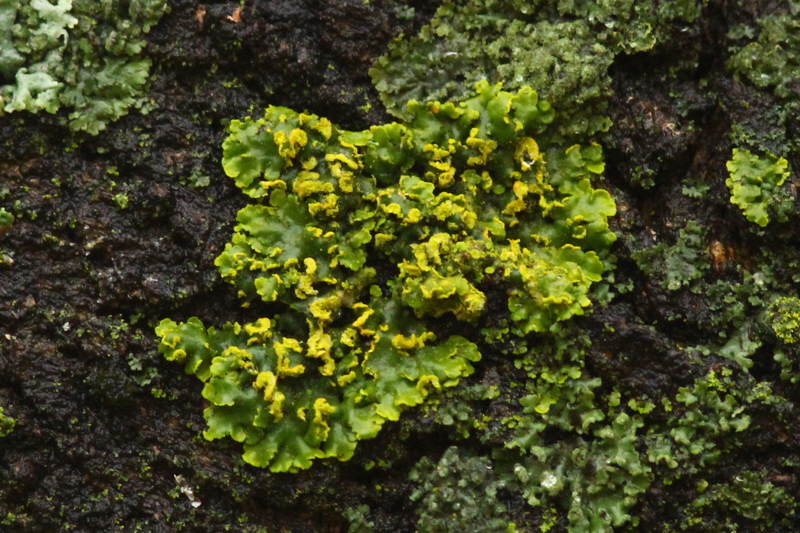 Here’s another photo of one of the plants from earlier in this post. 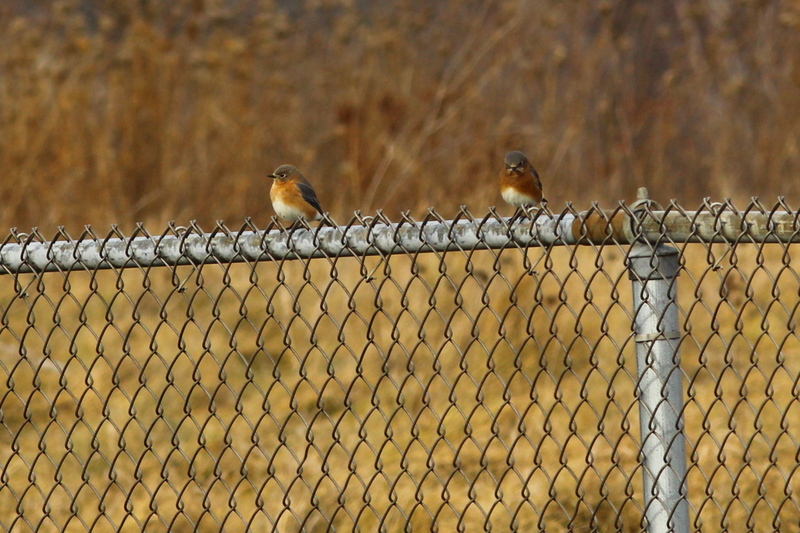 I did find a few other birds, starting with these unhappy bluebirds, and by the way, who ever heard of unhappy bluebirds? Maybe they were unhappy because they knew this was in their future. But, spring will get here eventually. 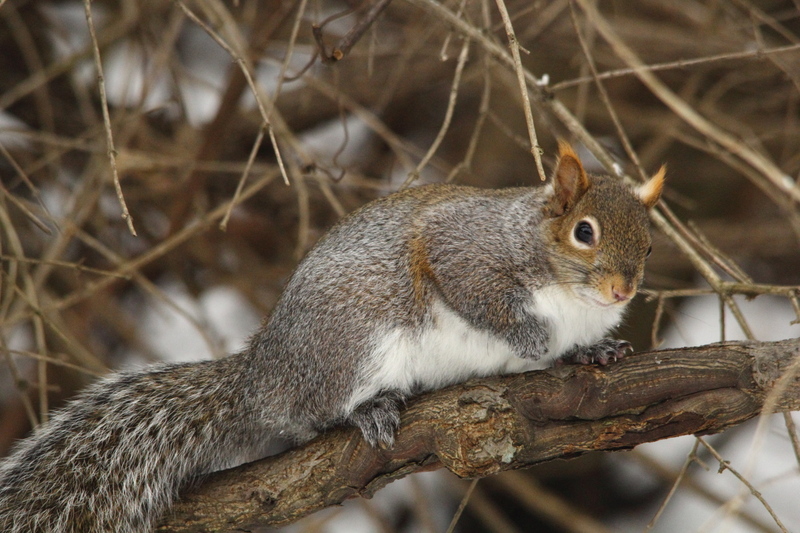 And, spring better get here, or the smug squirrel from an earlier post will have exploded from over eating. I suppose that I should quit whining about the weather here during the winter months, it is what it is, and I’m not able to change it. We did have two sunny days in a row here the last two days, but unfortunately, I had to work, and didn’t have time for a walk. However, with the sun came very cold temperatures, we set record low temperatures the last two days as well. That’s the way it goes here, the only sunny days we get are when the wind is straight out of the north, bringing Arctic air into the state. The forecast is for a warming trend this next weekend, we may make it above freezing for a day or two, that will seem like a heat wave! Don’t get me wrong, I love living in Michigan, at least for nine months of the year, and our winters aren’t as harsh as most of the northern state’s winters are. The Great Lakes, which produce the almost constant cloud cover also moderate out temperatures compared to Wisconsin or Minnesota, as examples. 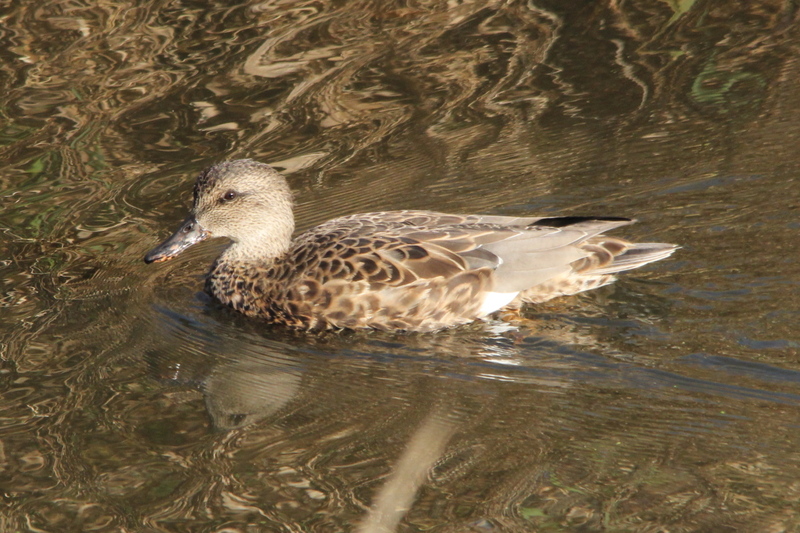 The gadwall is a common and widespread duck of the family Anatidae. 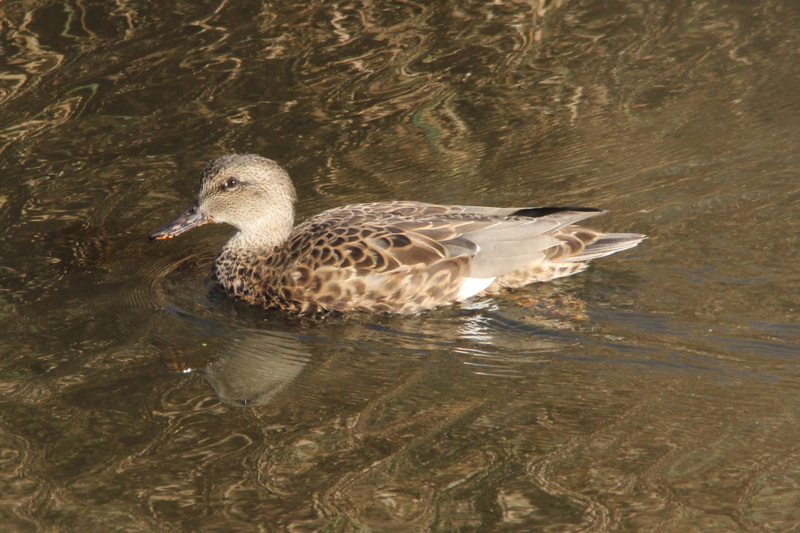 The female is light brown, with plumage much like a female mallard. 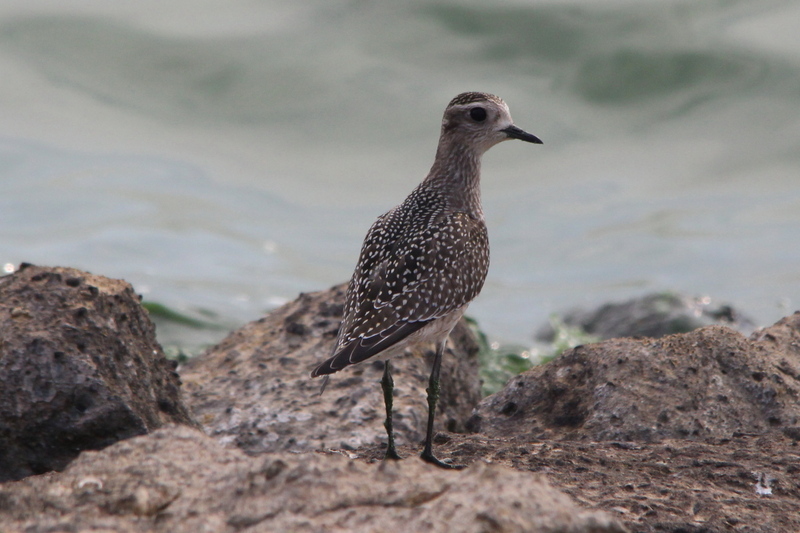 It can be distinguished from that species by the dark orange-edged bill, smaller size, the white speculum, and white belly. 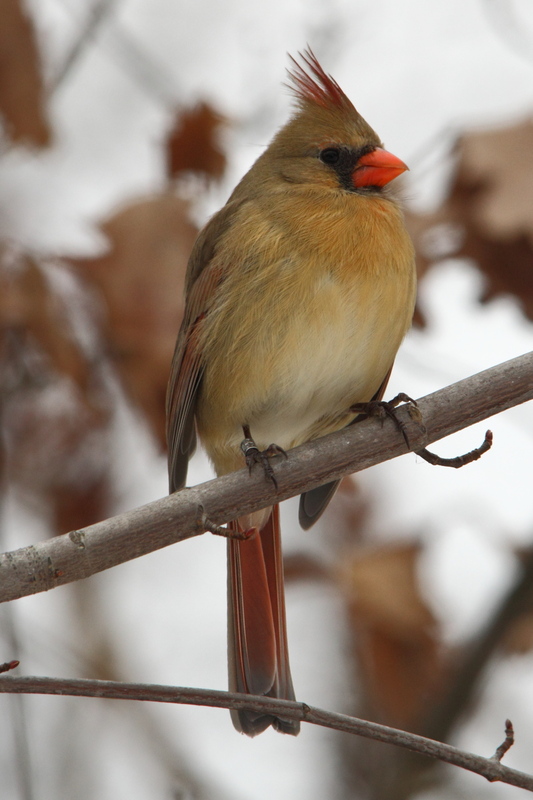 Both sexes go through two molts annually, following a juvenile molt. 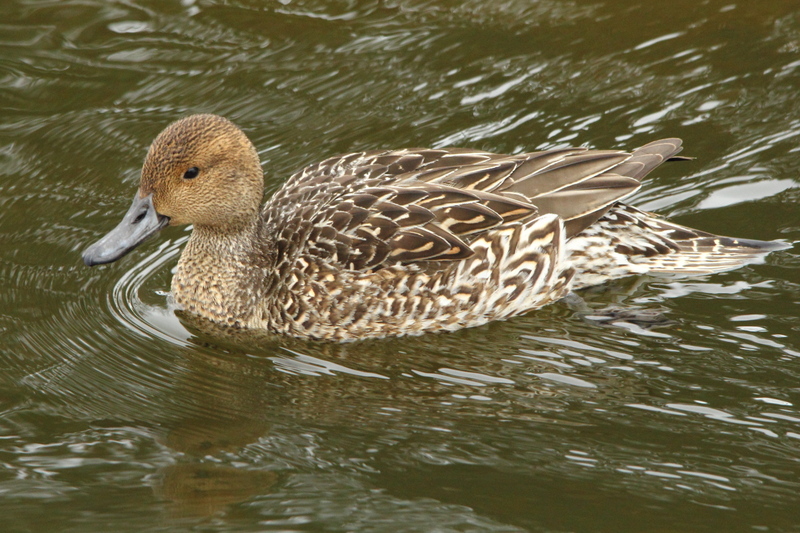 The gadwall is a bird of open wetlands, such as prairie or steppe lakes, wet grassland or marshes with dense fringing vegetation, and usually feeds by dabbling for plant food with head submerged. 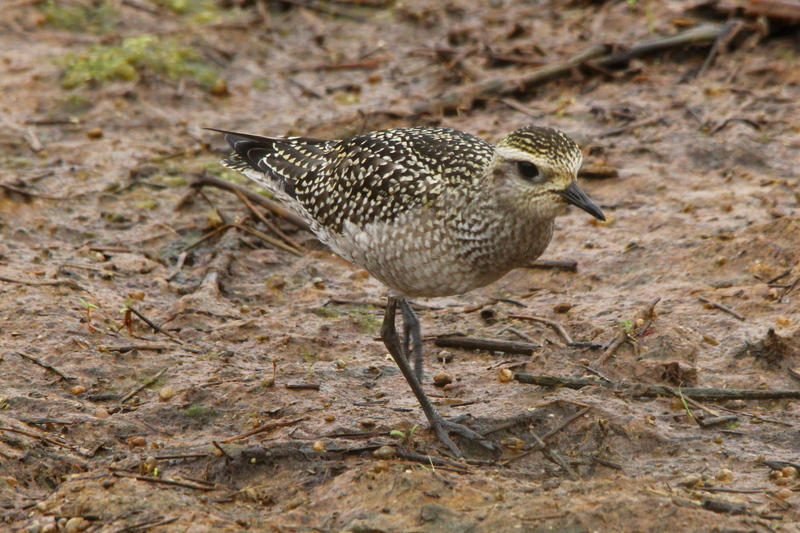 It nests on the ground, often some distance from water. 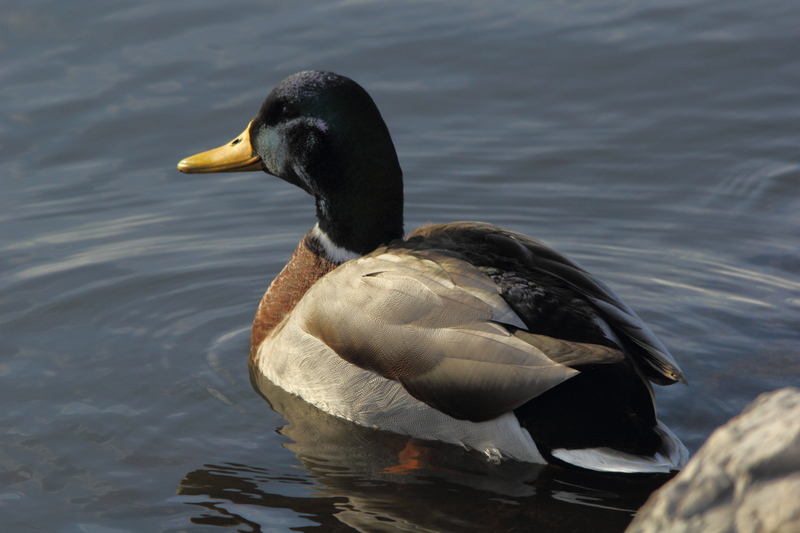 It is not as gregarious as some dabbling ducks outside the breeding season and tends to form only small flocks. 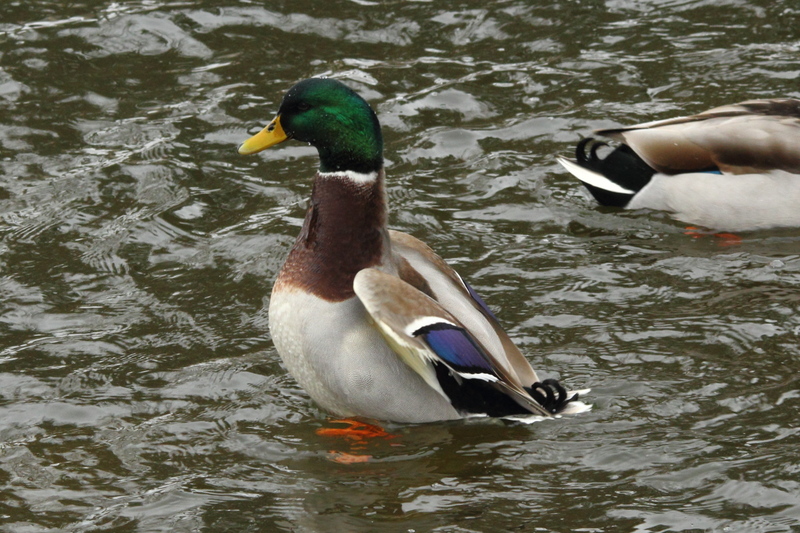 This is a fairly quiet species; the male has a hoarse whistling call, and the female has a Mallard-like quack. 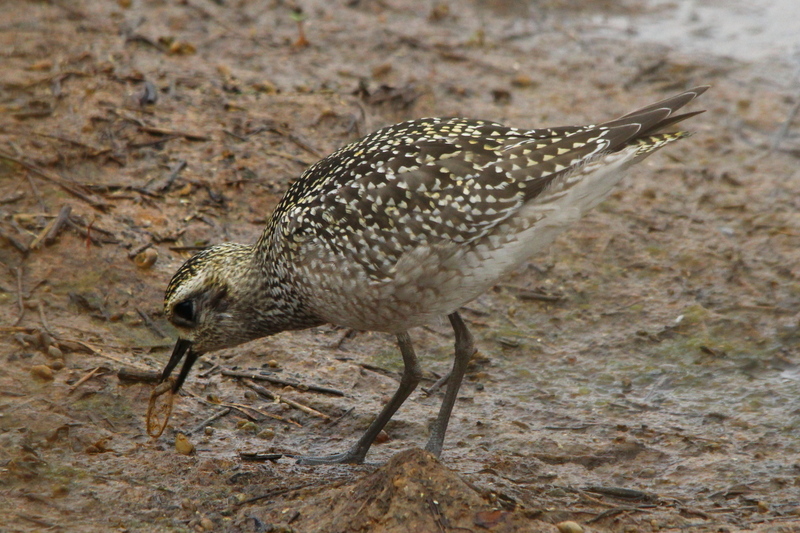 The young birds are fed insects at first, adults also eat some molluscs and insects during the nesting season. This is number 171 in my photo life list, only 179 to go! 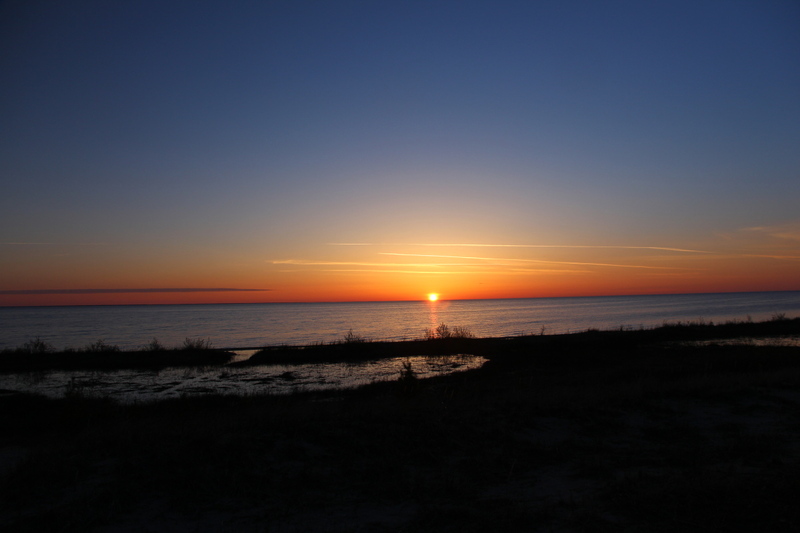 This post will cover photos that I shot on Christmas eve, Christmas Day, and the weekend following, at various locations along the Lake Michigan shoreline. However, before I get to the photos, a few other news items from more recently. I arrived home this morning at 2 AM after having worked 16 hours, fighting non-moving traffic in downtown Chicago during “rush hour” made worse by a severe snowstorm. I walked through the entrance way of the building, and noticed a large puddle of water on the floor, and thought that it had been made by snow melting since the door to the building doesn’t always latch properly when the winds are strong, and the snow builds up under the door. But, when I opened the door to my apartment, I heard water running in my dining room, not good. 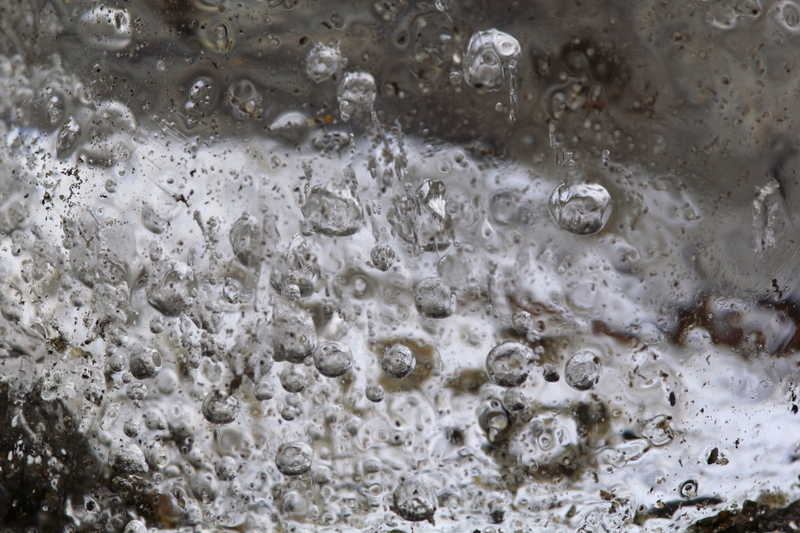 The dining room is where I store my camera gear, and the floor had an even larger pool of water than the hallway had. Water was running down through the light fixture in the ceiling, as well as down the wall. I lucked out though, none of my camera gear was wet, other than the holster bag that I had on the floor was slightly damp where it touched the carpet. I grabbed all my stuff and moved it to a safe location, then called maintenance. The maintenance/security guard arrived in a matter of a few minutes, looked the situation over, then called the more skilled person on call. That person arrived in less than ten minutes, checked the apartment upstairs to see if the leak was coming from there, then deduced the water was from the hot water heating system we have. He shut down the boiler, then called the service company that handles the service on the heating system, as well as an emergency clean-up contractor. To make a long story short, they had the leak repaired and the majority of the water removed by 5 AM and I was able to go to bed! I was impressed then, it strikes me as even more impressive after I got up later today, less than three hours to fix the leak and clean up the majority of the mess that had been made! I have a fan left by the clean-up contractor running in the dining room to help dry out the carpeting, and a hole in the ceiling drywall that they had to cut open to access the burst pipe, but other than that, you’d hardly be able to tell that the dining room and kitchen had been flooded last night. They’ll have to come in and clean the carpet as well as tack it back down next week, and also repair the drywall once it has thoroughly dried. I thought that I had been hit by another major disaster when I saw what was going on last night, but it has turned out to be just a minor inconvenience. In a way, I lucked out, for I had been scheduled for another mid-day run to Chicago for work, but when I saw the mess when I opened the door, I called dispatch and told them I wouldn’t be able to make it in on the scheduled time. I got my schedule changed to do a better run on Saturday, when the weather should be better. I’m loving my new employer, one that works with the employees rather than trying to shaft them all the time. On a related note, you may read in the news of a huge pile-up of cars on I-94 in Michigan due to the snowstorm that hit us yesterday and today. One person dead, a truck carrying fireworks on fire, over 100 vehicles involved in the crashes at last count, and people being evacuated within a five-mile radius in case the truck on fire explodes. I should have gone for a walk today, since I have the day off, but I only slept a few hours due to my schedule being so mixed up, and I don’t feel like going out and battling what amounts to a blizzard. Besides, I had another reason to stay in, I had a package delivered with some goodies inside on Wednesday. You know that my plan is to buy a new iMac when I saved up enough money to do so. That plan includes using Adobe Lightroom to manage and organize my photos on the iMac, as well as to edit my images when it is called for. So, since I needed Lightroom, and an external hard drive to store photos on seemed appropriate, I went ahead and ordered both Lightroom and a 4 TB external drive to connect to my new iMac when I get it. It may seem silly to have purchased those items before the computer, but I know me, and if I had the computer first, I’d start using it before I had everything that I needed to be set-up properly, then have to re-do everything later. This way, when I do get the computer, I’ll be able to plug the hard drive in right away, and get Lightroom set-up to store all my images on it right from the get go. 4 Tb sounds like a huge amount of storage space, but I’ve nearly filled a 1 Tb drive with my images shot in jpeg, and images shot in RAW are 3 or 4 times the size of jpegs, so I don’t think that a 4 TB drive is overkill at all. One other item that I purchased was a small, light-weight ball head to fit either my tripod leg set-up, or the monopod that I have. In a previous post, I went on at length about the fact that I should carry and use my tripod more often. I also related that the 3 way head that I use on the tripod is almost as heavy as the tripod legs alone. The 3 way head will hold either of my long lenses with no problem, but I seldom use either of those lenses mounted on the tripod. So, I’ve been looking for a way to cut down on the weight of the gear that I carry each day, and/or a light weight solution to how I carry the tripod. I can’t believe that no one makes a light weight carrying bag to hold a tripod set-up, either that, or I haven’t been able to find one yet. I wish that I knew some one who knew how to sew, I’d have one made for myself. Anyway, as I was looking at a lighter alternative to the 3 way head that I have now, an idea struck me, try one of the ball heads on my monopod. I’ve had the monopod for years, but seldom used it, even though it doubles as a walking stick. The biggest drawback to me was that when I attempted to use it for macro photos, I’d end up holding the monopod at weird angles, and have to put more effort into holding the monopod steady than I would have to when using the camera by itself. I’m hoping that I’ll be able to shoot macros with the monopod nearly vertical, making it much better to use, and use the ball head to get the weird angles required at times. We’ll see, even if the ball head doesn’t work out well on the monopod, I can still use it on the tripod legs, and reduce the weight of the head by 2/3. I know one thing, I do have to carry something that will let me get the macro shots that I want, when I want. 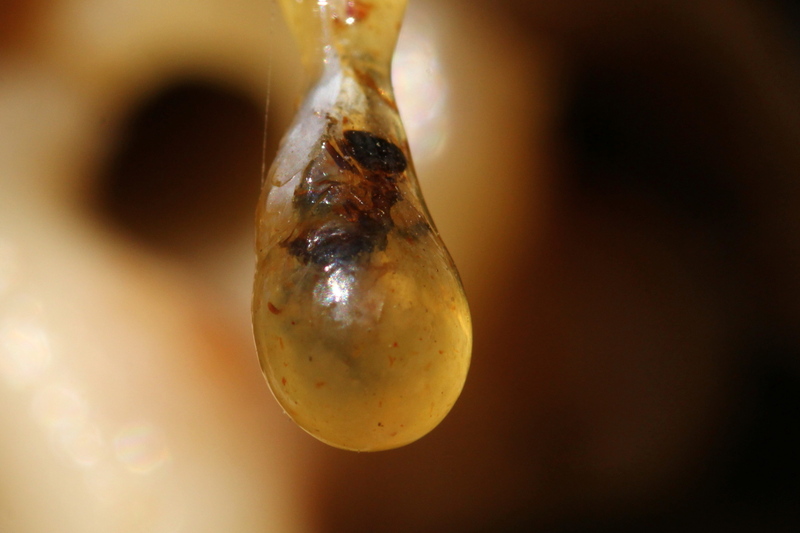 You may remember that a while back I posted a photo of an ant trapped in pine resin. I’ve been planning on going back and trying for a better photo than the one that one. Well, one sunny day a few weeks ago, I looked at where the ant had been, and the pine resin the ant was trapped in was gone. 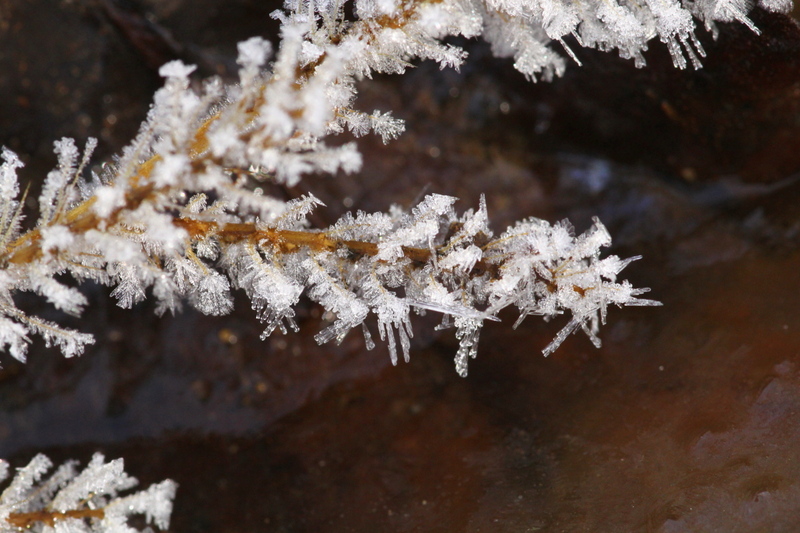 That goes along with having tried to get very good close-ups of the ice crystals in a recent post, without something to steady the camera, I couldn’t get the images that I wanted. If I don’t get it right the first time, there may not be a second chance! I’ve already tested the ball head on the monopod here at home, and I think that it will make a fine set-up while hiking. I haven’t installed it on the tripod yet, maybe that will never happen, but it should work out fine that way as well. 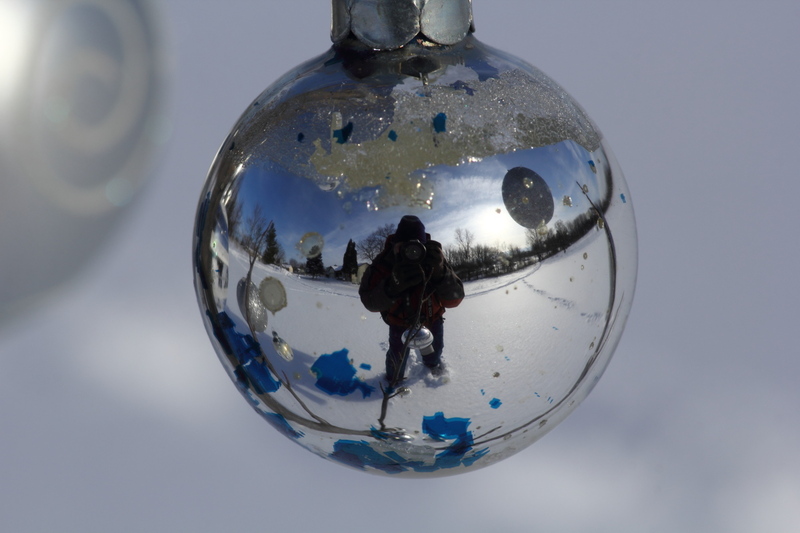 Now then, I’m finally going to get around to the Christmas weekend and a few newer photos. With four days of play time, I made the most of it, visiting several places along the lake, looking for birds and some good light for a change. 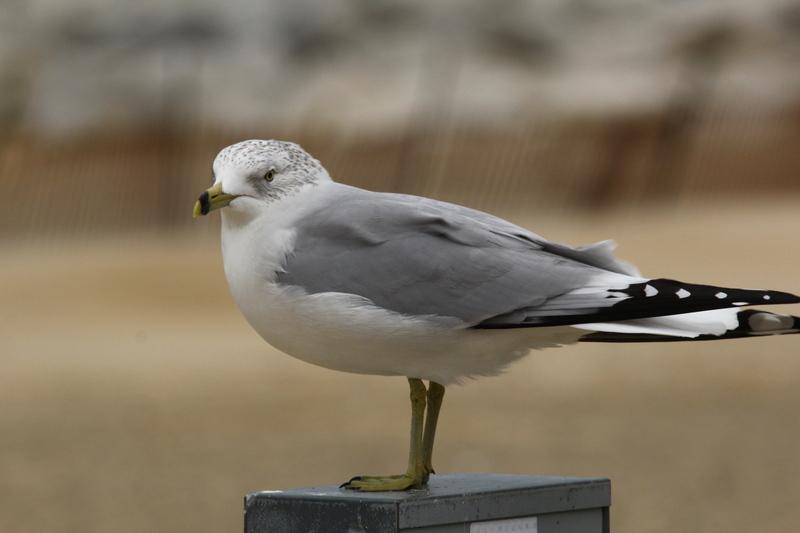 One of the places that I went was the Grand Haven break water, looking for both a common eider and a great black-backed gull, both of which had been reported there through eBirds. 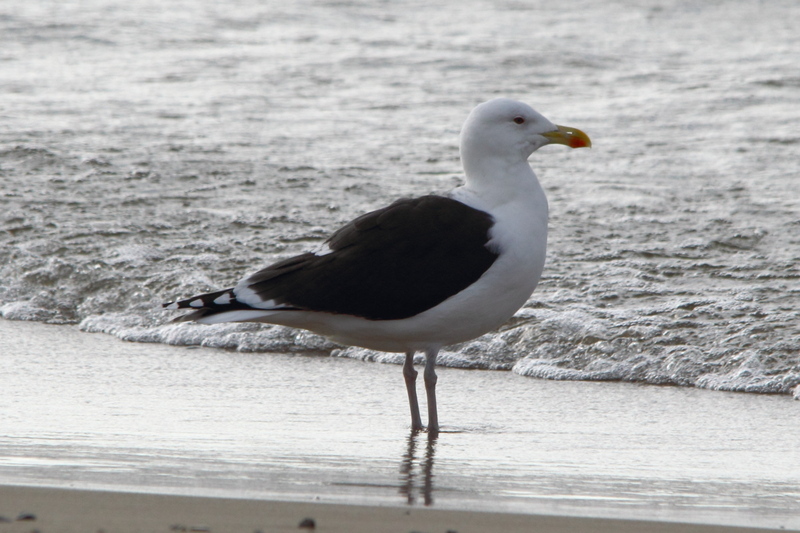 I found the great black-backed gull for the first time on a dark and stormy morning, and managed a few photos of it, however, on a return trip, I was able to do better. 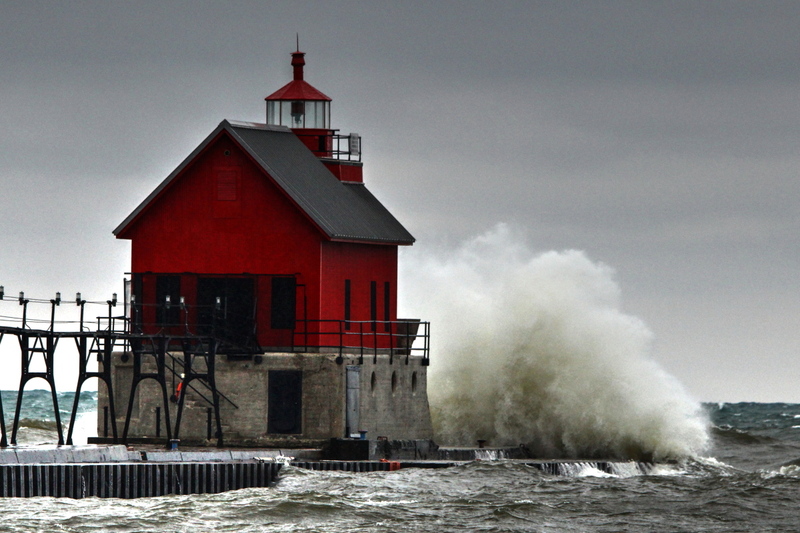 Before I get to the gull though, I’m going to start with a HDR image of the lighthouse at Grand Haven. The reason that I tried going with a HDR image was that I was trying to increase the contrast between the waves breaking against the lighthouse and the sky in the background. I shot close to 100 photos of the waves, and most looked like this if they weren’t edited. If I got any contrast between the water and the sky, then the lighthouse was underexposed. 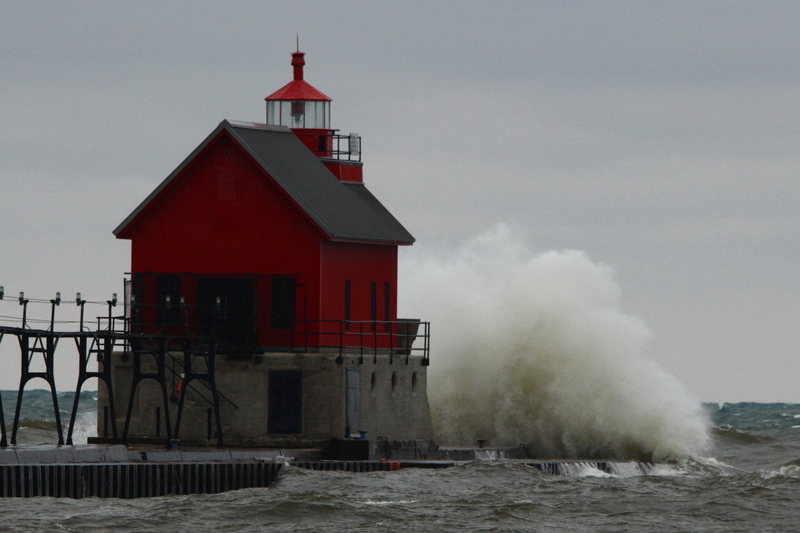 If I exposed the lighthouse correctly, then the waves disappeared into the background. I’m not entirely happy with the HDR image here, but I’m still learning how to manipulate images in Photomatix. 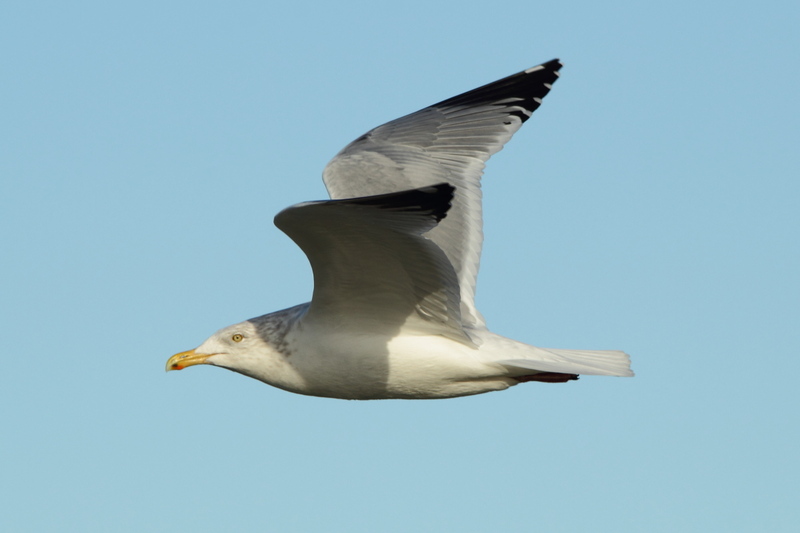 Okay then, here’s the great black-backed gull. 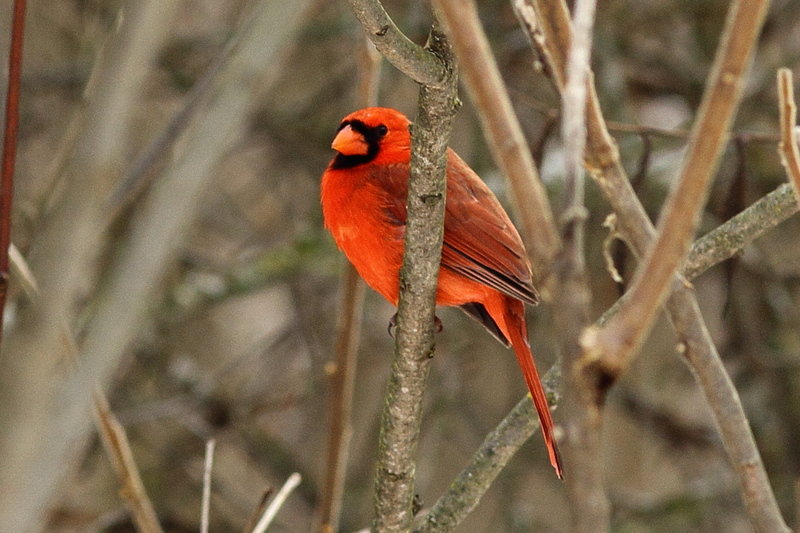 That’s a species of bird that I needed as I continue trying to photograph every species of bird regularly seen in Michigan for the My Photo Life List project that I began two years ago. I’m now well over 200 species, but they keep getting tougher all the time. 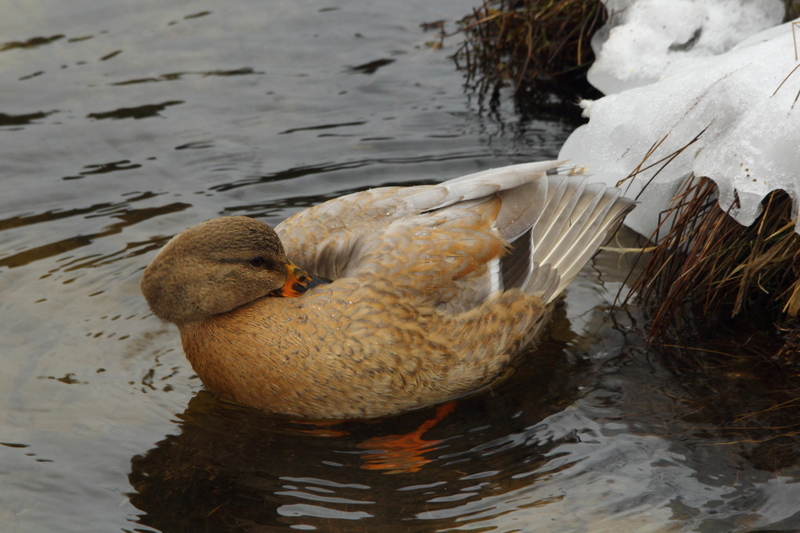 I never did see the eider, although I stopped at the Grand Haven breakwater three times in four days. For the shot of the gull above, I was north of it, meaning I was shooting toward the sun, so the photo isn’t the greatest. 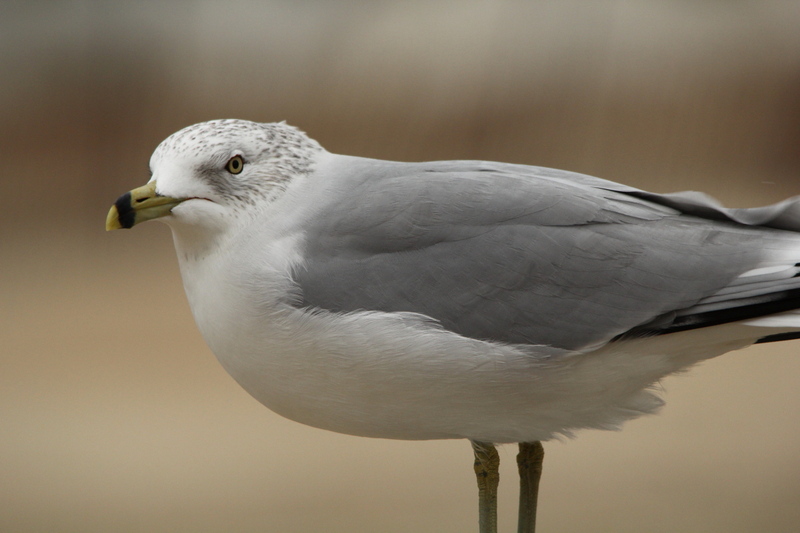 A jogger ran between the gull and myself, spooking the gull away. 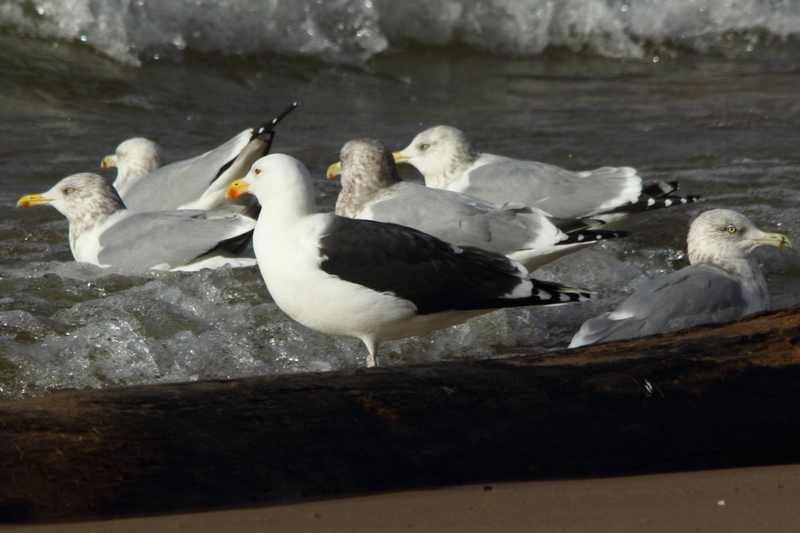 I walked a short distance away, and waited, the gull returned, and I was able to shoot better photos, although the black-backed gull had joined a flock of herring gulls. I prefer to get just the one species in the frame for the images I use when I post a specific species, but these will work. 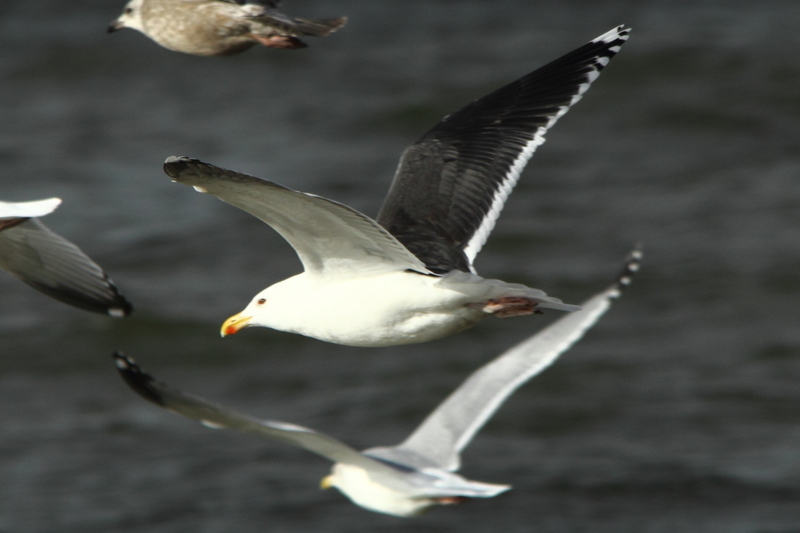 They show the differences in size and coloration between the black-backed and herring gulls. I was hoping that I could get just the black-backed gull in the frame, but about then, a person walking their dog walked between myself and the gull, spooking the gulls once more. It was hard to pick out just the one gull in the flock, but I did mange to zero in on the black-backed gull for this one. 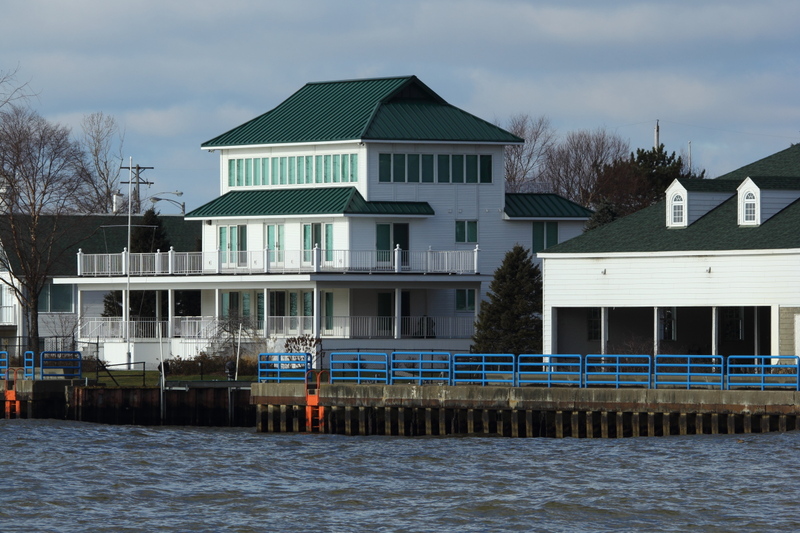 Since these were shot at Grand Haven on the sunny day that I was there, I’m going to throw in this photo, even though it has nothing to do with nature, I just love this house. 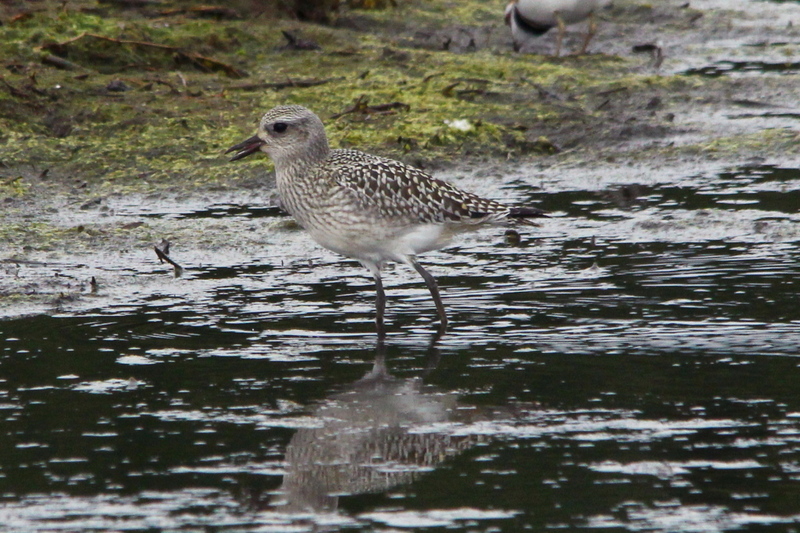 I changed the subject from gulls, but I’m going back to them, even though these photos are nothing special. 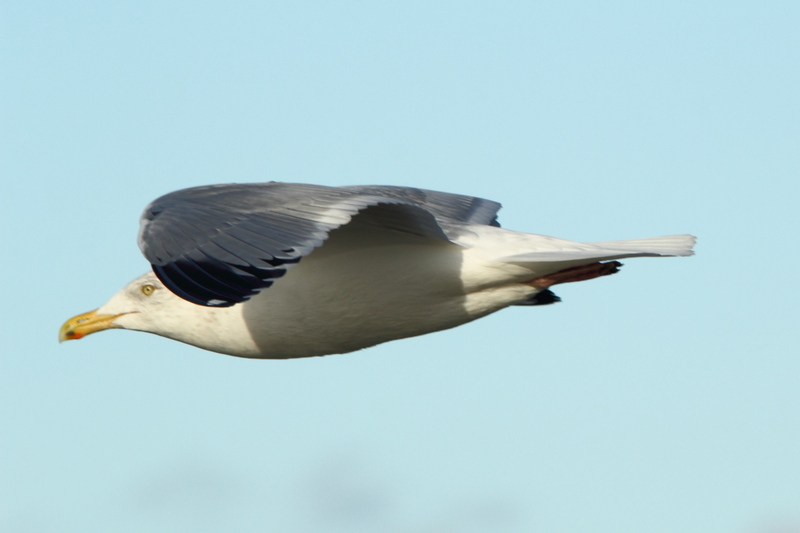 With lots of common herring and ring-billed gulls around, I practiced my bird in flight techniques for a while. 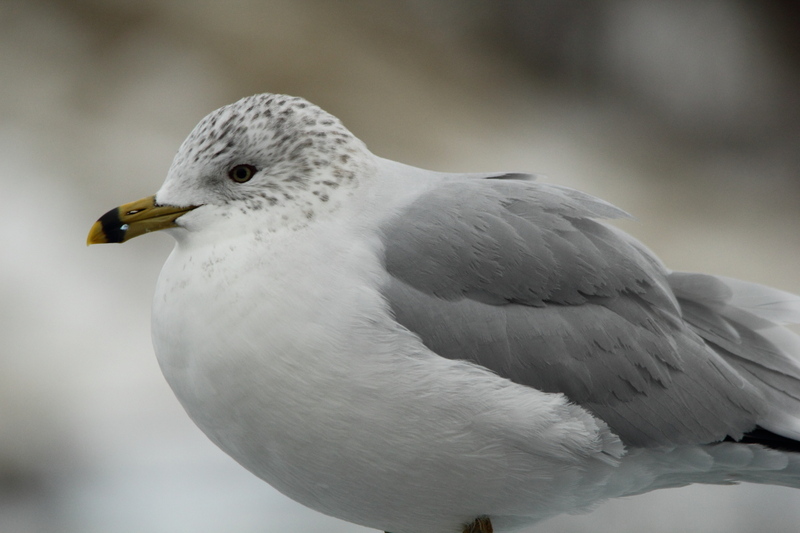 It was a rather cold day, so I returned to my Subaru to warm up for a while as I waited in hopes that the Black-backed gull would return, but it stayed out of camera range for the rest of the time I was there. 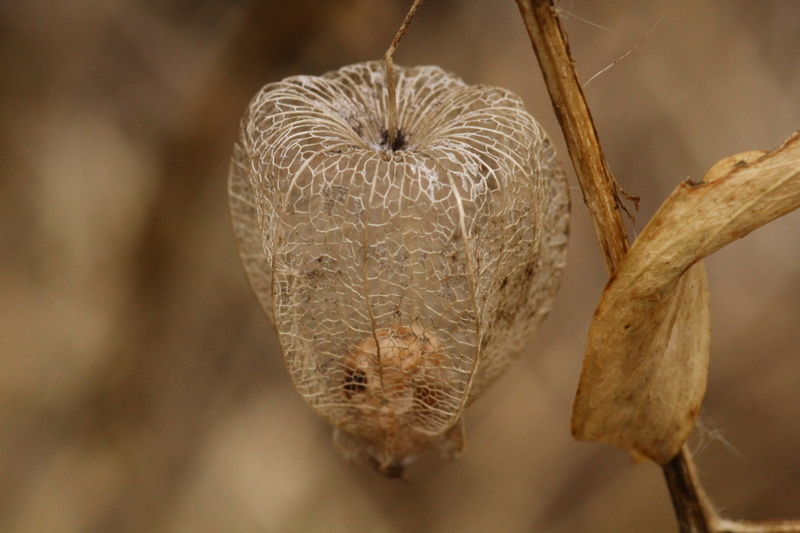 I did however, shoot these next two photos, neither of which have been cropped at all, while waiting. 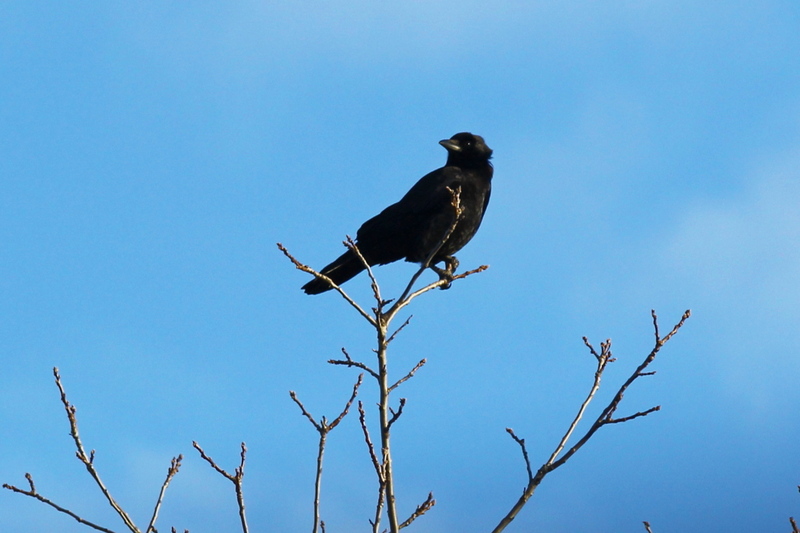 The first was shot with the Canon 300 mm prime lens with the 1.4 X tele-converter behind it. This one was shot with the Beast (Sigma 150-500 mm lens) to show how much difference 80 mm makes as far as getting closer to a subject. Quite honestly, even though I’ve done this before, I was surprised how much of a difference that extra 80 mm made. 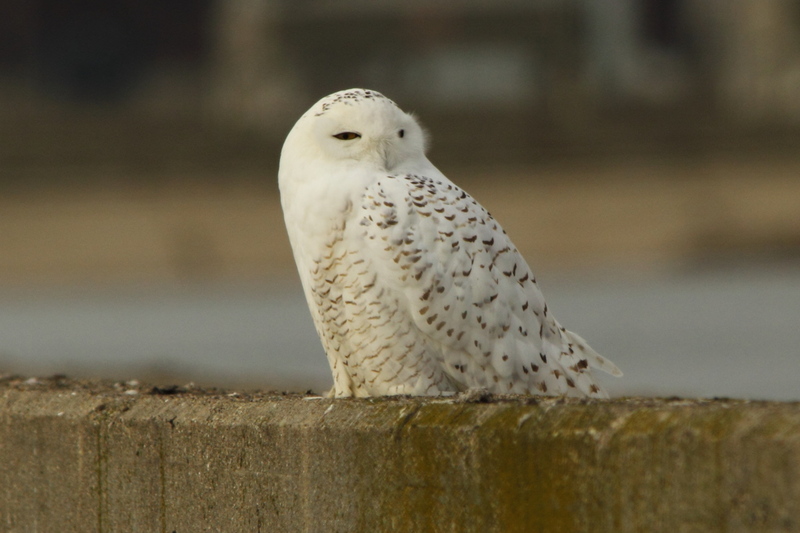 For the snowy owl fans, I did go to Muskegon over the Christmas weekend also, and did see a few of the owls, here’s one. 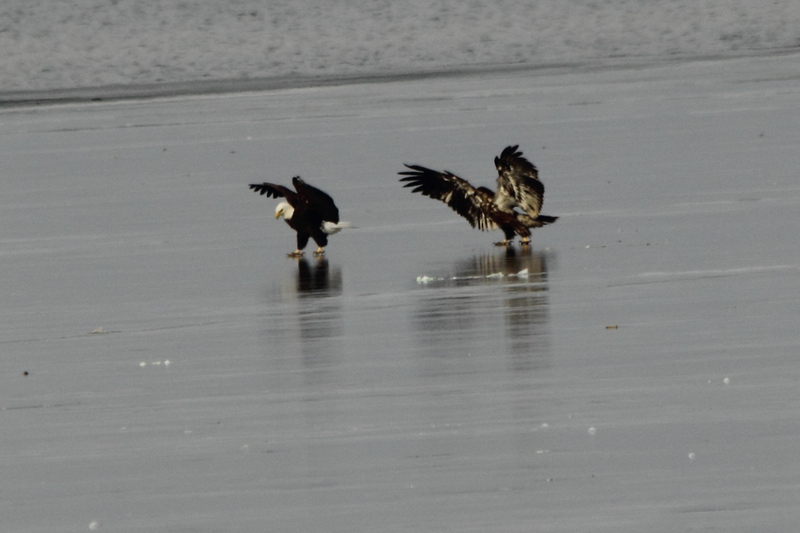 Several posts ago, I had many photos of a flock of eagles fooling around relatively close to me, but in horrible light. 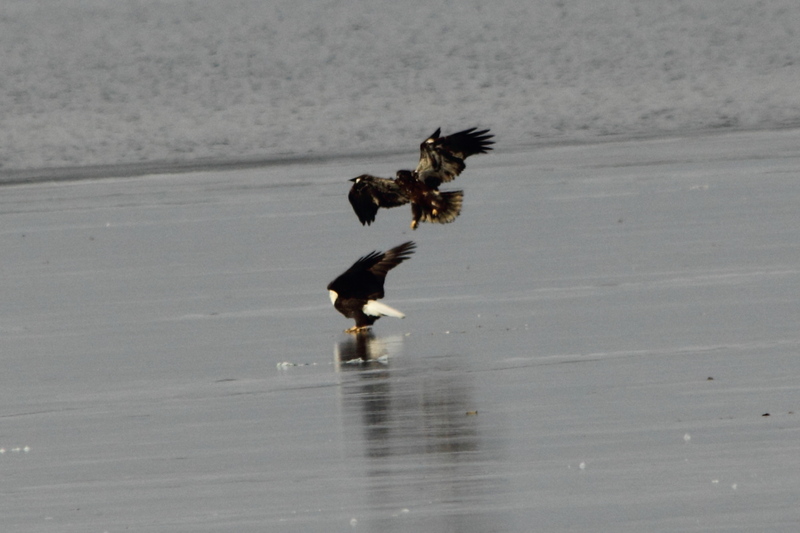 On one day that I went to Muskegon when there was good light, there were a few eagles, but they stayed out of range of the camera for the most part. 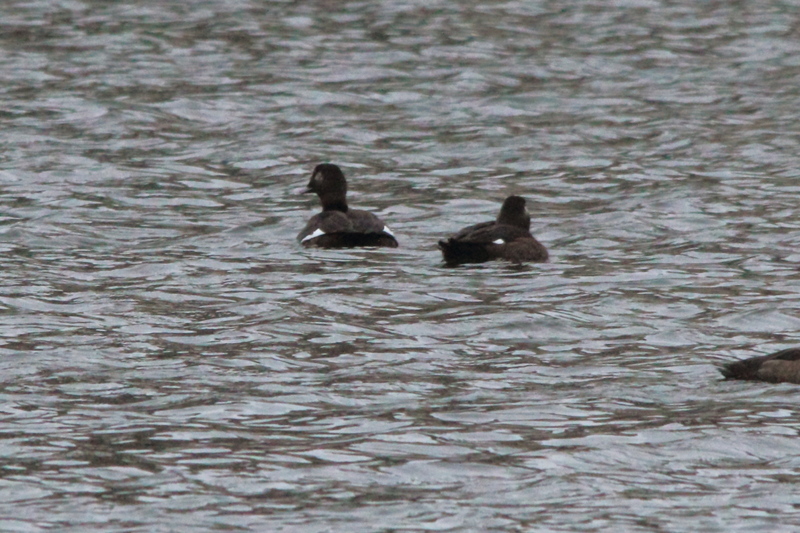 Here’s two that were close enough for me to even try for photos. Those aren’t very good, and here’s why. 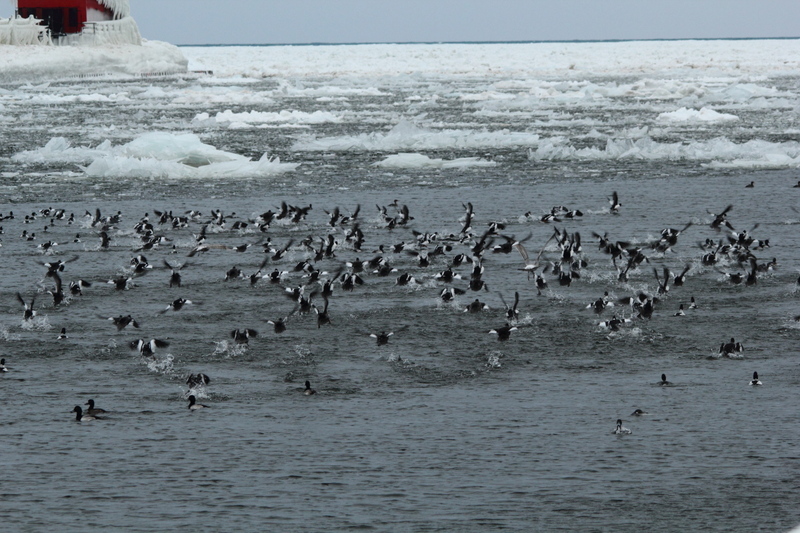 There’s a flock of gulls in the foreground, behind the gulls, the two large dark objects are the eagles, with several crows nearby. 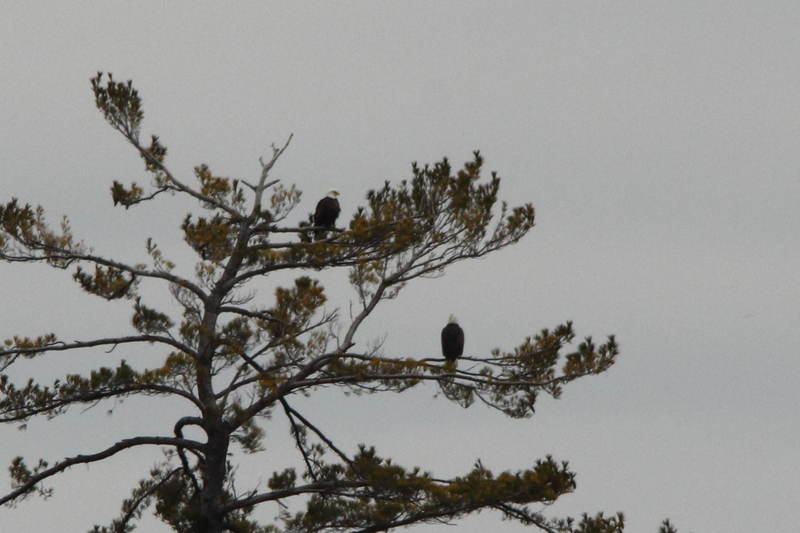 That gives you some idea how far the eagles were from me. 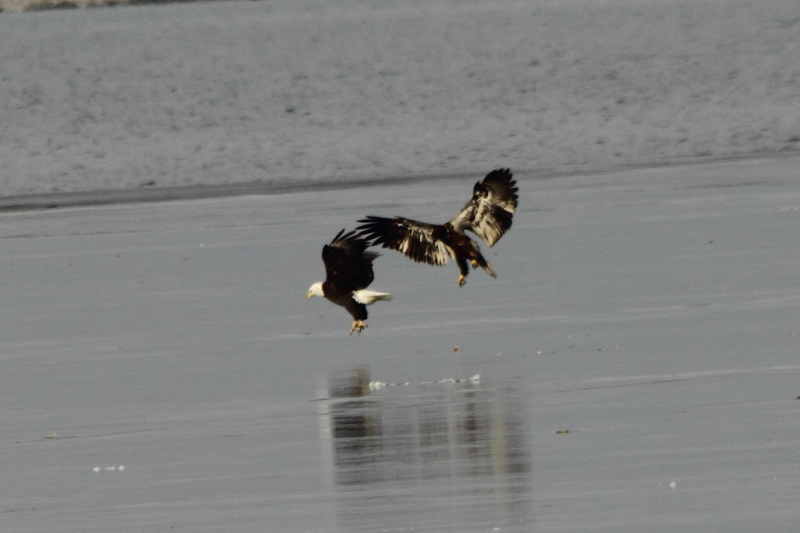 One of my stops over the weekend was Lake Harbor Park and there were a few eagles there as well, but once again, they stayed well out of camera range for a good photo. 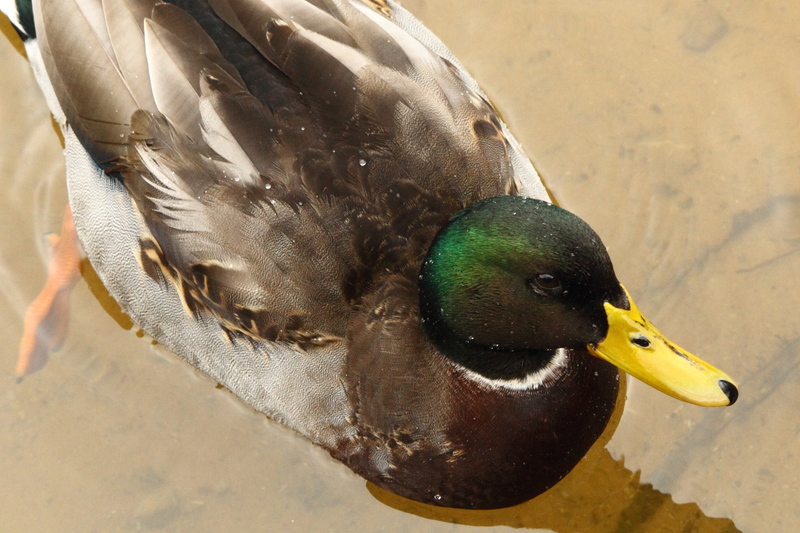 While I was there, I also shot a few photos of hybrid mallards, I’ll start with one that has a black head. Here’s another male of mixed heritage. Maybe it got too close to me, I zoomed out for these next two. 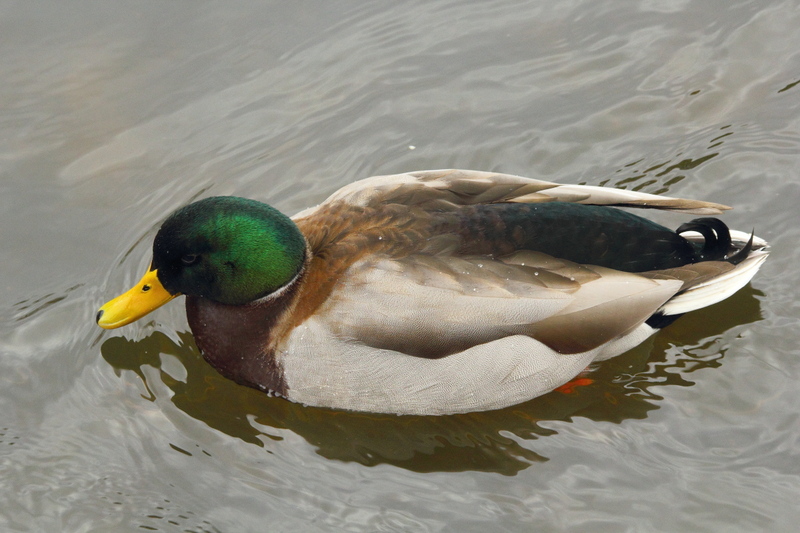 By the way, those last two aren’t the same duck, it seems most of the mallards there at Lake Harbor Park were hybrids, as few of them were colored like a true mallard. 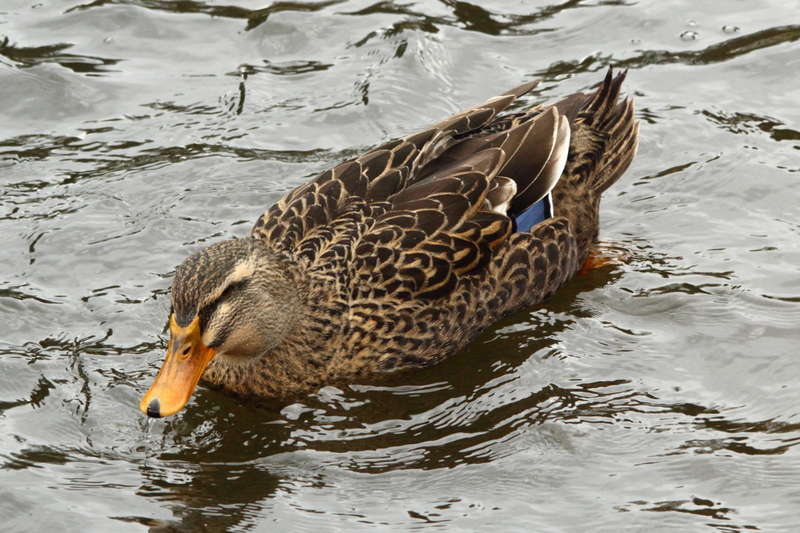 I suppose it goes right along with this duck, a black duck/mallard hybrid. 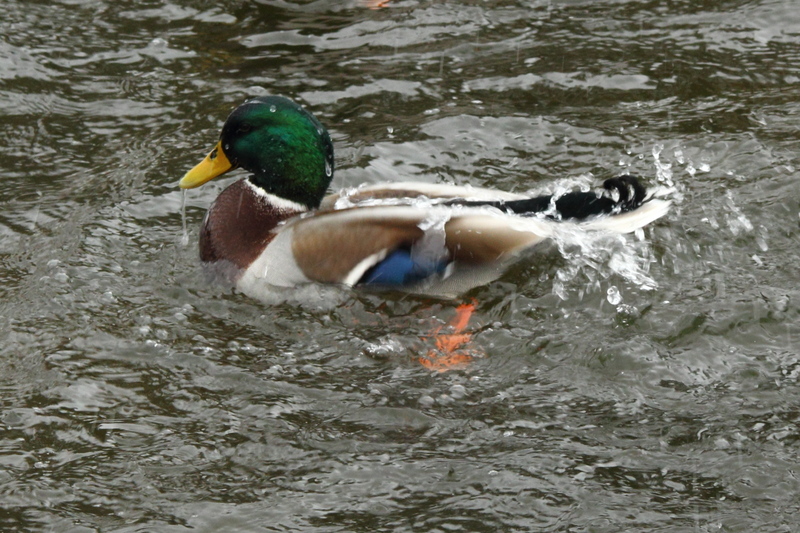 Here’s a male mallard (I think) from Grand Haven. 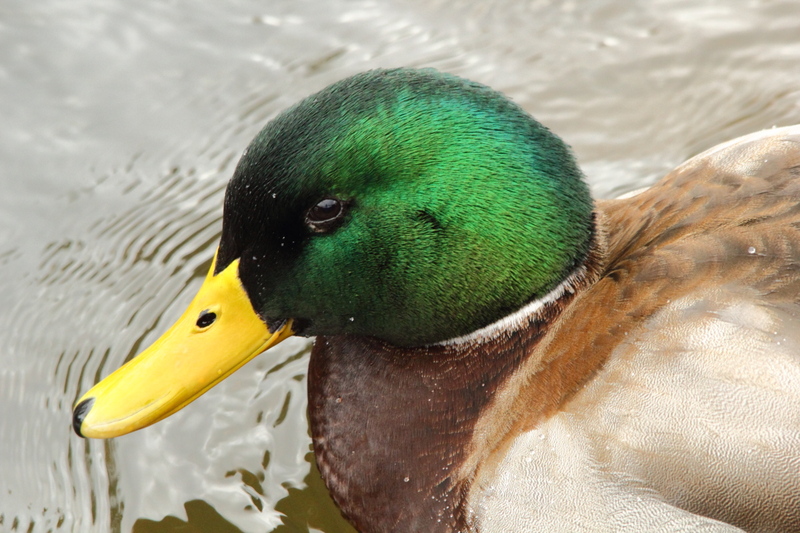 It’s getting so that it’s hard to tell if a duck is really the species that you think it is around here, the mallards are mating with several different other species, and you can’t be sure of what species they are. 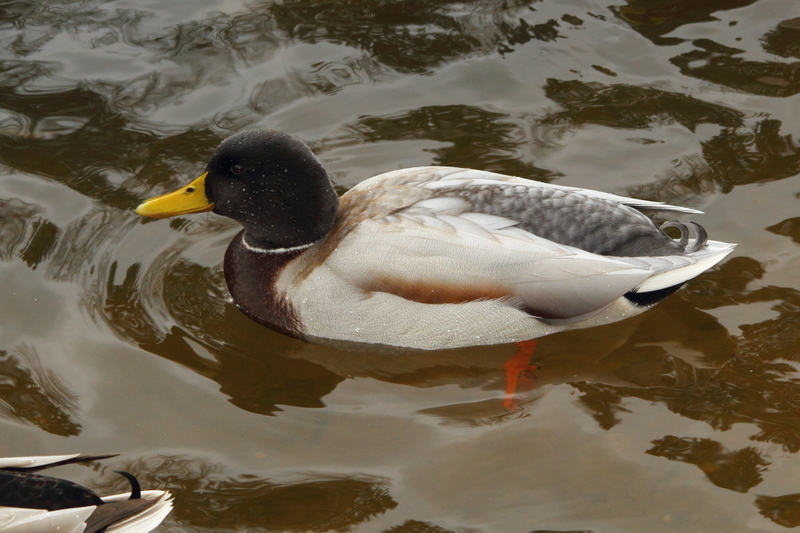 Here’s yet another mallard with slightly different coloration, also from Grand Haven. 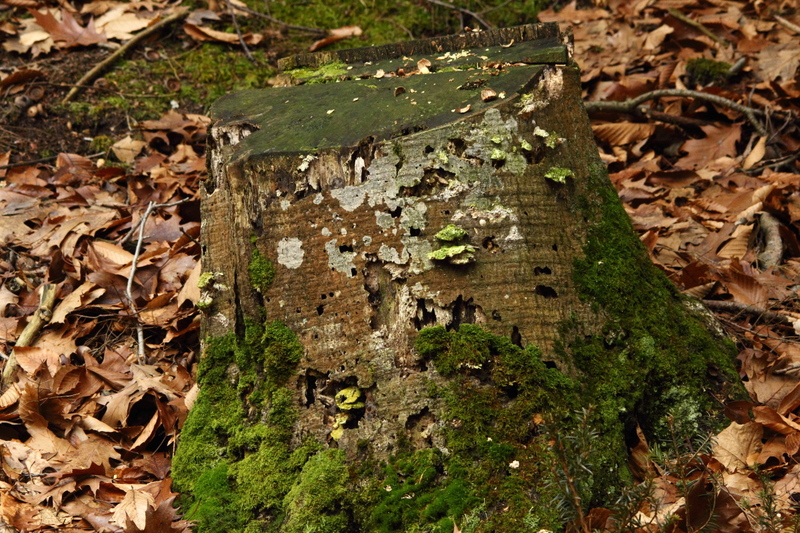 The only other photo that I shot at Lake Harbor Park was of this stump, just because I liked the colors. 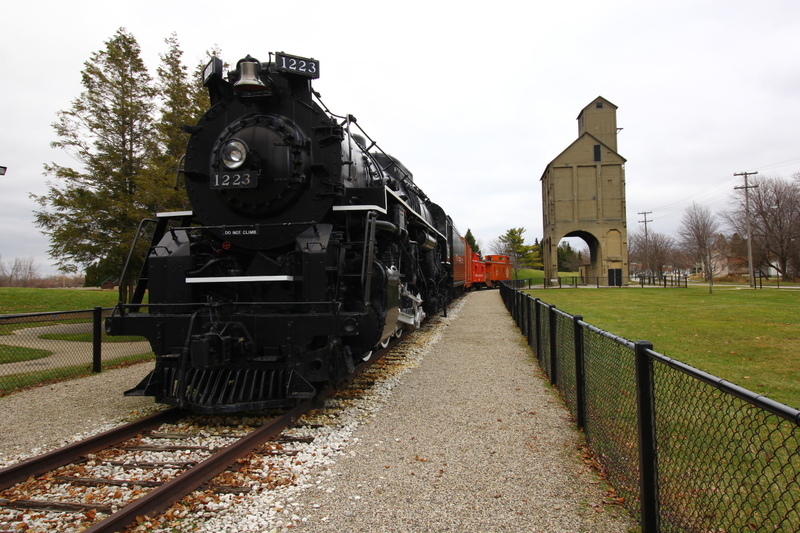 On one of the days in Grand Haven, I shot photos of the steam locomotive on display in a city park, trying out the 10-18 mm lens. 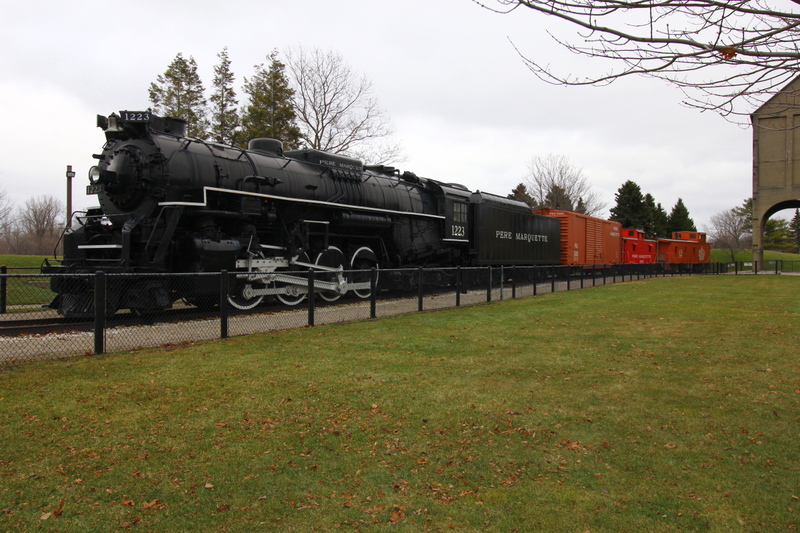 I posted images of this before, but they were shot with the 15-85 mm lens, I was trying to do better, but the fence there made it difficult to show the locomotive without the fence blocking it out. 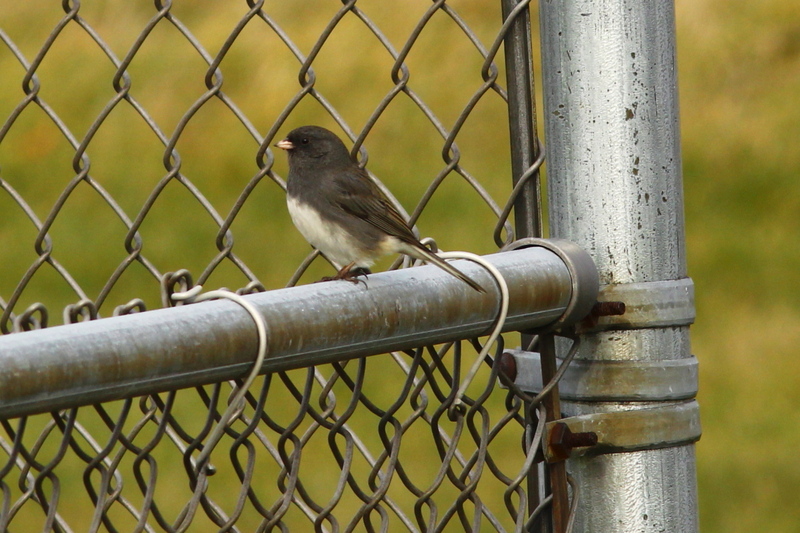 That was the best that I could do without the fence getting in the way. 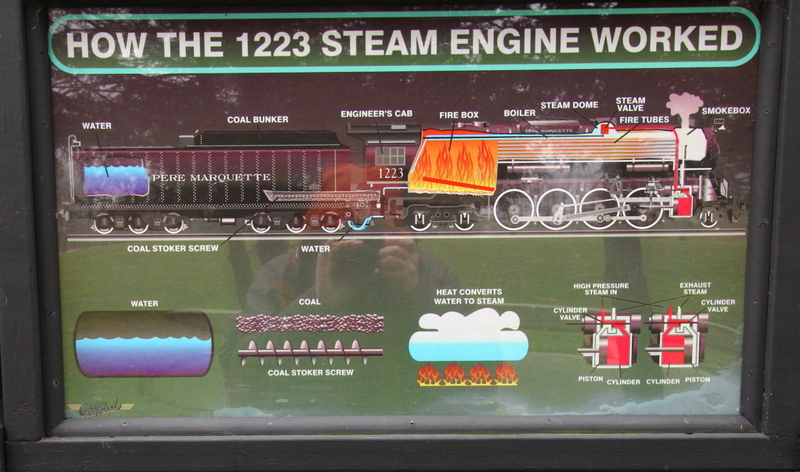 Here’s two photos about the locomotive. 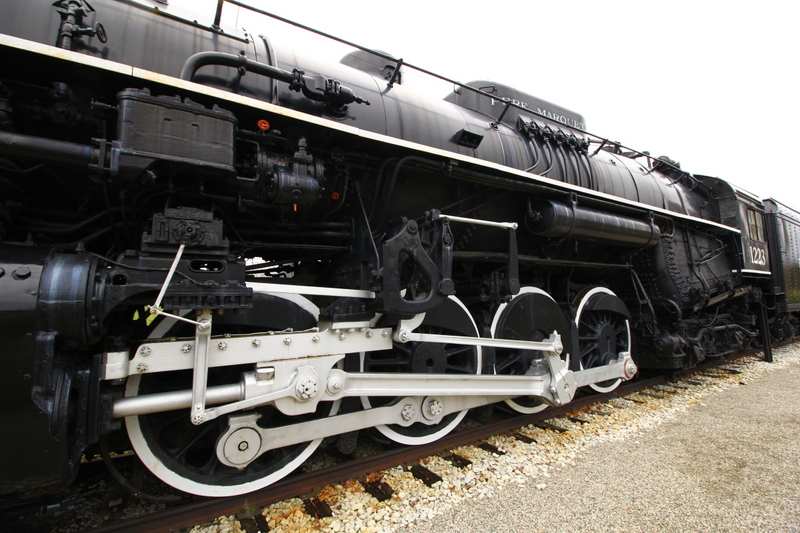 And, here’s the entire train from a different angle. 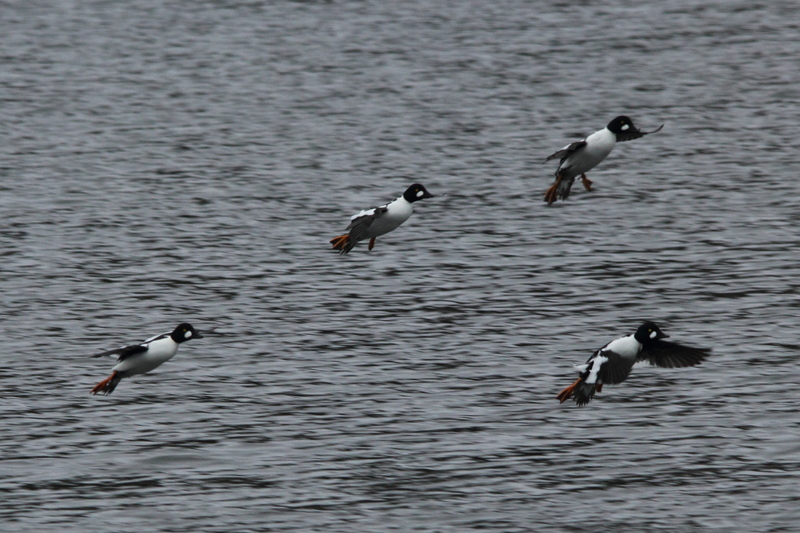 Also at Grand Haven, I shot this flock of common goldeneye ducks as they flew past. 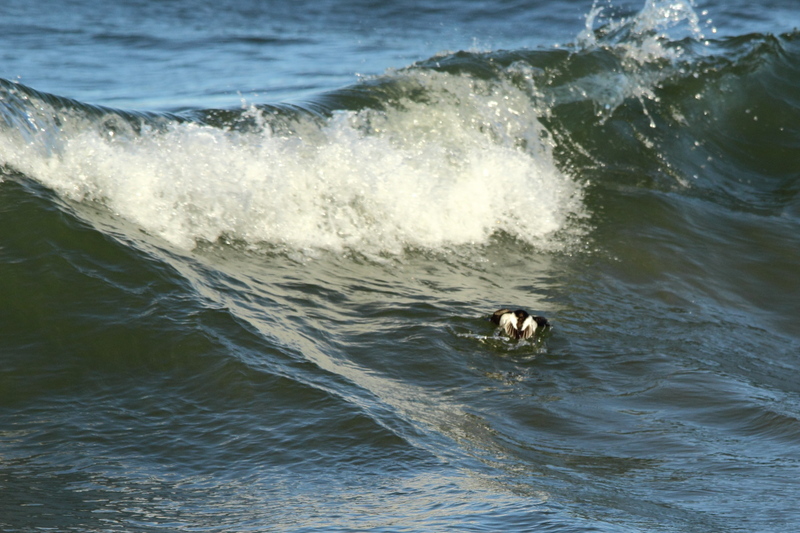 Here’s a juvenile long-tailed duck that was playing in the surf. 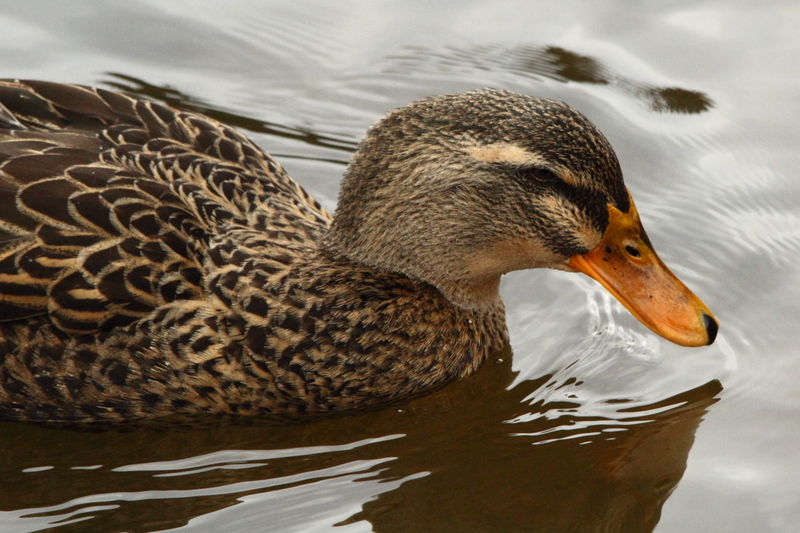 …and I never knew where the duck would pop up next. 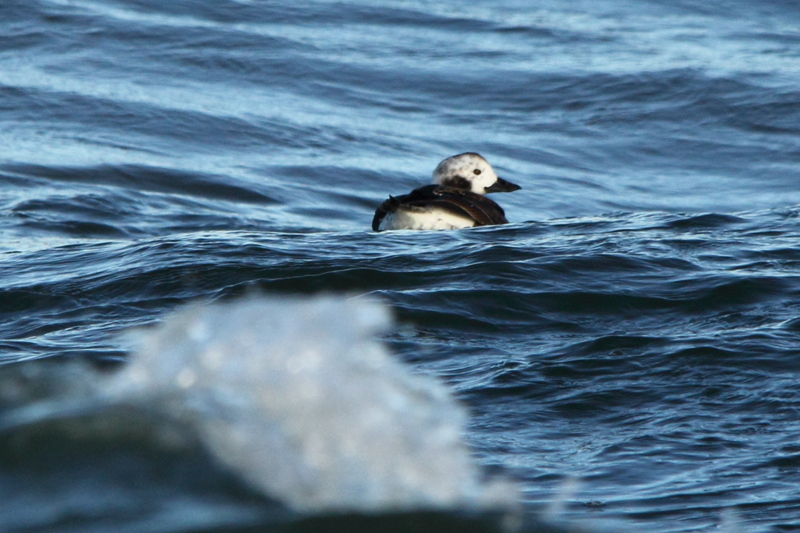 Oh well, I have posted much better shots of long-tailed ducks before, and I’m sure that I’ll get more later this winter when the larger flocks arrive. 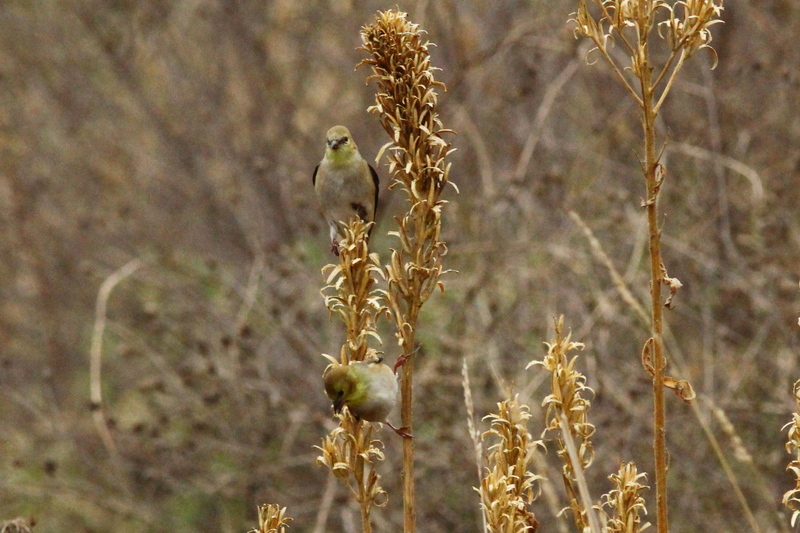 Another stop that I made was at the Muskegon Lake Nature Preserve, where I found these birds. Not a great haul, but not too bad either. 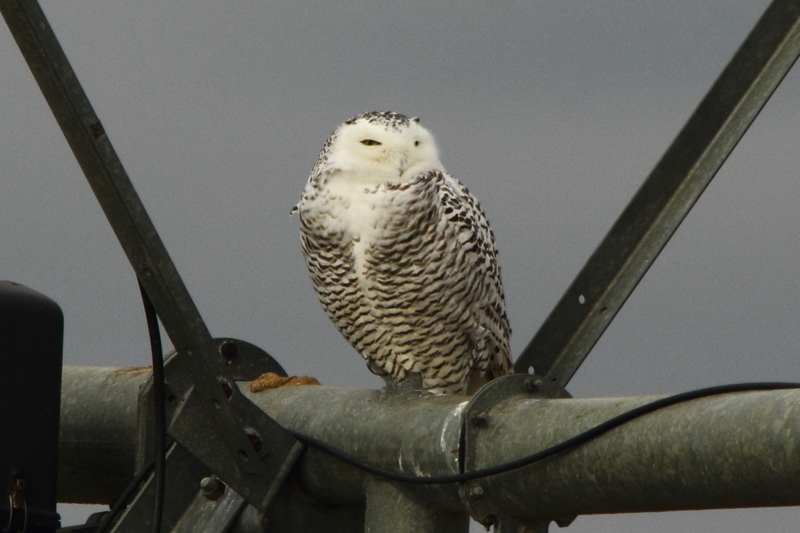 I’ll finish this post with two more images of a snowy owl, this one had darker plumage than the others that I saw. So, that wraps up another one. If I left any spelling mistakes, I’m sorry, I’m rushing this one to finish before I leave for work. 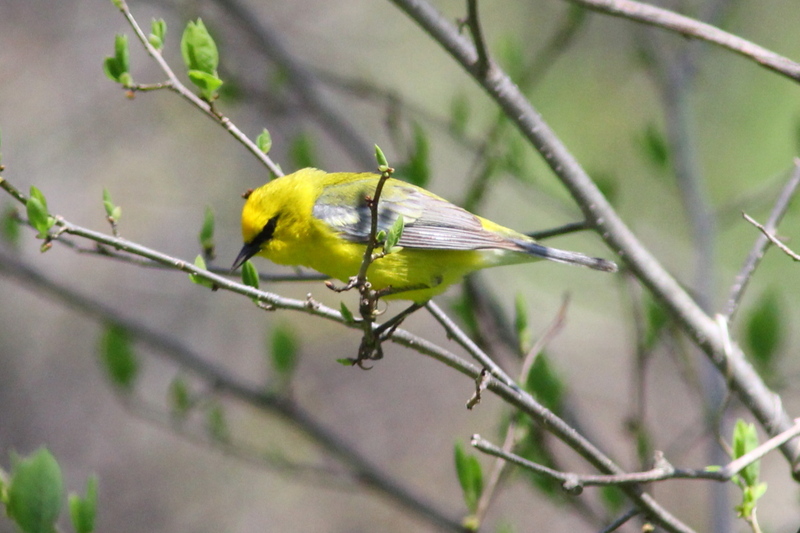 The blue-winged warbler is a fairly common New World warbler, 11.5 cm (4.5 in) long and weighing 8.5 g (0.30 oz). 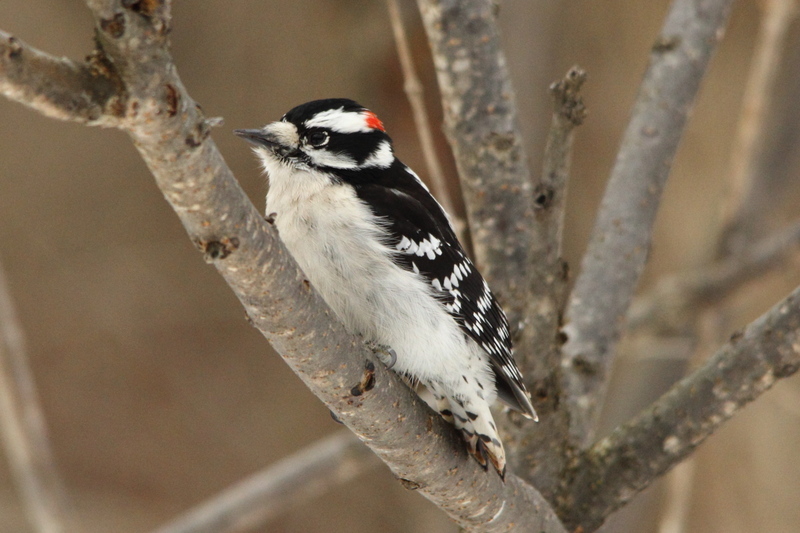 It breeds in eastern North America in southern Ontario and the eastern United States. 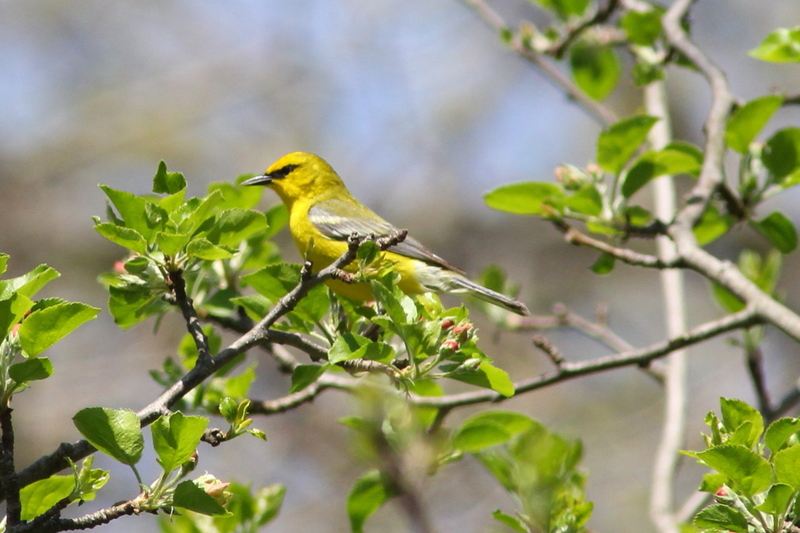 The blue-winged warbler is a small warbler at 11.4–12.7 cm (4.5–5.0 in) long, with a wingspan of 17–19.5 cm (6.7–7.7 in). 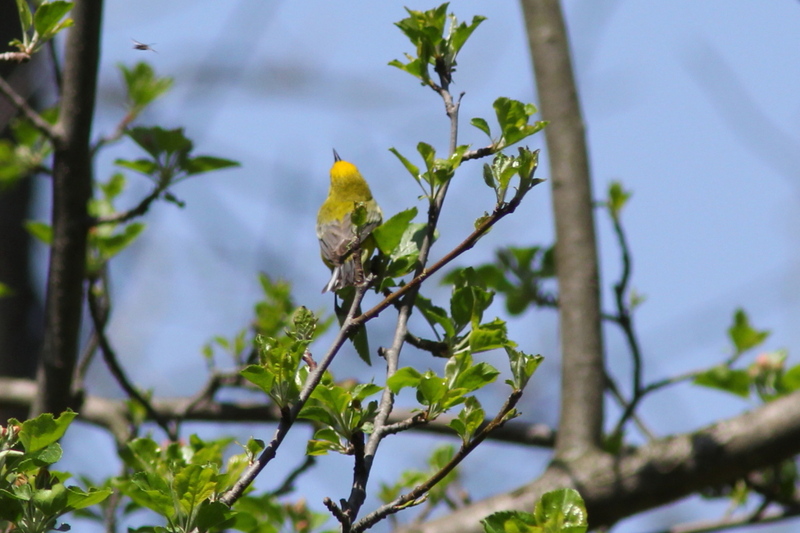 The breeding plumage of the male consists of a bright yellow head, breast and underparts. 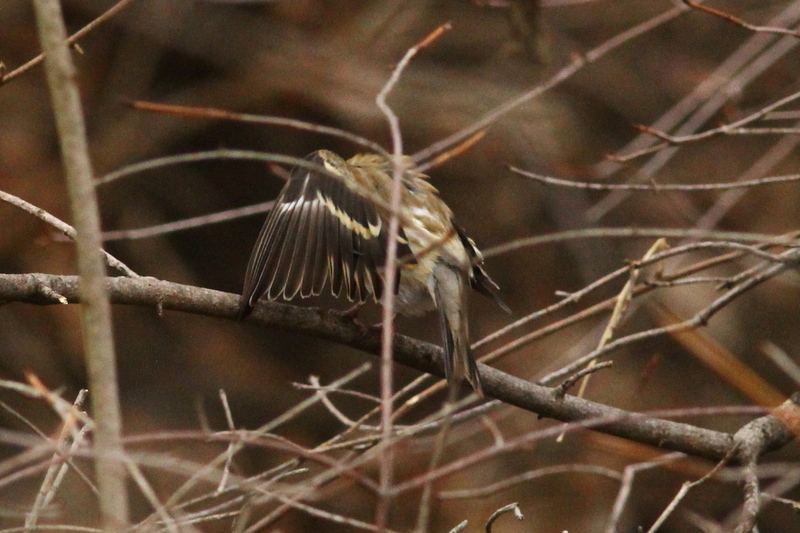 There is no streaking of the underparts of the bird. 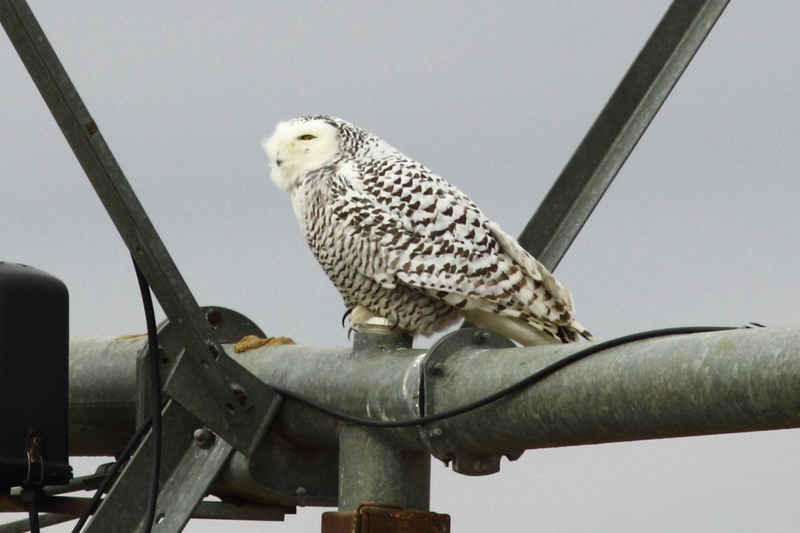 It has a narrow black line though the eyes and light blueish gray with two white wing-bars, which are diagnostic field marks. 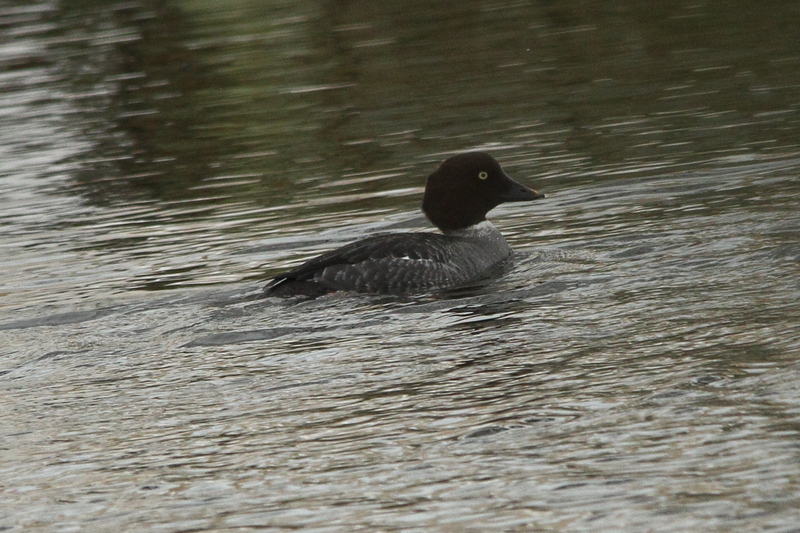 The female is duller overall with less yellow on the crown. 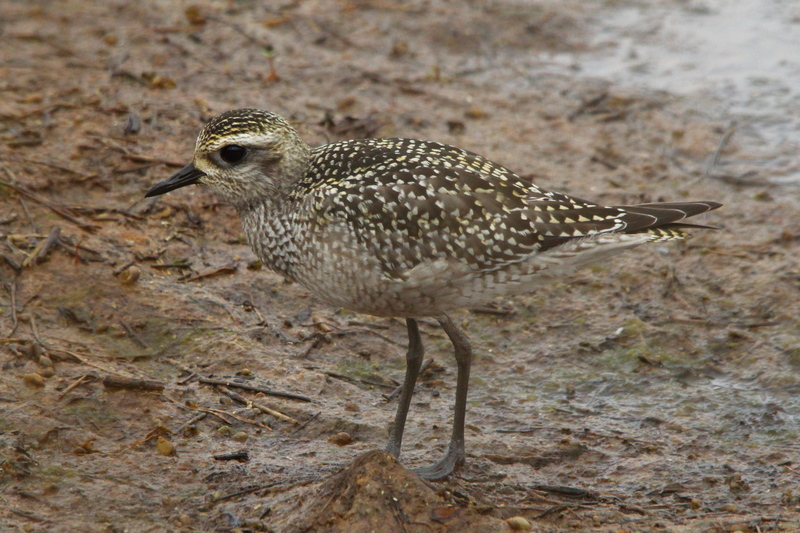 Immature of the species are olive-green with wings similar to the adults. 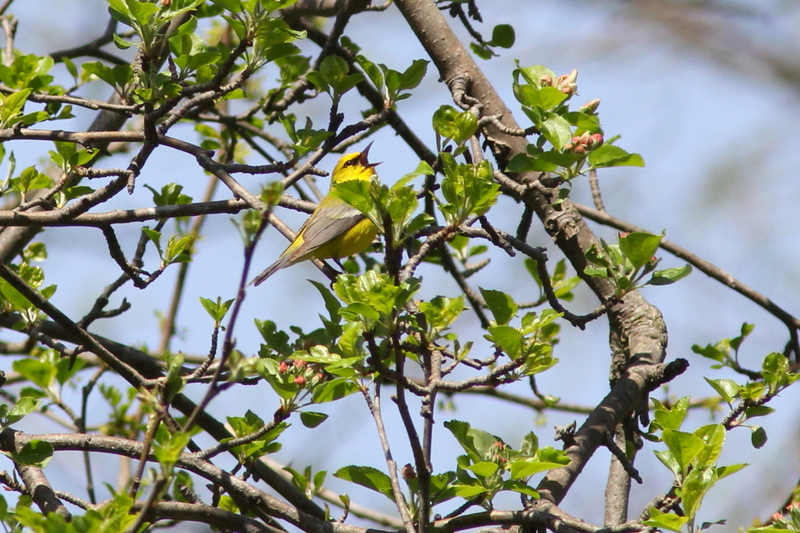 Blue-winged warblers are migratory New World warblers. 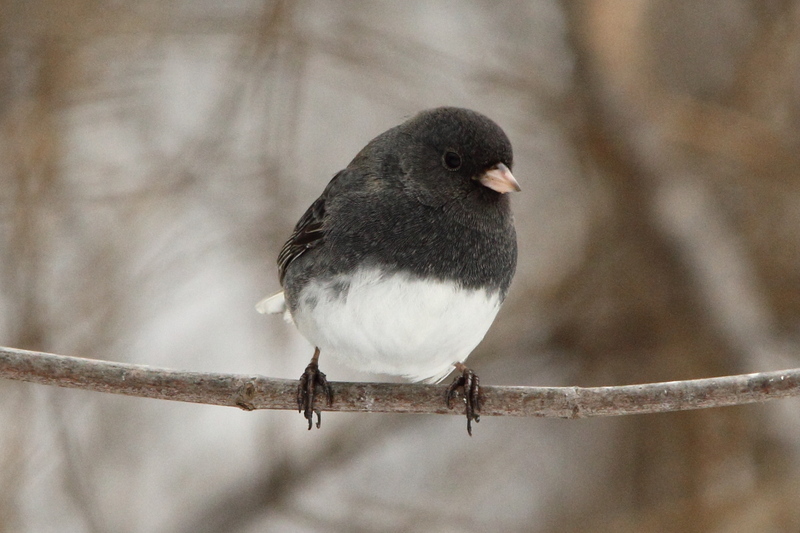 They winter in southern Central America and breed from east-central Nebraska in the west to southern Minnesota, Wisconsin, Michigan and southern Ontario in the north to central New York, southern Vermont, southern New Hampshire and New England to the east, south to western South Carolina, northern Georgia, northern Alabama, eastern Tennessee and southern Missouri. 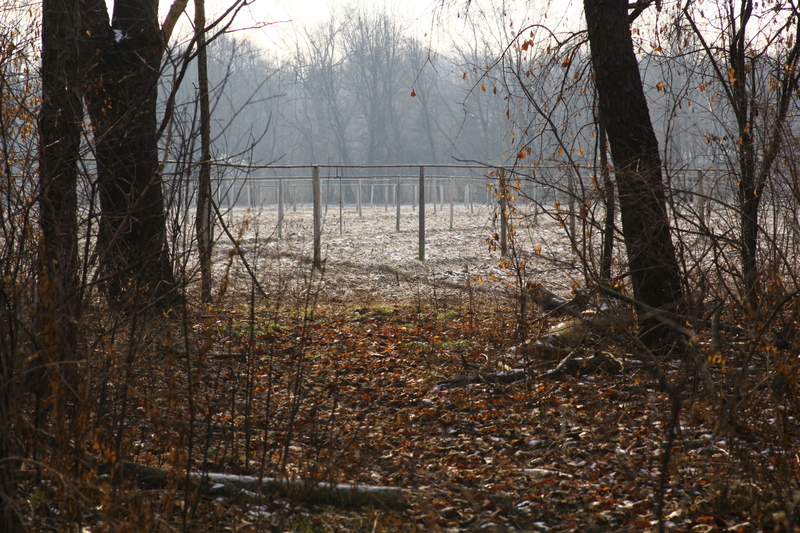 The breeding habitat is open scrubby areas. 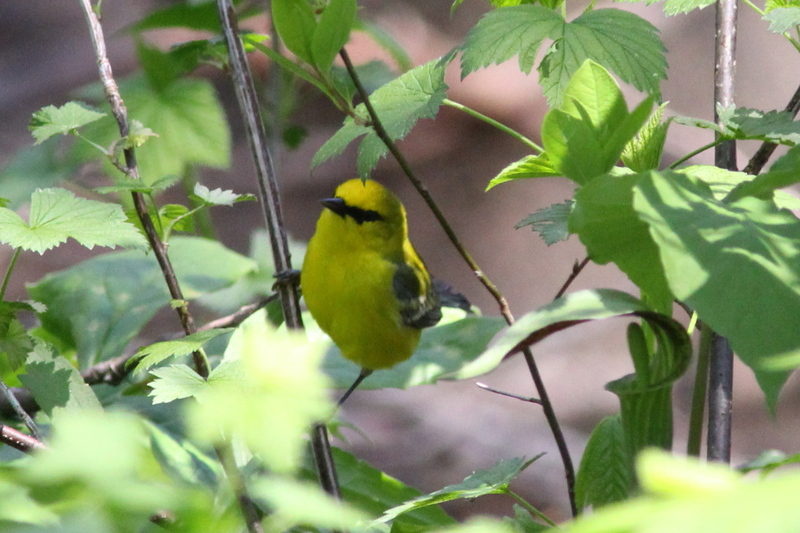 Blue-winged warblers nest on the ground or low in a bush, laying four to seven eggs in a cup nest. 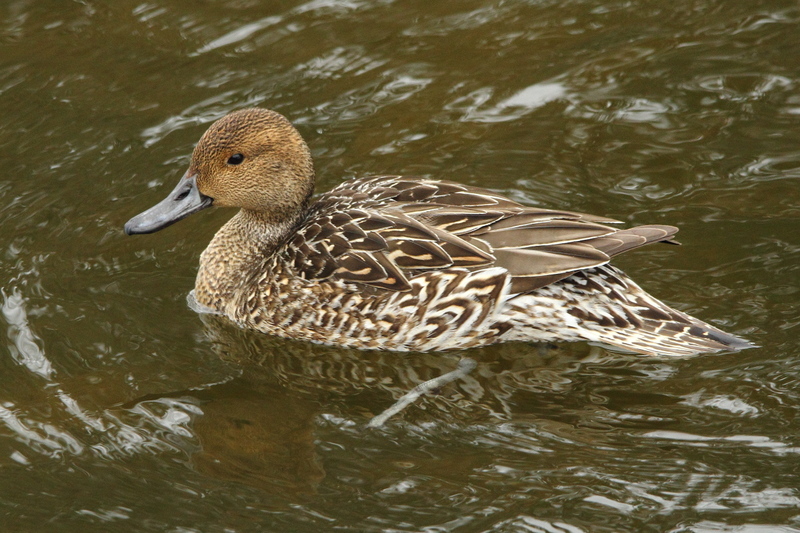 The females incubate the eggs for 10–11 days. 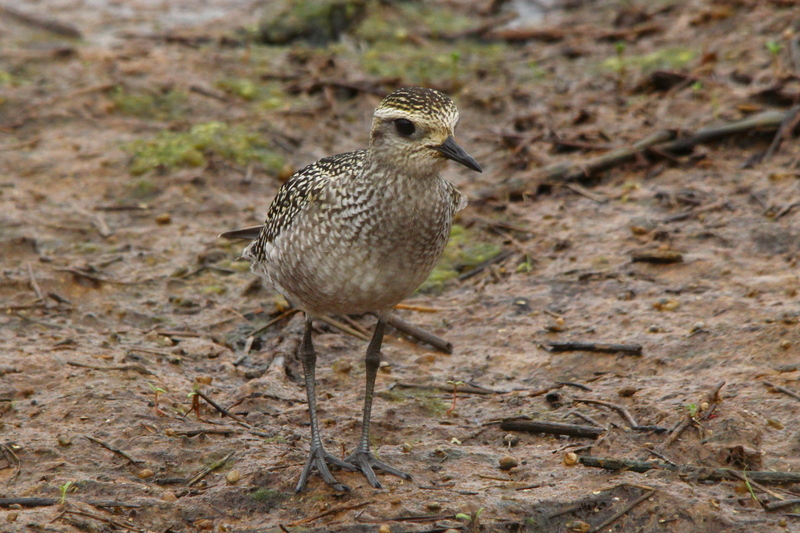 The young fledge in 8–10 days. Their diet consists of insects, and spiders. I’ve since shot better photos of this species in the spring of 2018, and here’s a few of them. This is number 170 in my photo life list, only 180 to go! One of the many things that I like about my new job is while I may not have time to walk everyday, when I do have time, it is usually early in the morning. I love being out at dawn, always have, even when I was a kid. If you were to go back and read posts from when I’ve been camping, you’d find out that most of the time, I’m up well before sunrise, and I’ve finished my coffee for the morning about the time the sun begins to appear over the horizon. It’s definitely my favorite time of the day, the night and diurnal critters are on their way home to sleep, and the daytime critters are just waking up and becoming active. Much the same happens around sunset, but in the opposite direction. Besides, sunsets fade to black, and that has a sense of finality to it, another day done. 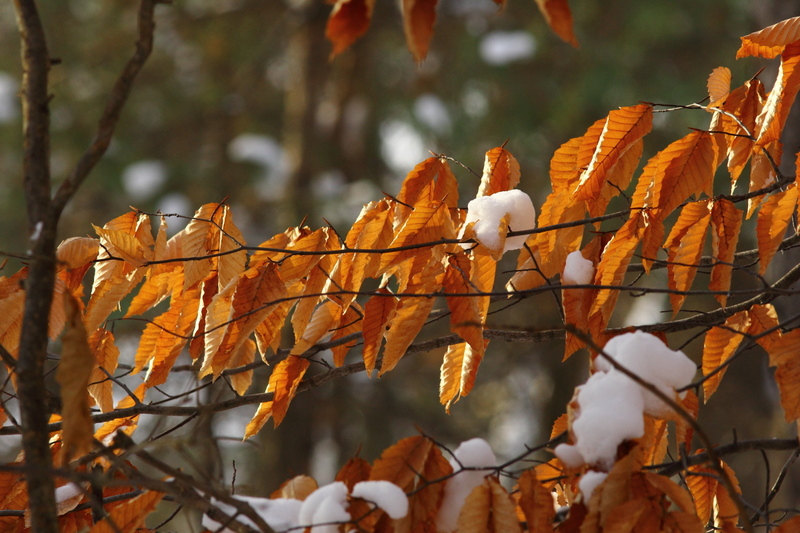 Maybe that’s why I prefer spring over fall, despite the colorful fall foliage, it’s the promise of a new year and new life, while fall fades into winter. Anyway, because of my schedule, I’ve been able to get outside for my walks as early as there has been enough light to shoot photos of subjects other than the sunrises themselves. 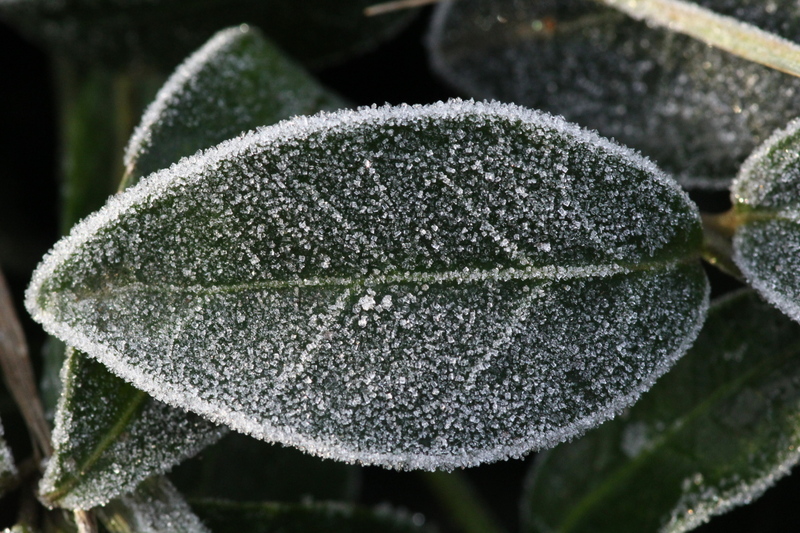 Even though December was slightly warmer than average, that often meant that most of the world outside my door has been covered in frost. 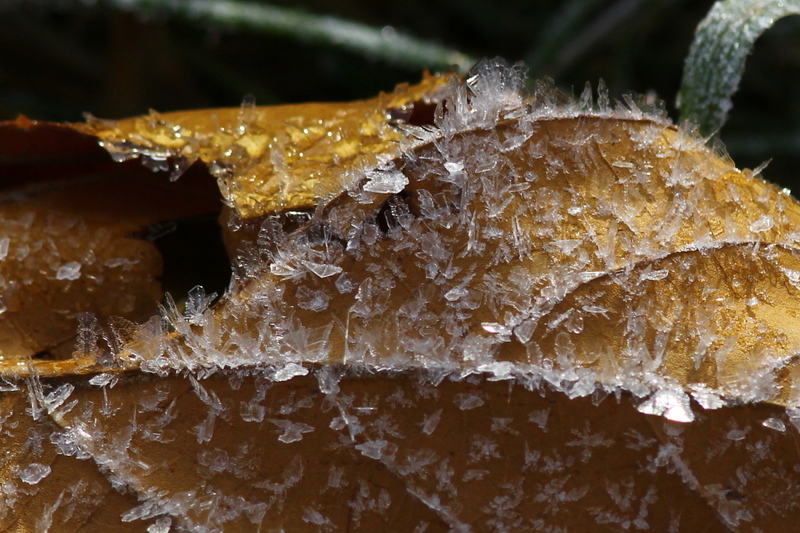 That was shot on the same morning as the ice crystals on the British soldier lichen from the last post. 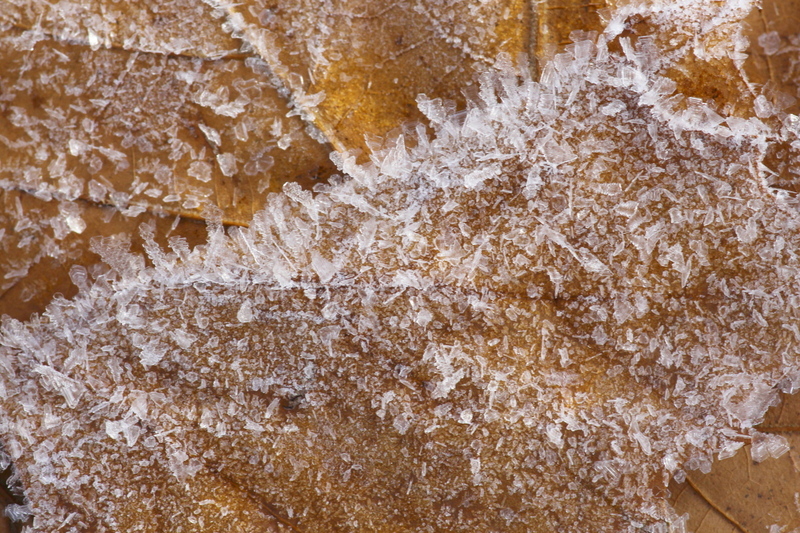 In my defense, the frost that I saw close to home wasn’t very impressive, it wasn’t until I got to the local park, where there was standing water around that I saw frost worth taking the trouble to photograph correctly. 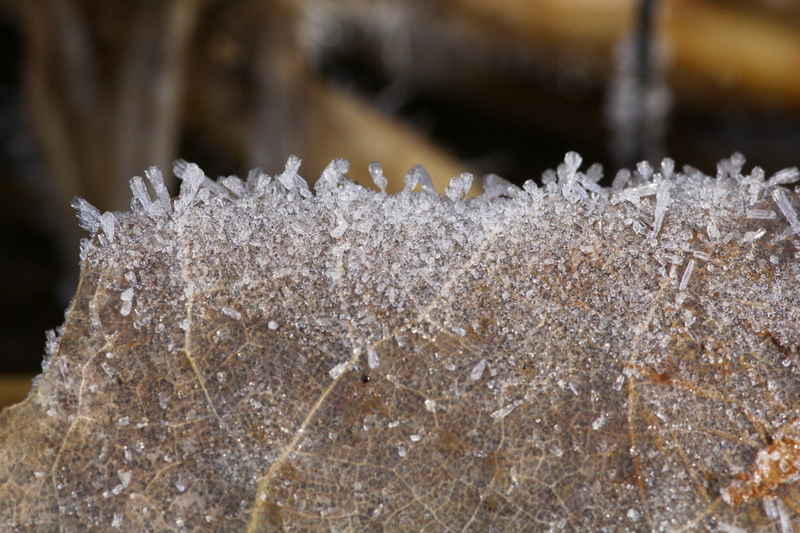 I considered coming home for the tripod, then driving to the park to shoot photos, but by then, the frost was beginning to melt anywhere that the sun hit it. 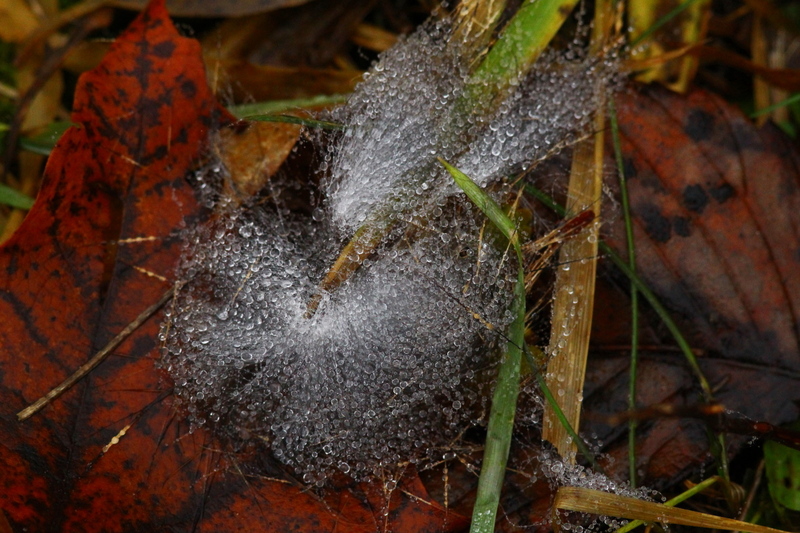 And, while there were a few frosty mornings, I learned that trying to photograph frost on cloudy days doesn’t produce great photos. 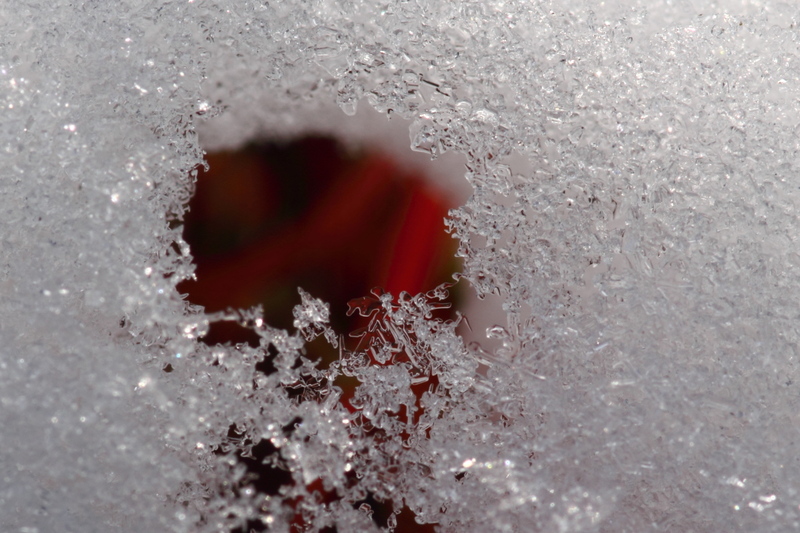 At least for me, there has to be some sun to make the ice sparkle, or it isn’t worth shooting. 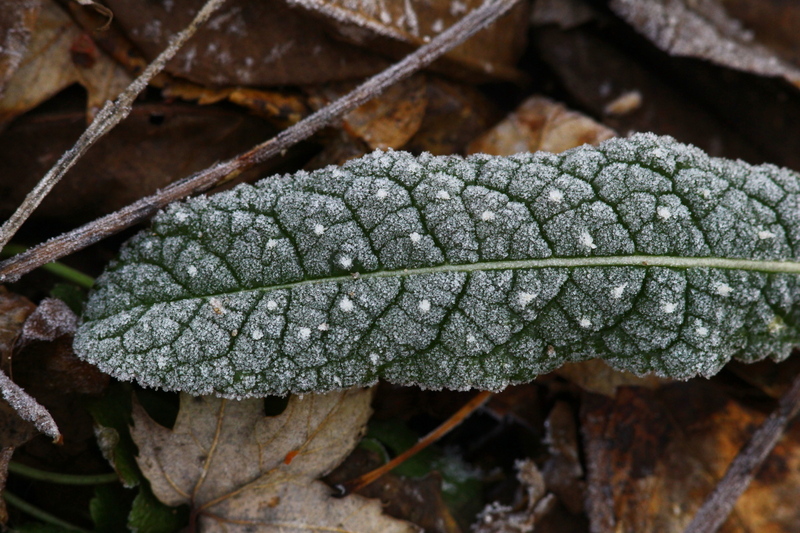 So, most of the photos that I’m about to bore you with were all shot on one sunny morning as I ran around like a madman, looking for the best examples of frost before the sunshine melted it away. 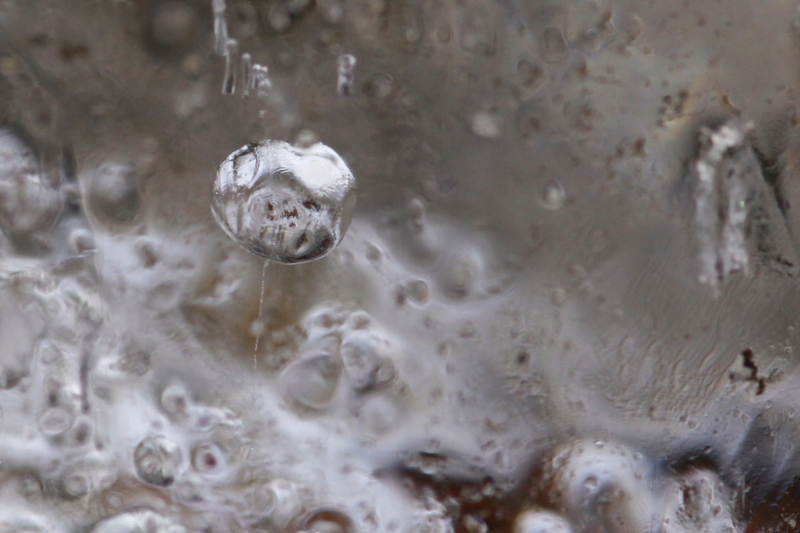 The closer that an object was to standing water, even just a puddle left from rain, the larger the ice crystals had grown. 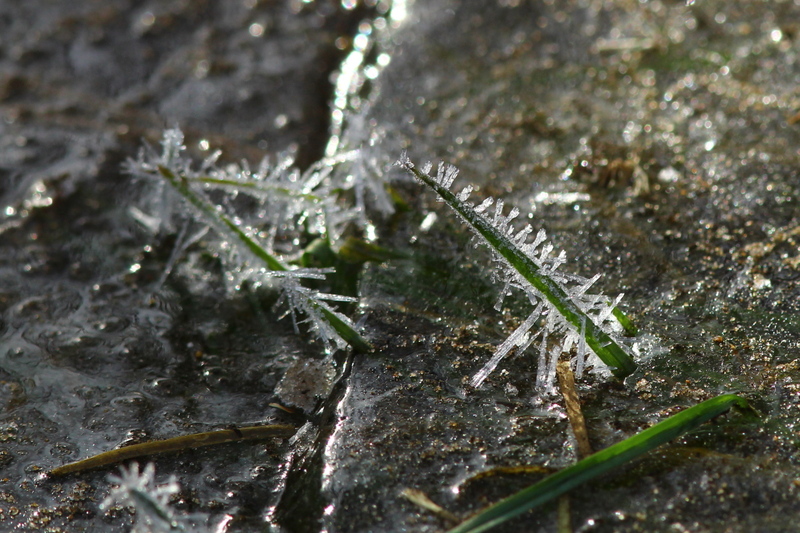 As you can see here, the stalks of grass lying just above a puddle had the largest ice crystals. I lay down on my belly, trying to get closer, but that only helped a little. 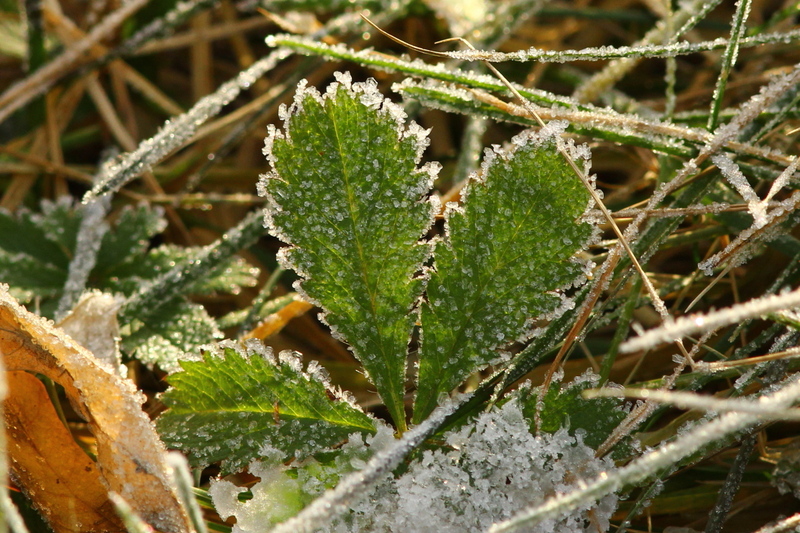 So, here are a few of the other frosty images that I have to share with you. …that didn’t stick around very long at all. Here’s a nothing photo that I’m kind of proud of. 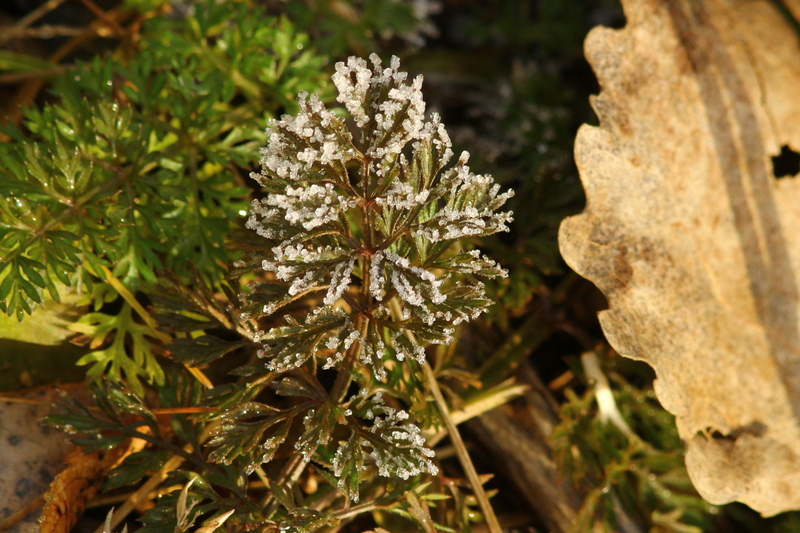 I saw the dead remnants of a Queen Anne’s lace flower, and took several photos, making adjustments all the time to get a good image. In my first attempts, I had the lens stopped down too far, and you could tell that there was a fence in the background. 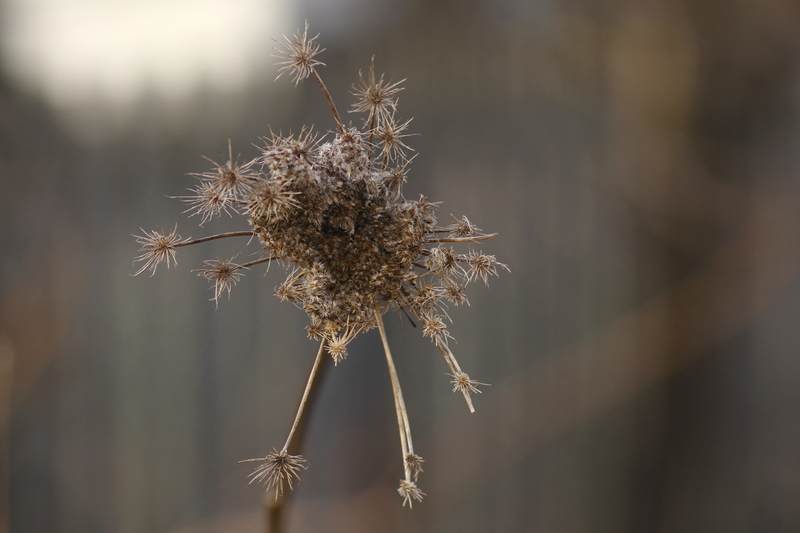 I kept opening up the aperture until I got all the flower head in focus, with everything else blurred. Then, I noticed that the center was too dark, so I dialed in the flash for this one. 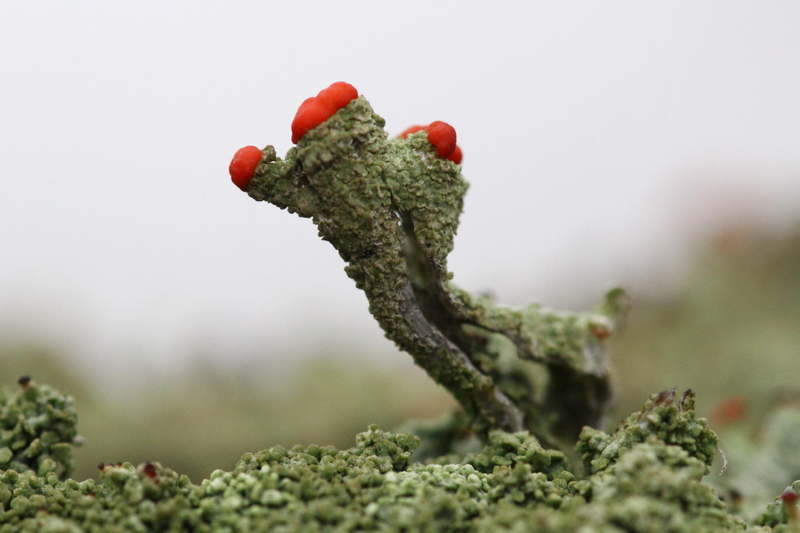 That one, and this one, were both shot as I looked for more of the lichens with ice crystals. I like this one because it does look like a British soldier, complete with arms and legs. 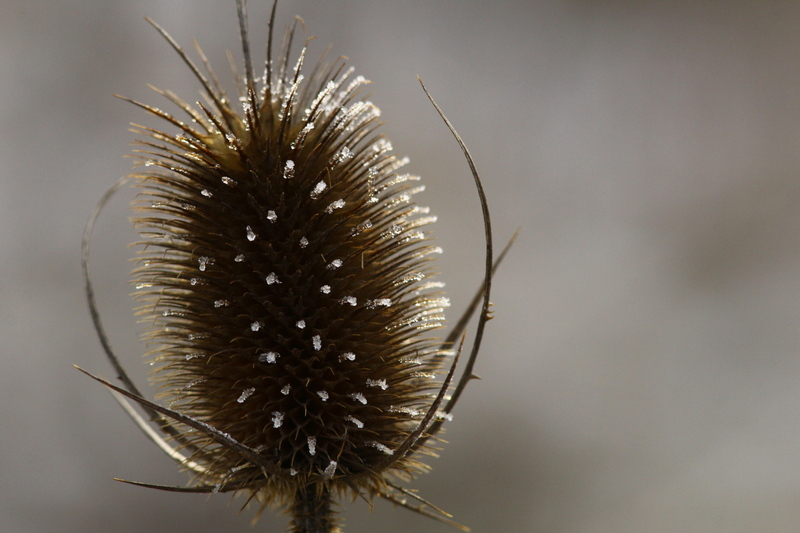 Since it was sunny, and all the frost had melted by then, I went looking for other things to shoot with the Tokina macro lens, as I was having fun with it. 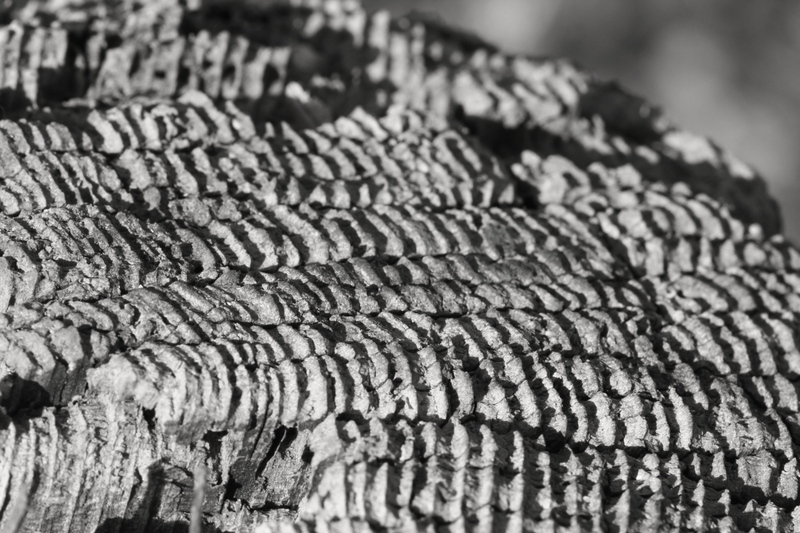 Images with patterns are usually good candidates for B&W photography, but I didn’t like the B&W version of that stump, this one was better. 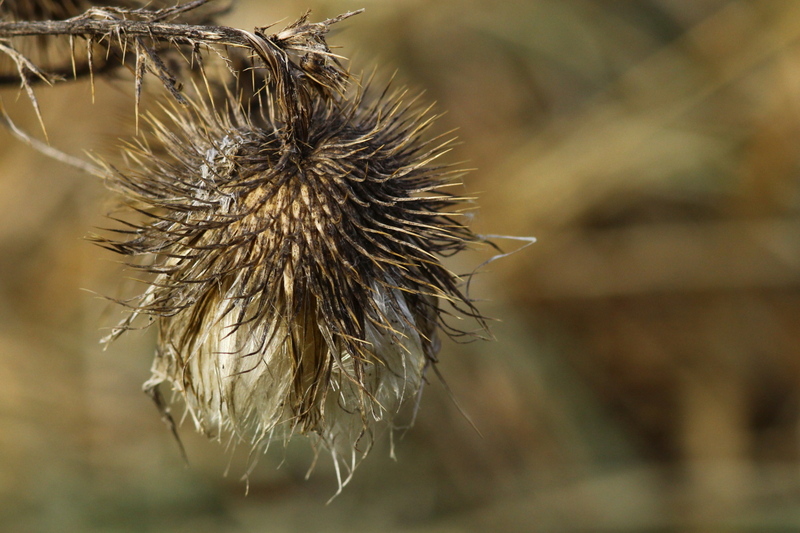 And, I couldn’t resist this thistle seed head. I was almost back home when I found a block of ice in the trail, where it came from, I have no idea, and it wasn’t there as I was outbound. 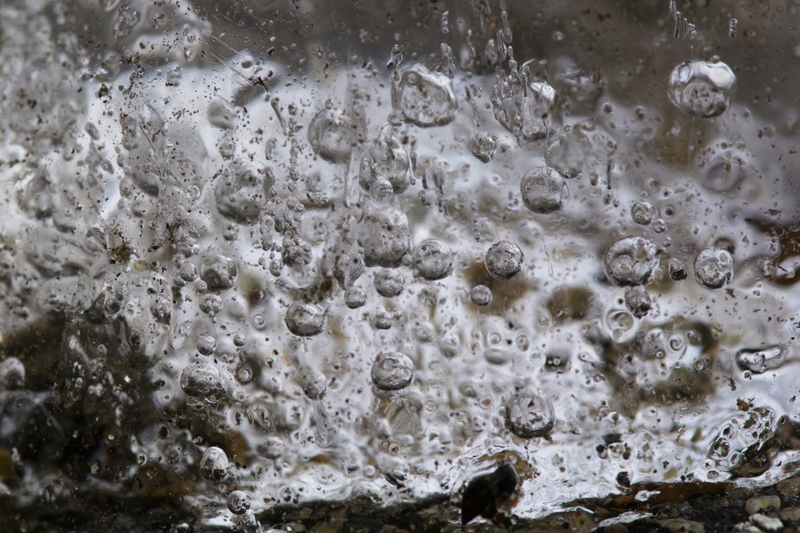 But, by laying on the ground and getting close, I was able to photograph the bubbles of air trapped in the ice. 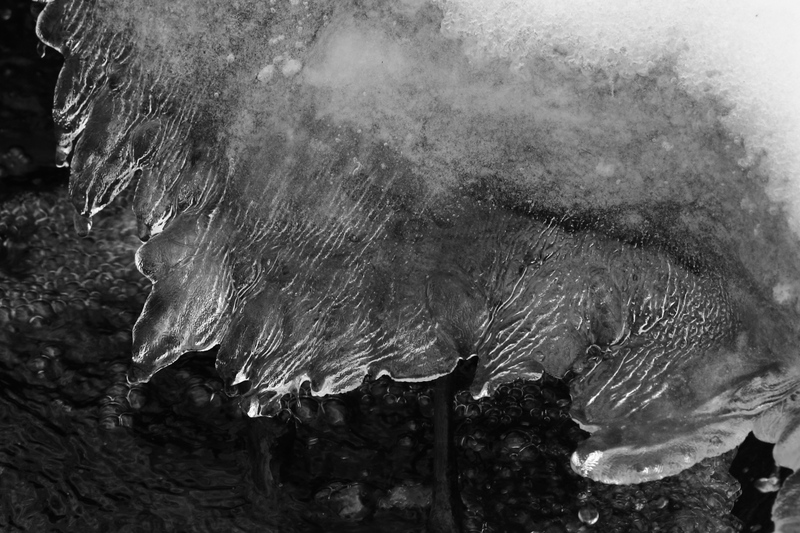 By changing how far into the block of ice I focused on, I could get different patterns completely. 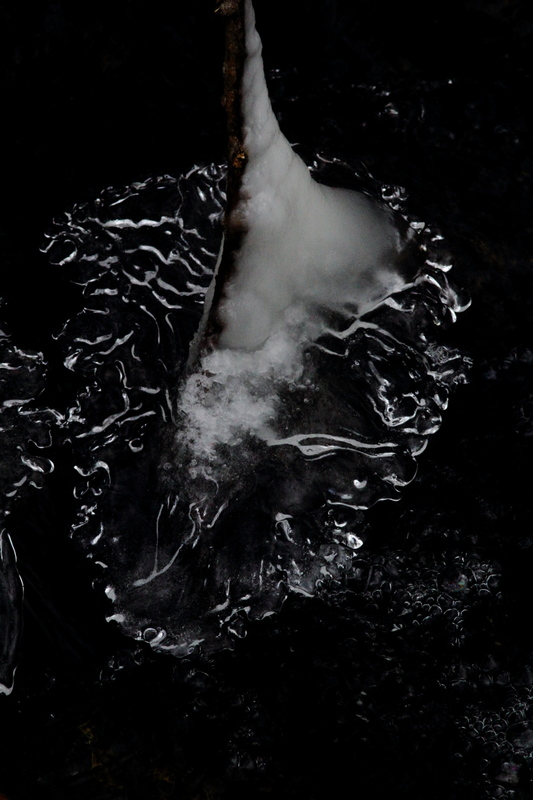 And, by shooting with the block of ice between the sun and myself, and focusing on the surface of the ice, I got this abstract. 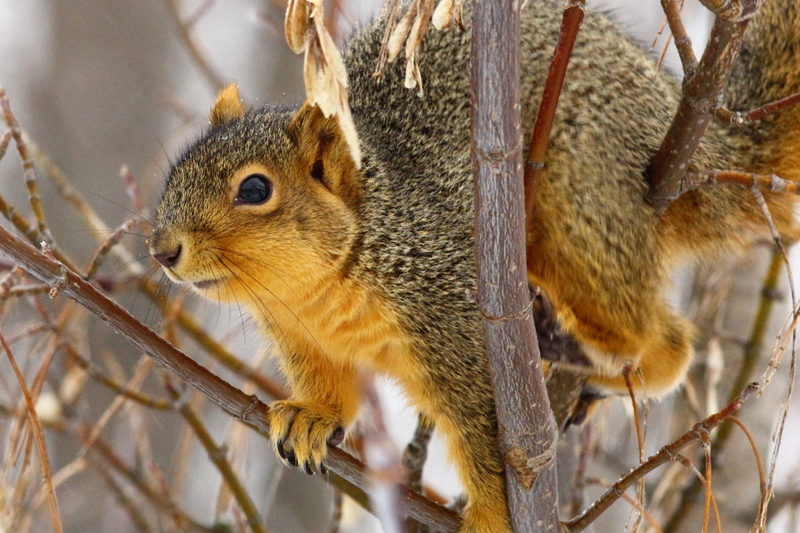 I see that I haven’t included a shot of a squirrel yet, and several readers like my squirrel portraits, so here’s one for them. Now then, I need something of a challenge for Allen. Not that it matters, by I tried photographing that with several different lenses and techniques to get everything in focus, for that one I used my 15-85 mm lens and the on camera flash. Here’s the top of the same stuff. 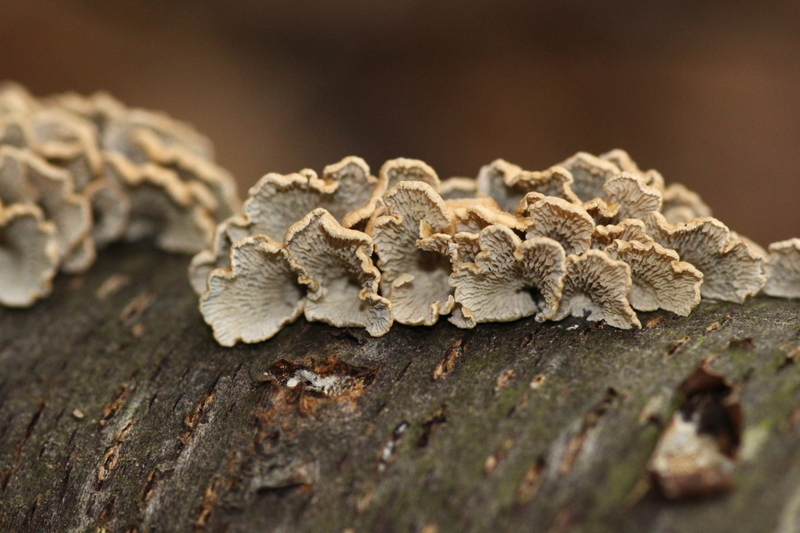 I assume it’s some type of shelf fungi, but I’m probably wrong about that. 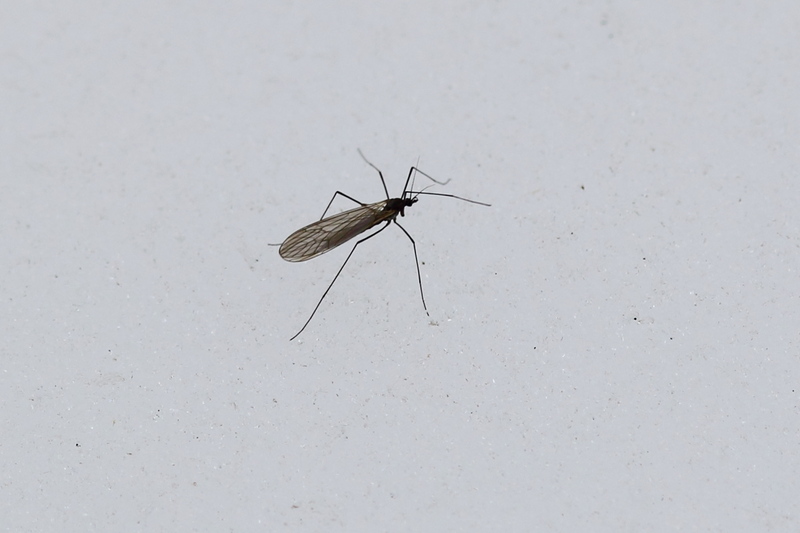 I’m also probably wrong in thinking that this is a crane fly that I saw on the bottom of the stuff. Okay, if I hard an extremely difficult time getting that photo. It doesn’t look like it, but it was a very dark day. If I used the flash, then, I didn’t get the colors in the insect’s wing. 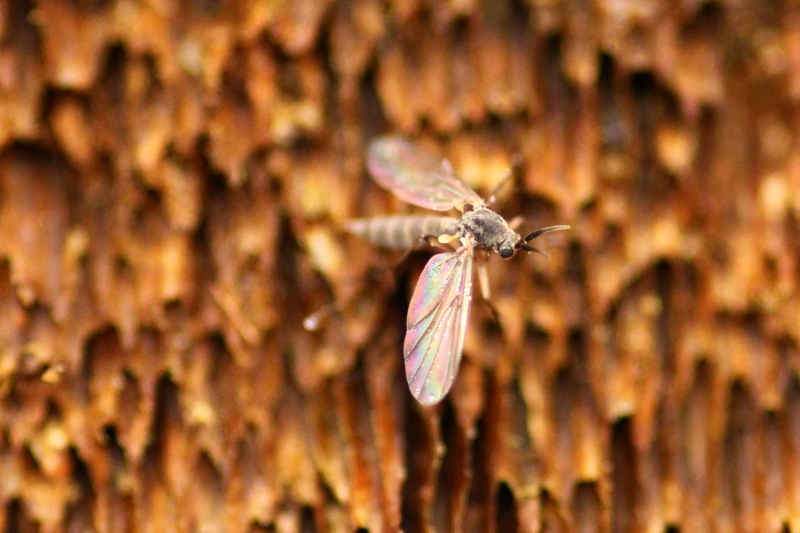 Without the flash, my shutter speeds were way too slow for a sharp image, that’s the best I could do, even opening up the lens until most of the insect was out of focus. 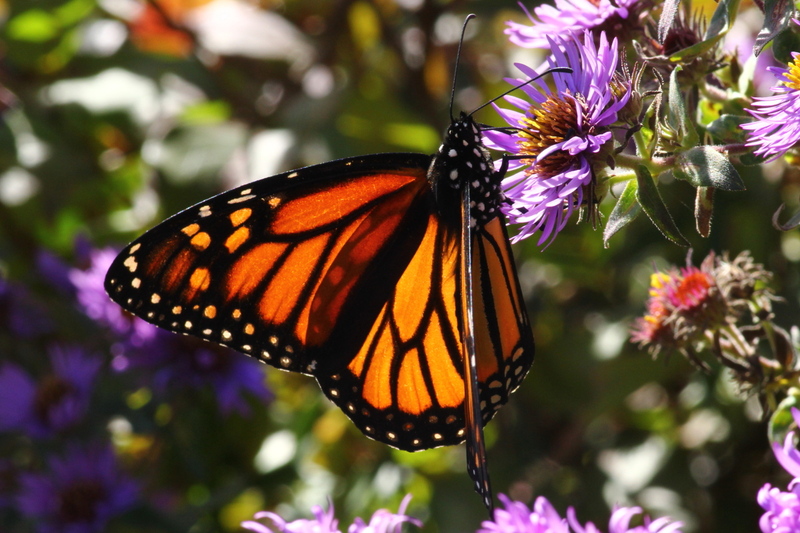 But, with so little light, how did the colors appear on its wings, and why does it matter which direction that you shoot relative to the sun when there seems to be no sunlight? Those are questions that I can’t answer. 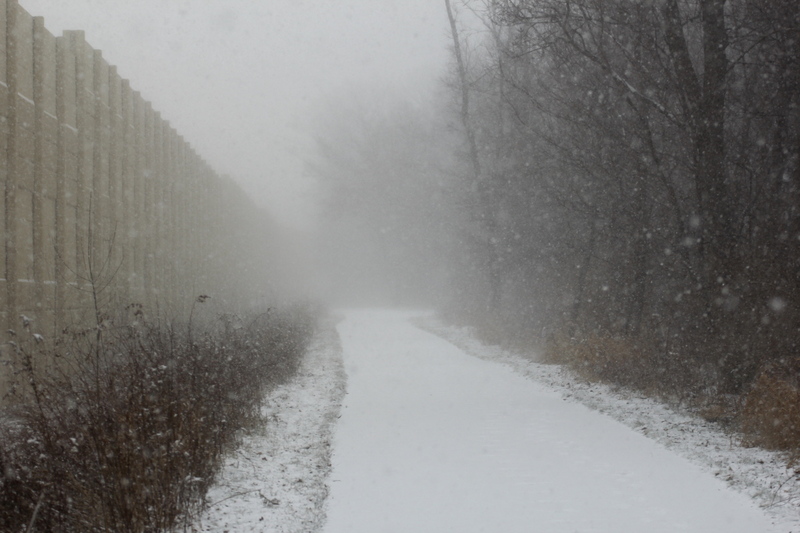 I shot this on a foggy, frosty morning. …but that’s not right either. I want something in between, but couldn’t get it, as I don’t have the patience to wait twenty minutes each time I try to create a HDR image. So, I think that it’s time to order that new iMac, I’ve been looking at. I’ll save you the details, but I think that I can swing it much sooner than I expected. I’ll know for sure soon, like later this weekend. 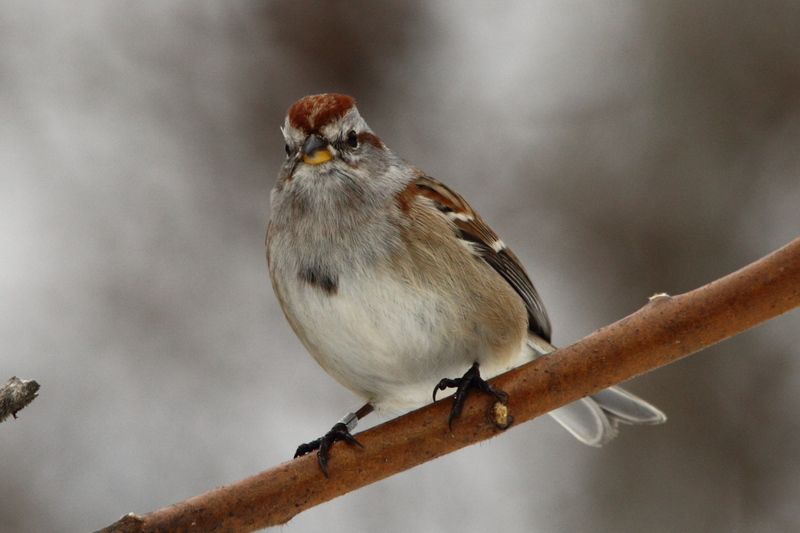 …I said good bird photos! That early morning light sure is special! 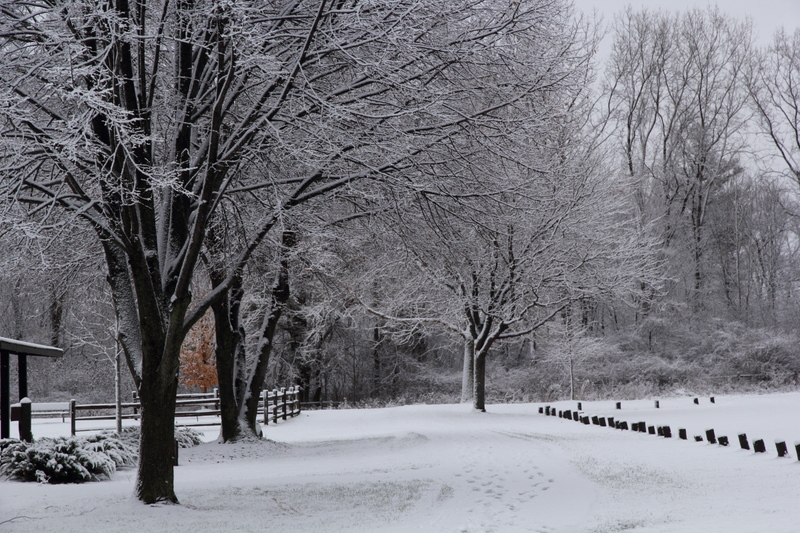 I just wished that there had been more of it, rather than so many dreary days that made photos like this the norm for December. Well, I’m off to the Apple store, wish me luck!